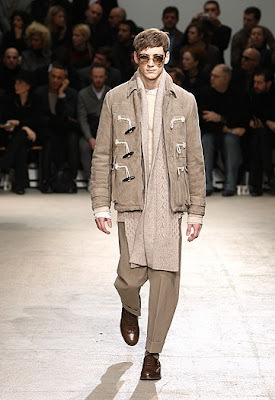 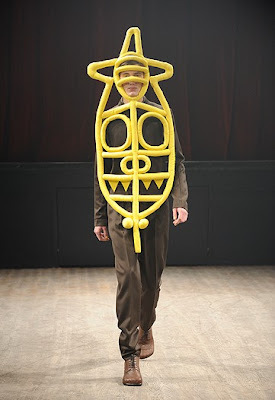 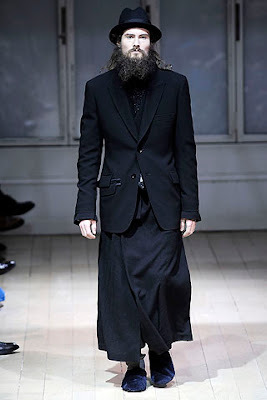 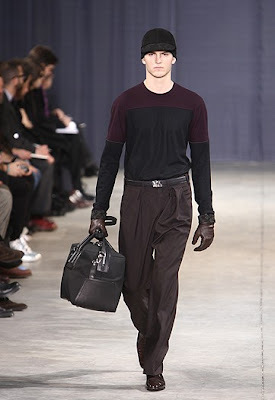 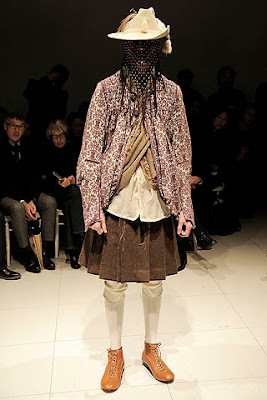 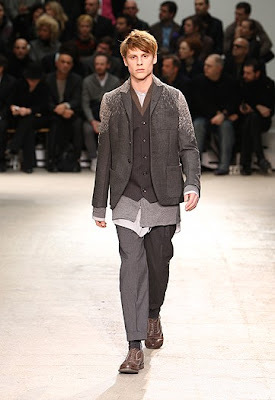 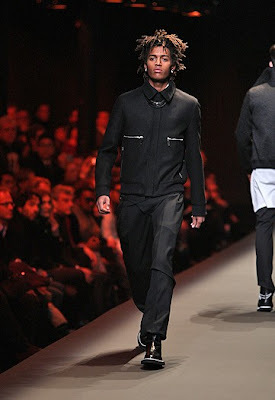 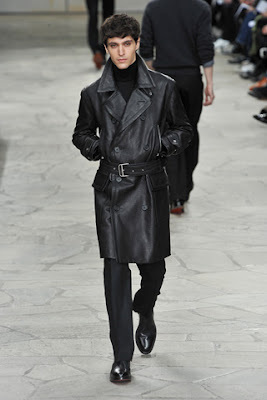 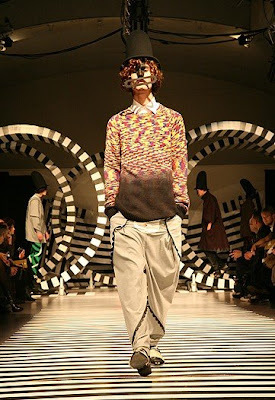 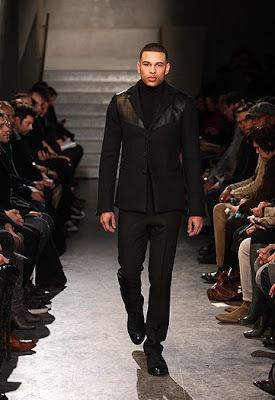 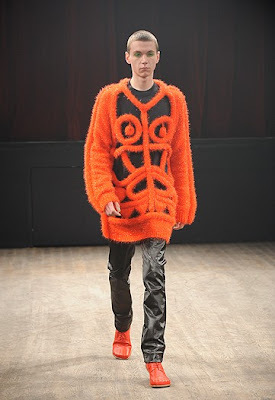 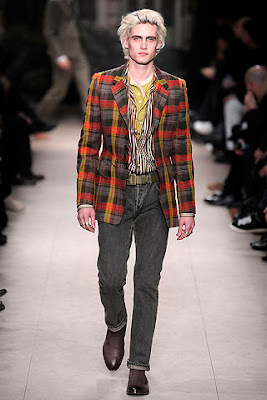 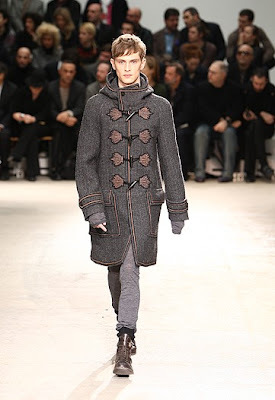 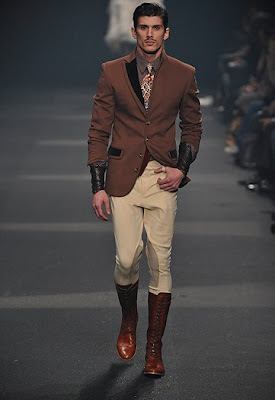 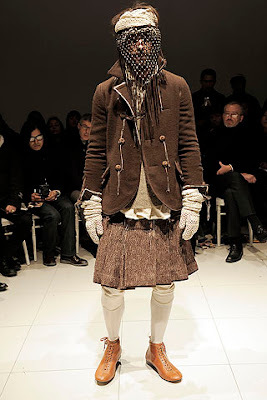 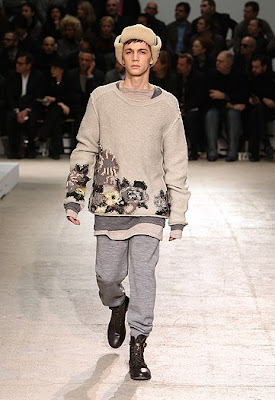 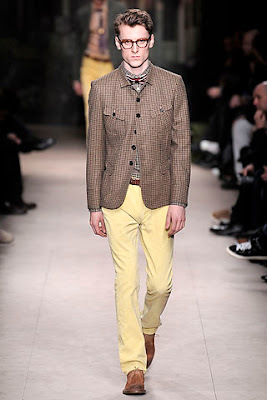 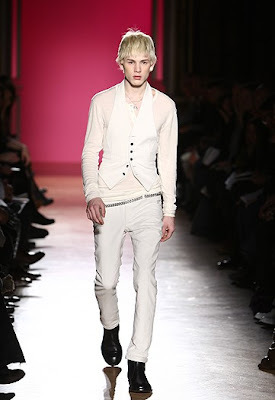 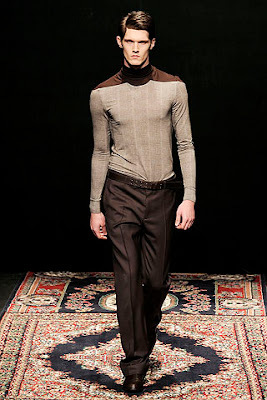 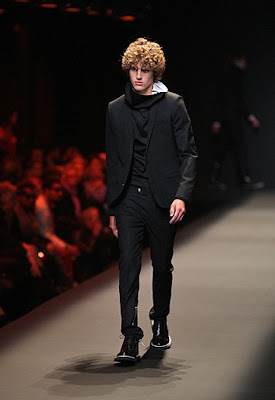 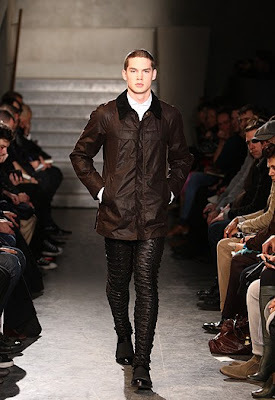 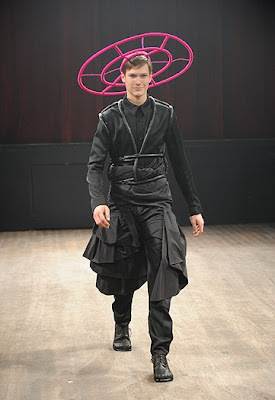 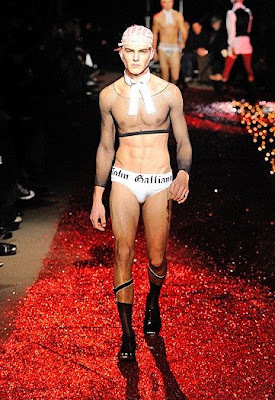 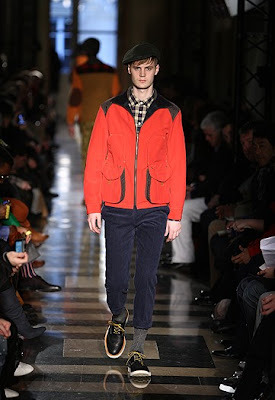 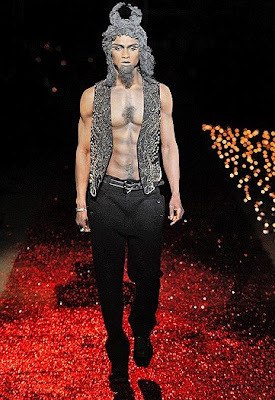 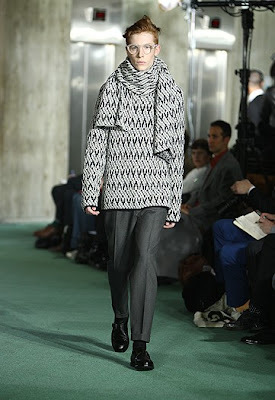 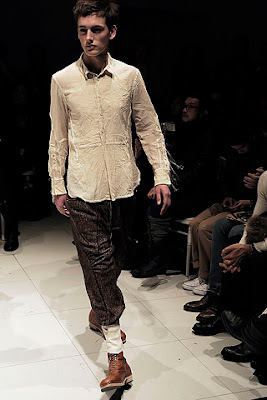 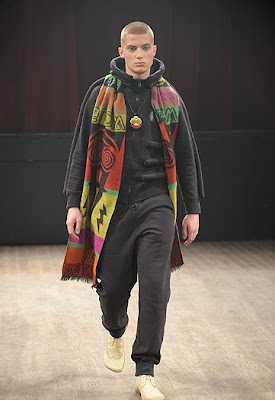 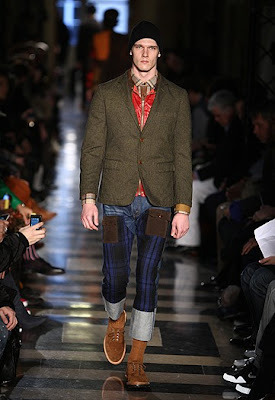 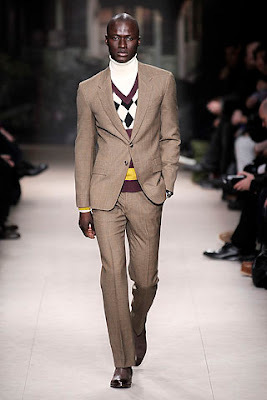 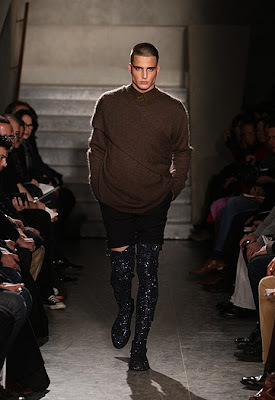 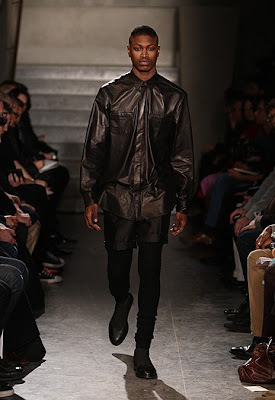 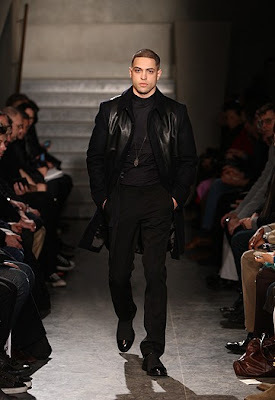 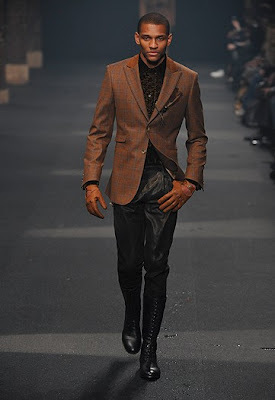 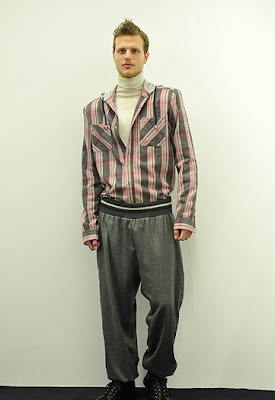 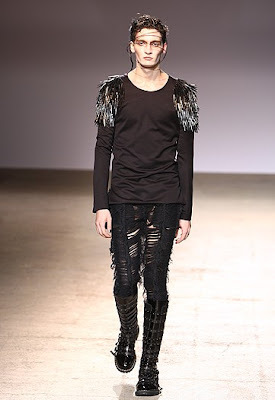 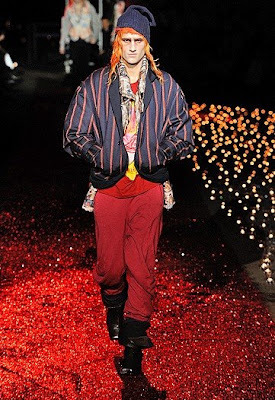 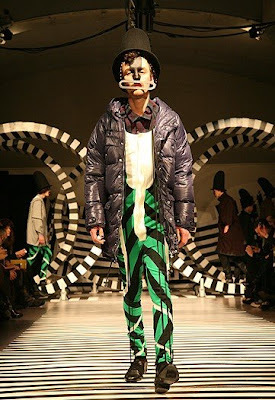 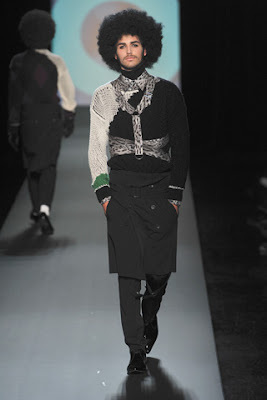 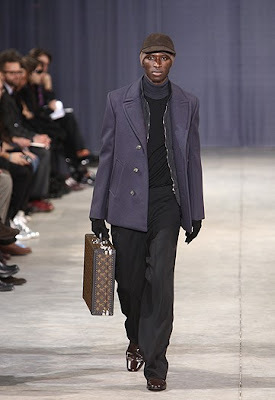 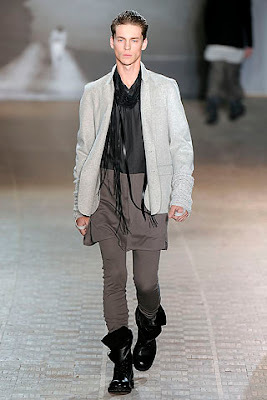 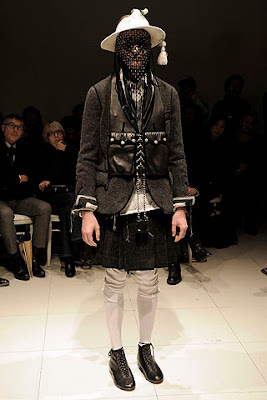 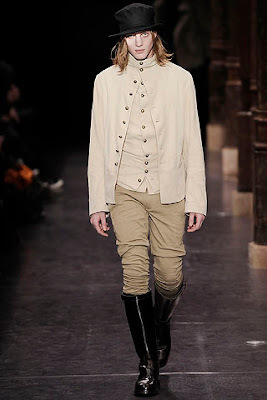 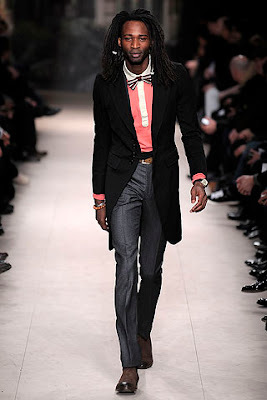 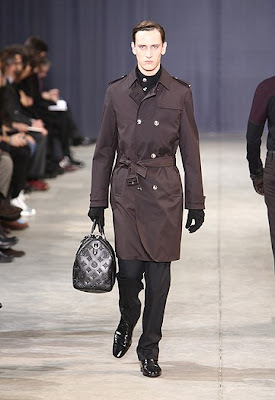 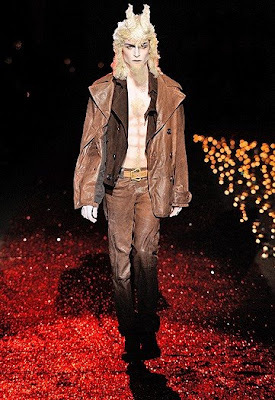 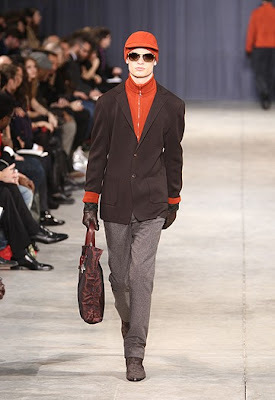 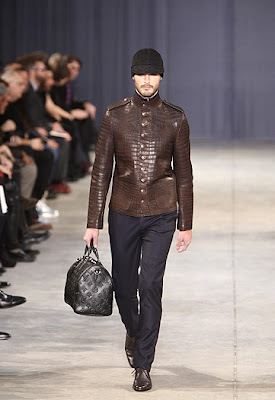 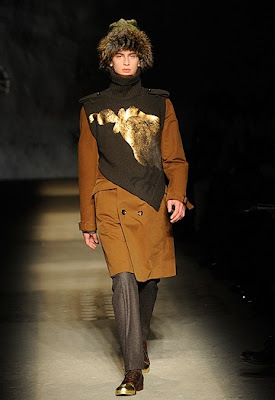 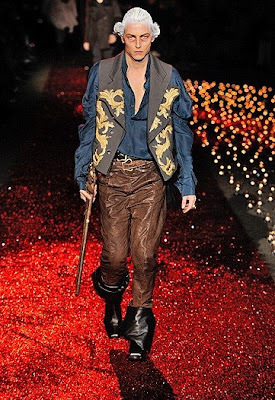 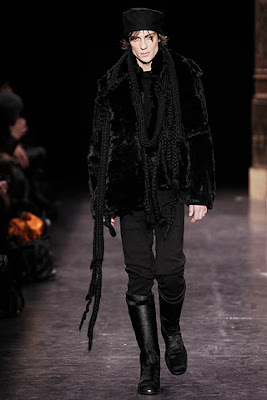 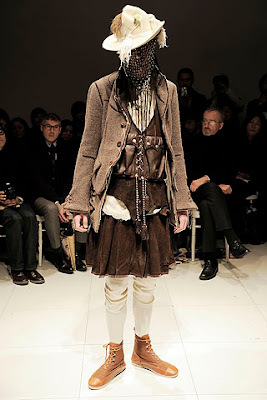 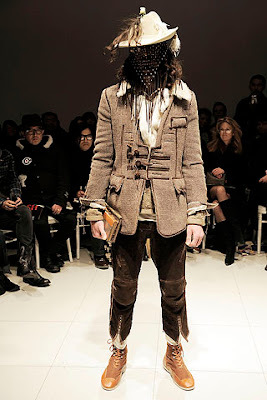 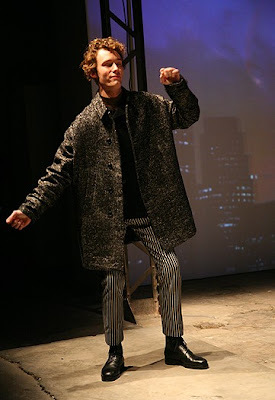 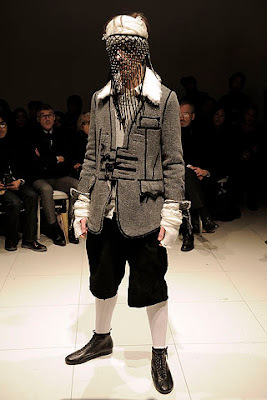 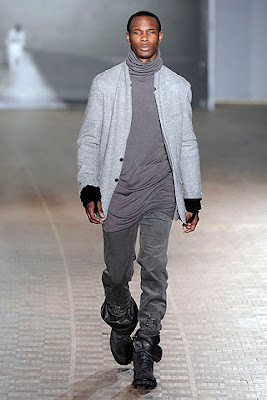 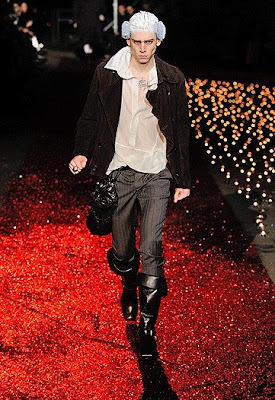 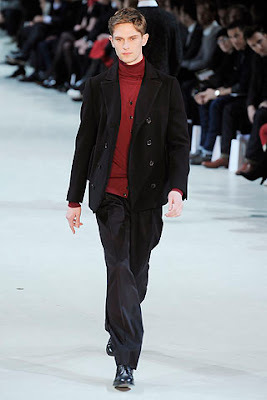 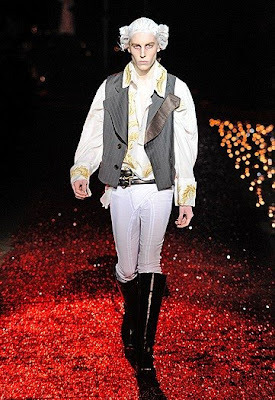 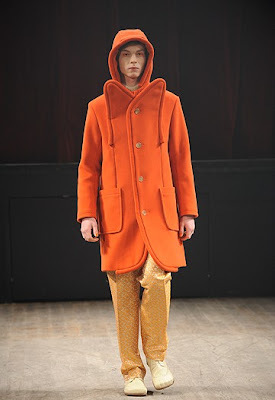 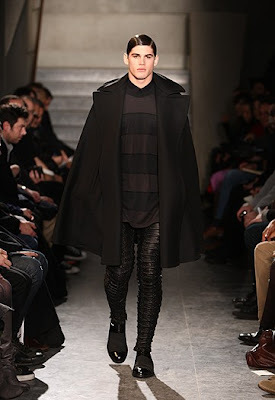 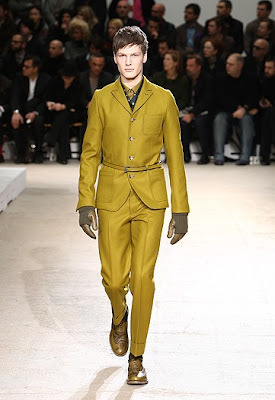 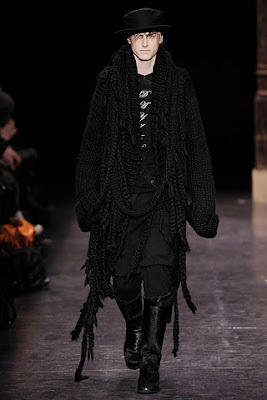 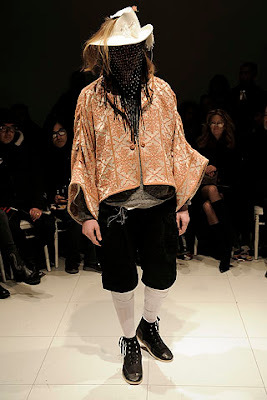 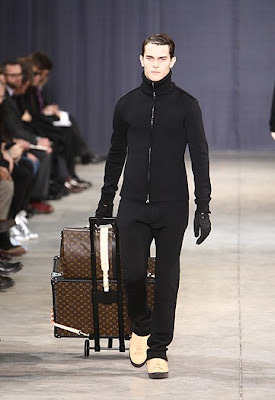 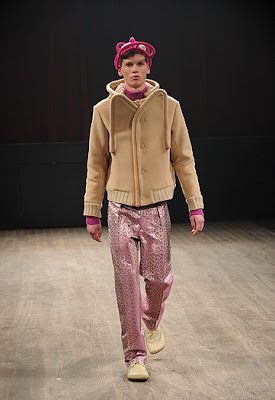 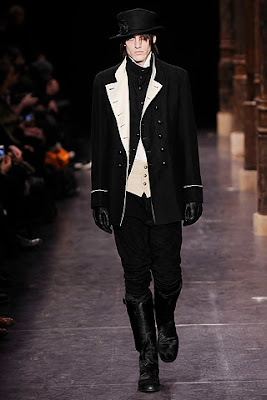 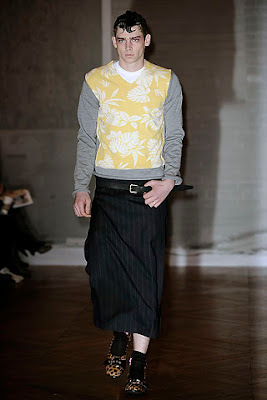 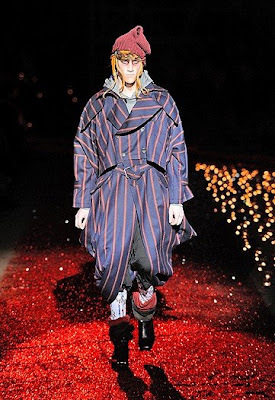 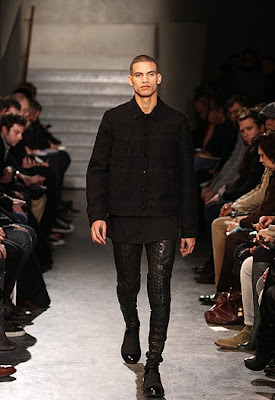 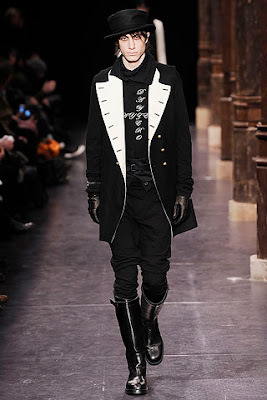 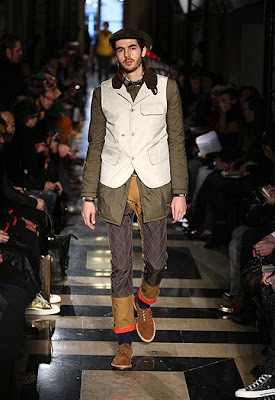 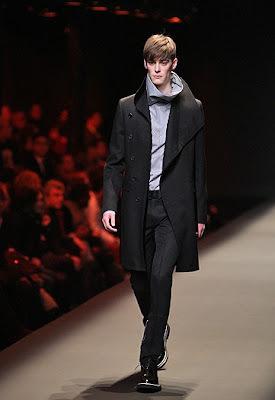 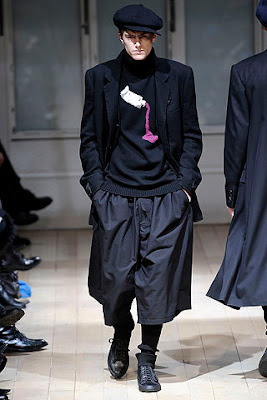 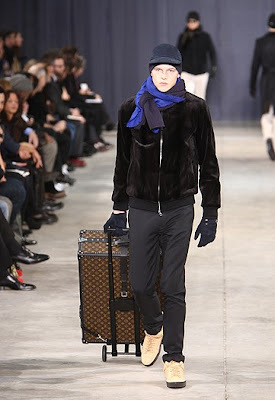 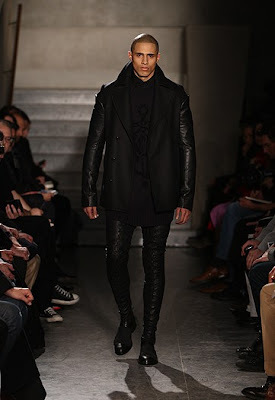 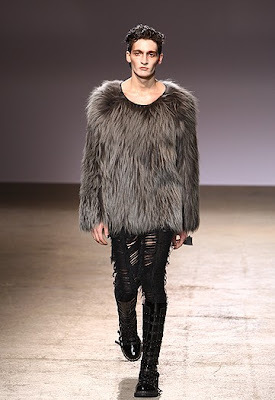 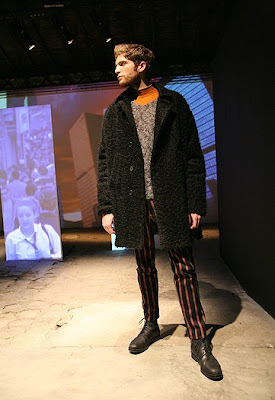 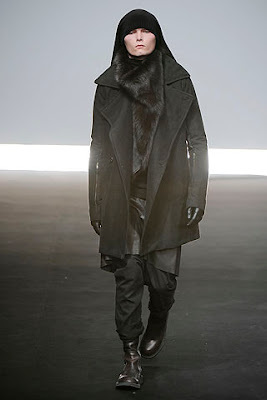 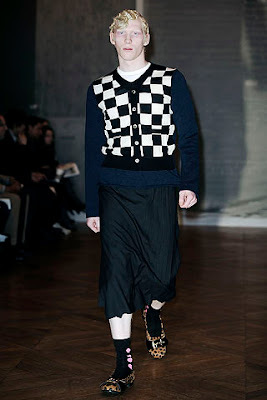 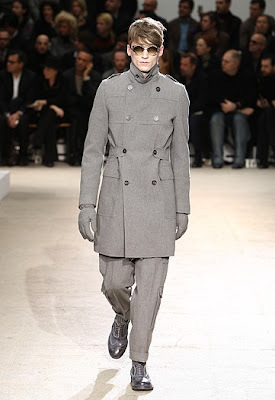 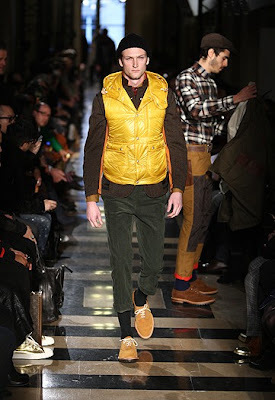 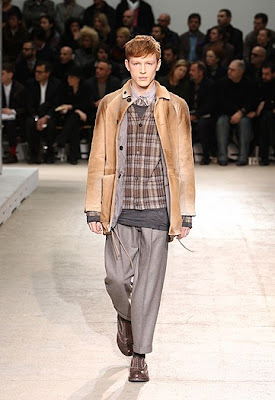 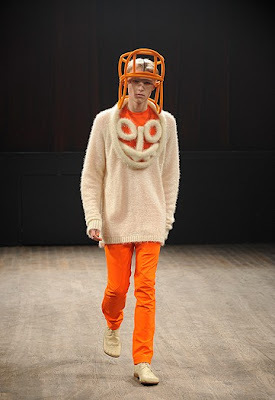 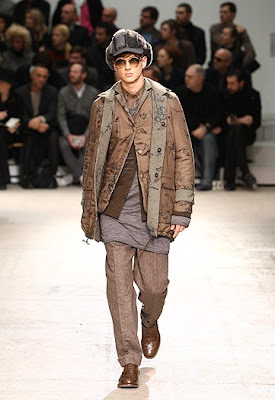 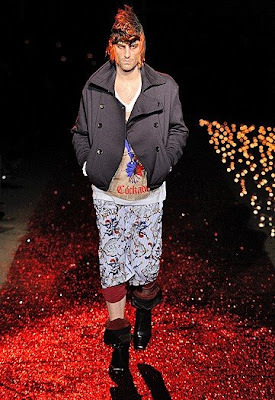 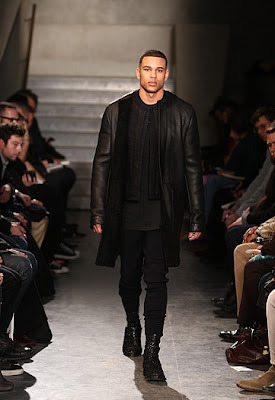 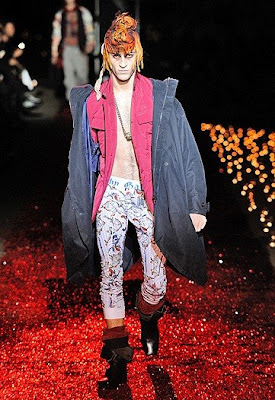 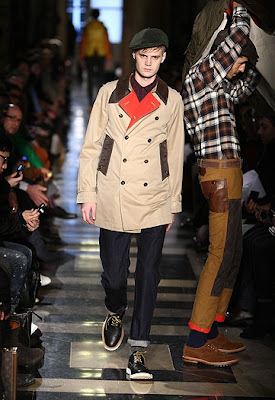 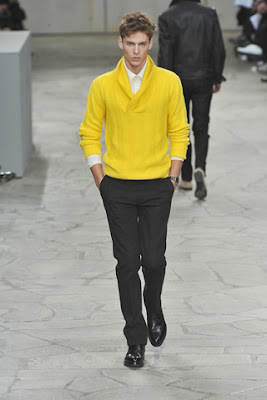 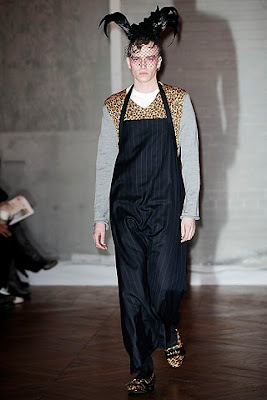 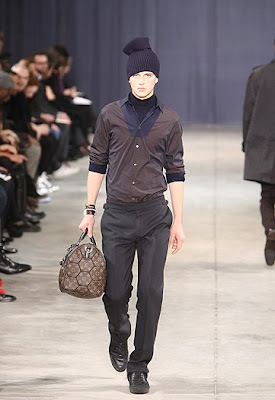 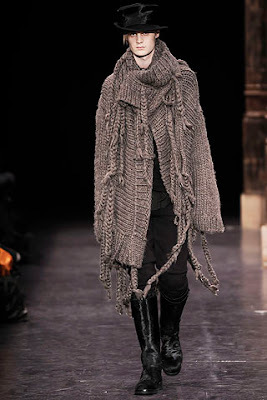 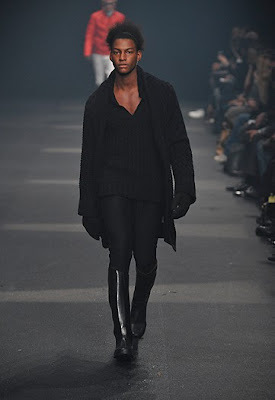 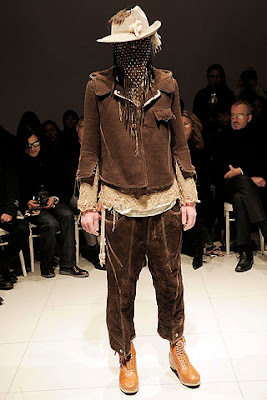 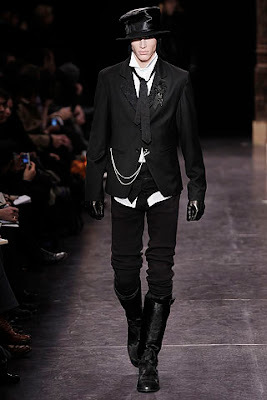 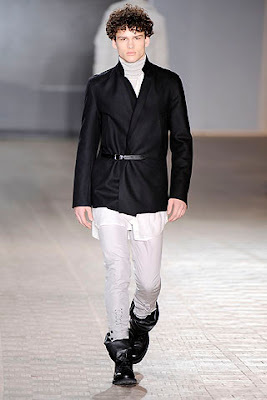 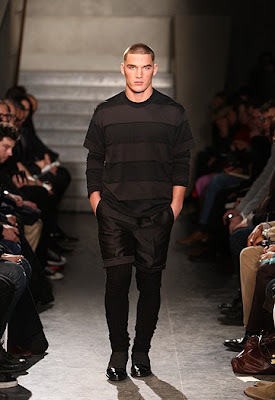 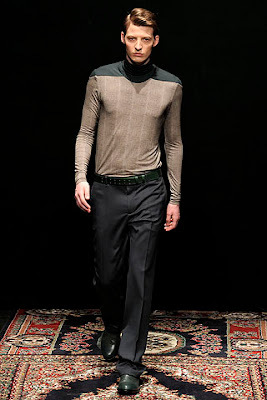 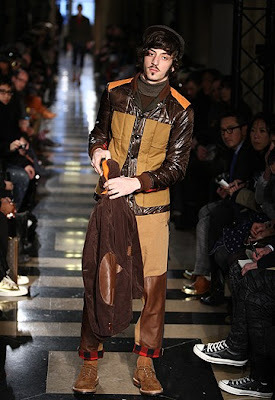 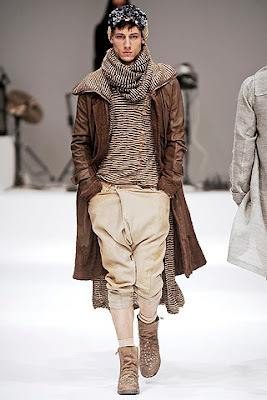 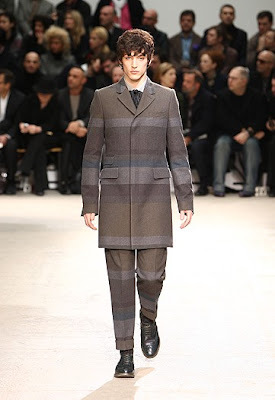 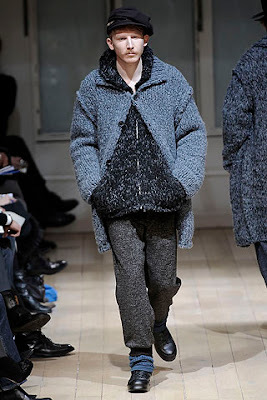 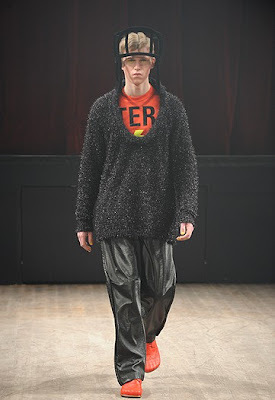 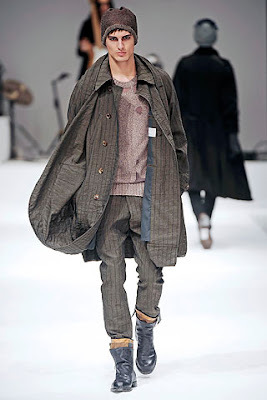 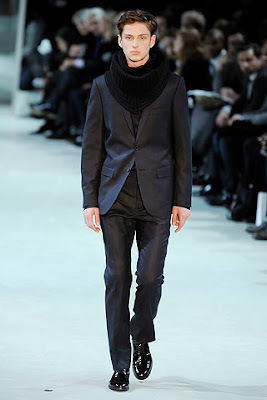 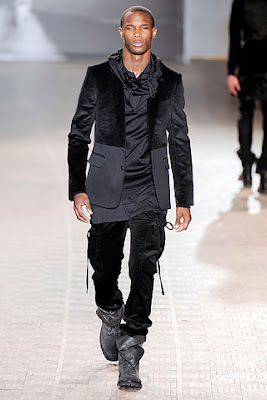 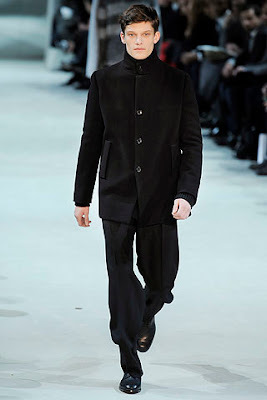 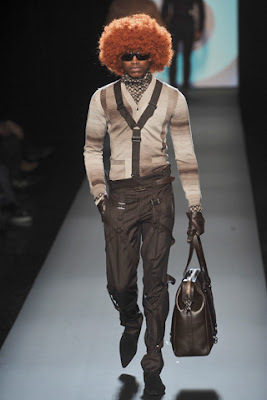 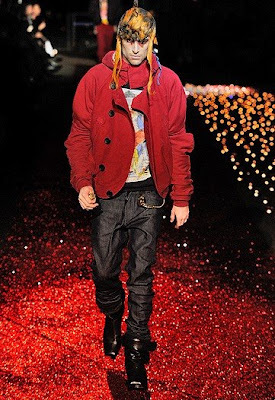 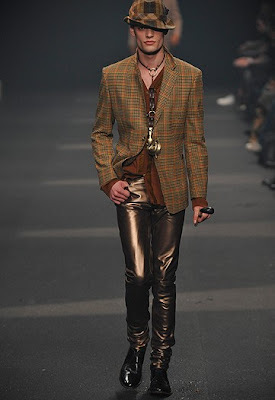 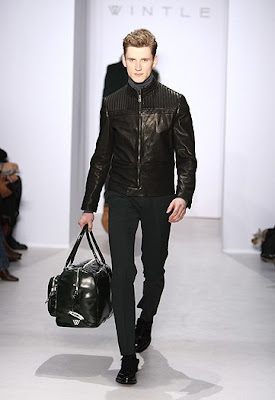 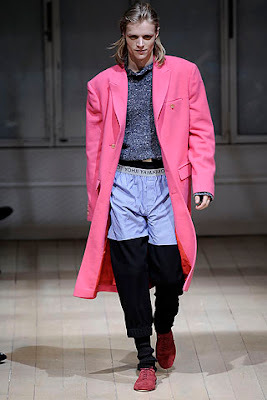 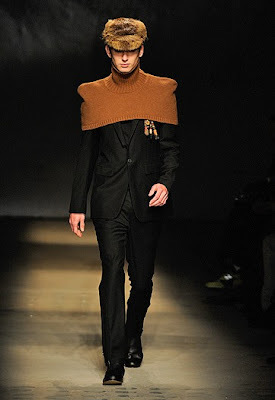 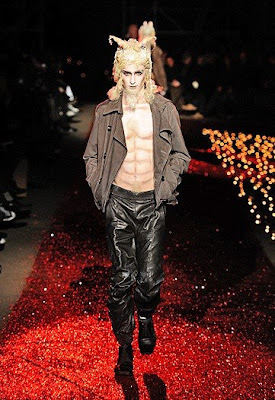 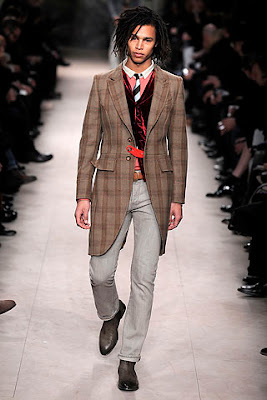 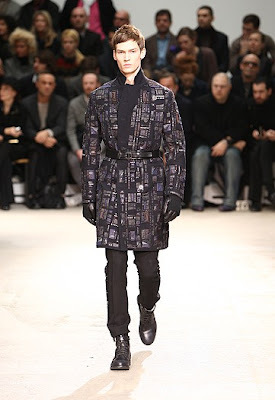 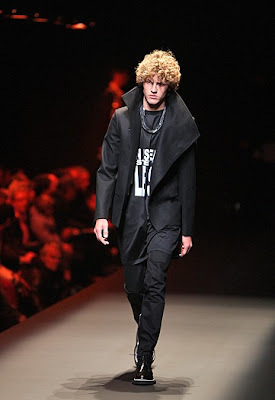 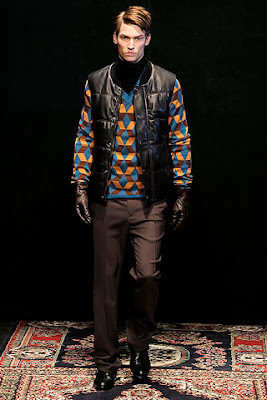 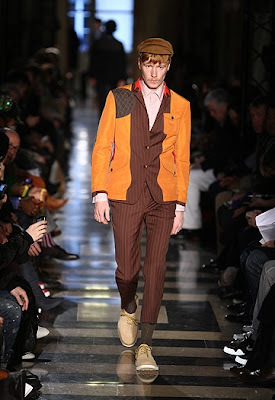 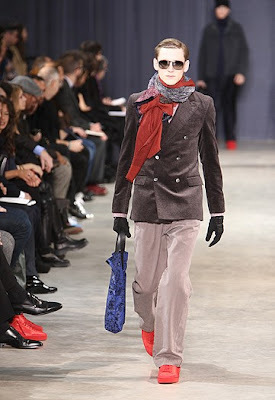 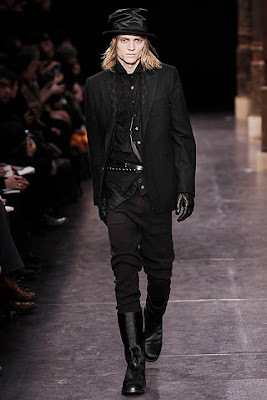 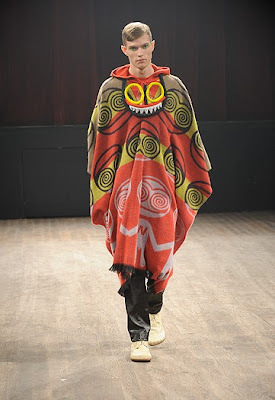 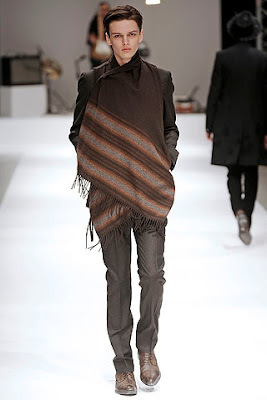 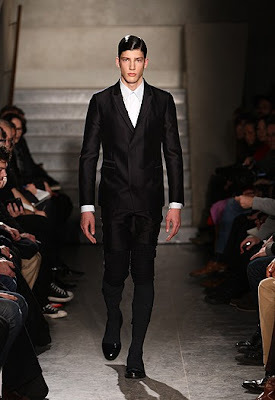 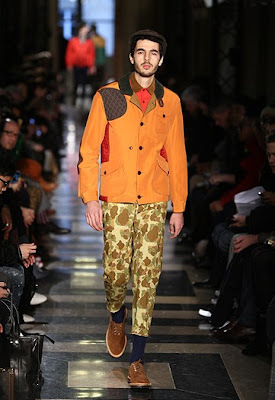 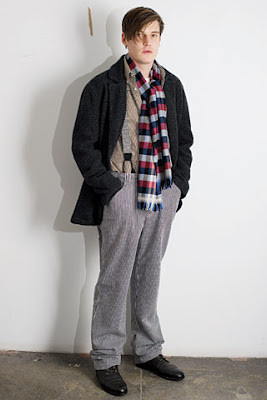 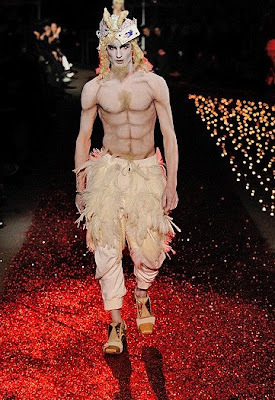 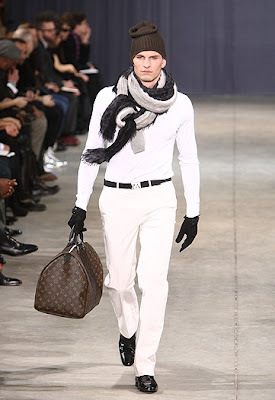 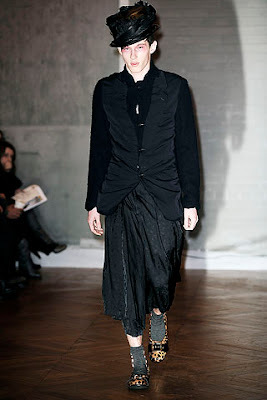 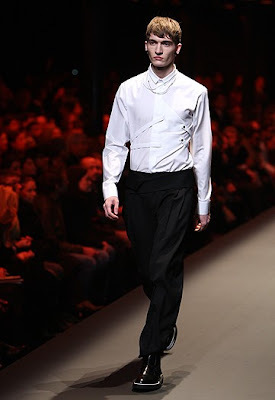 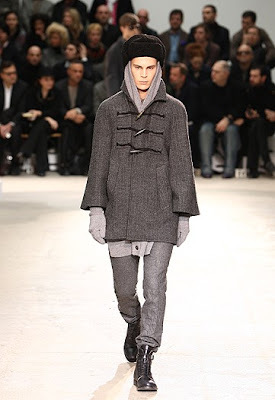 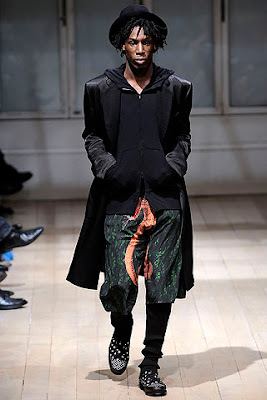 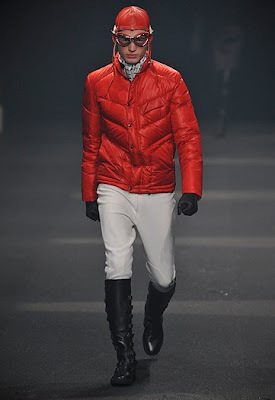 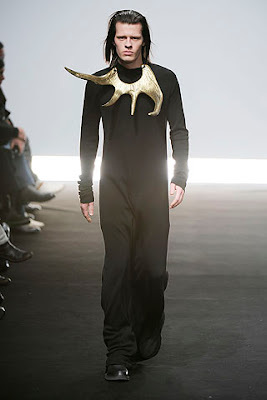 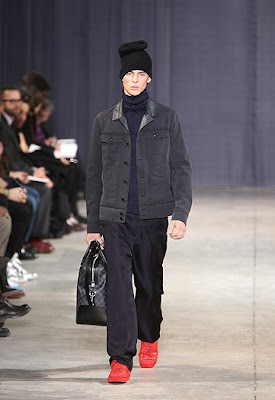 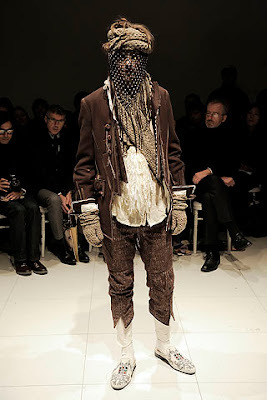 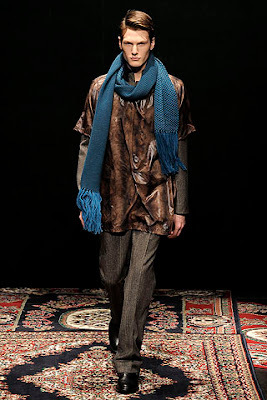 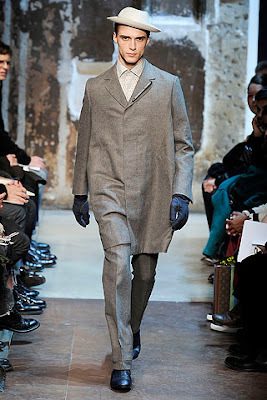 In Paris Men’s fashion week a lot of designers didn’t go to the safe route and offered men’s a more creative collection for fall and winter 2009/2010. 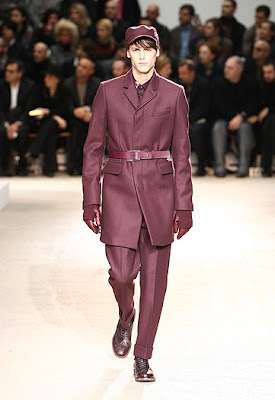 Men are romantics or pragmatics, lovers or fighters are the main theme in Paris. 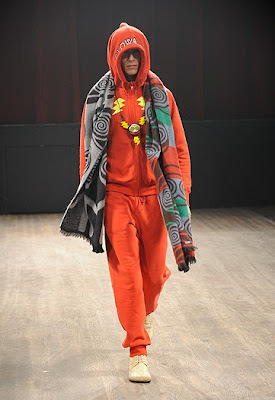 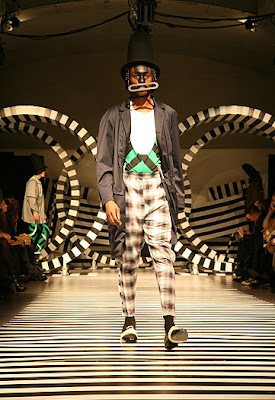 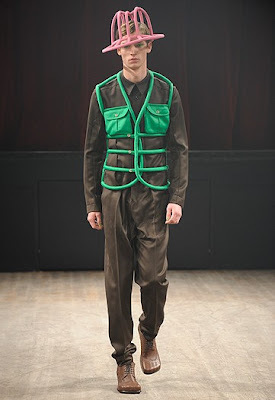 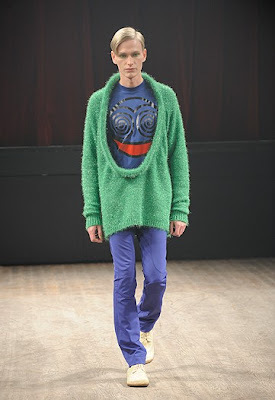 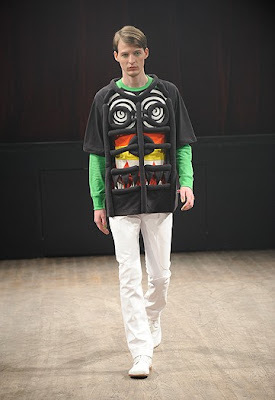 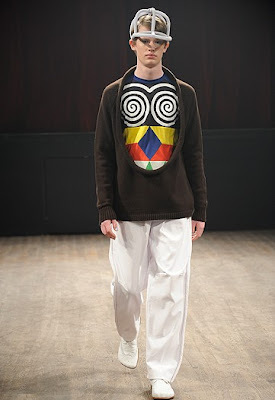 Armand Basi showed a very good debut show for Kenzo with his Russian constructivism inspired collection. 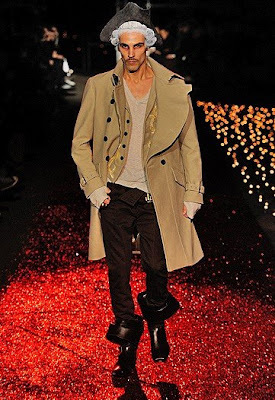 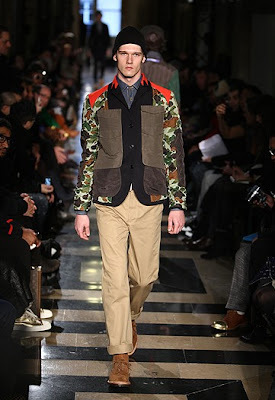 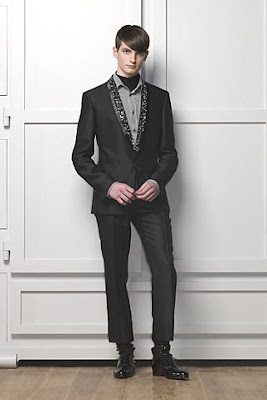 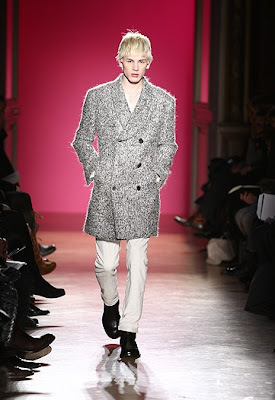 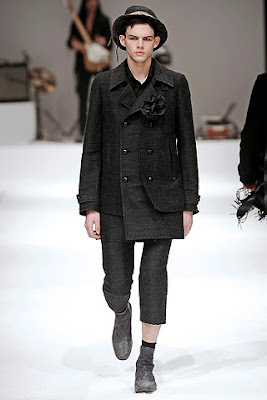 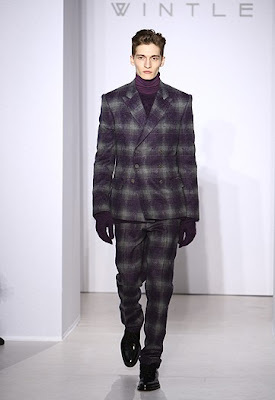 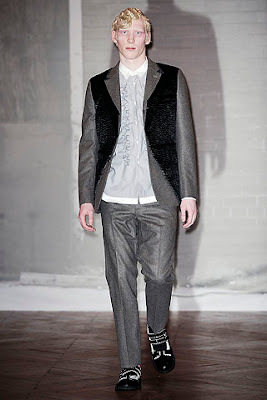 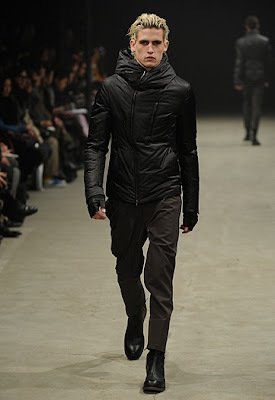 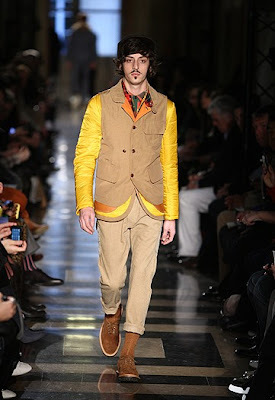 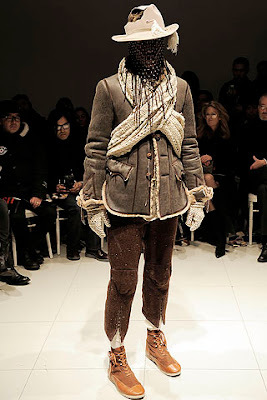 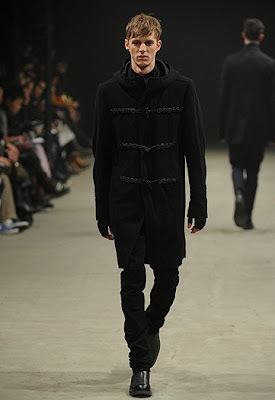 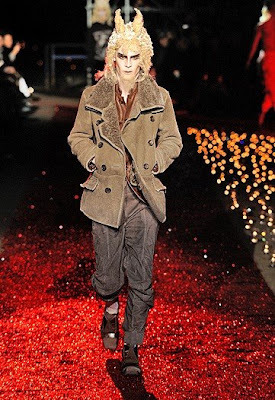 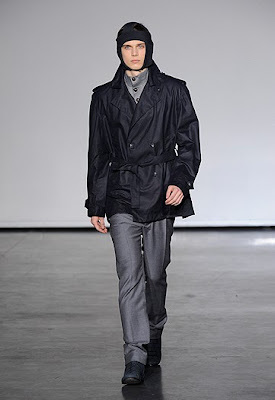 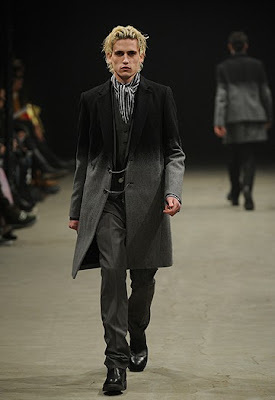 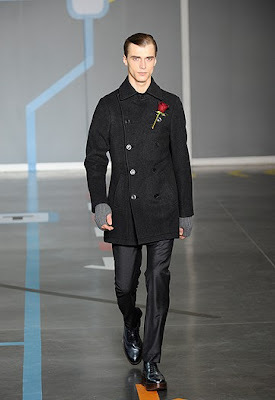 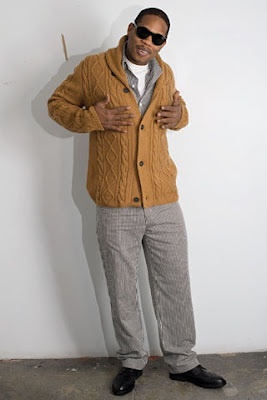 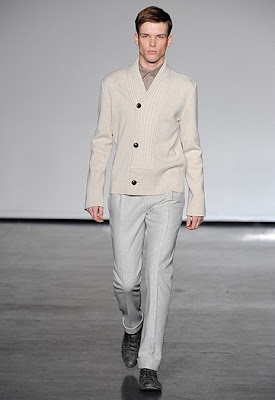 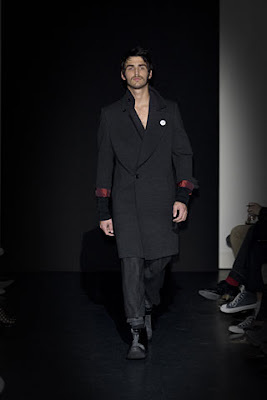 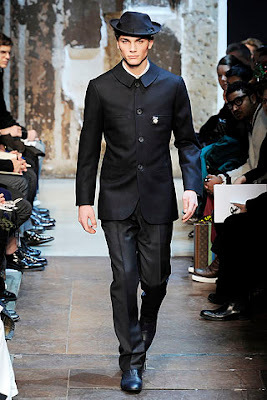 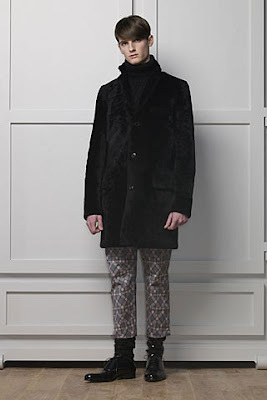 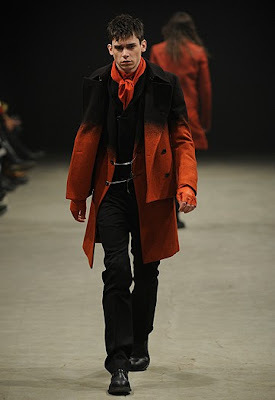 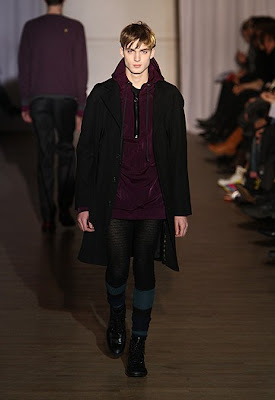 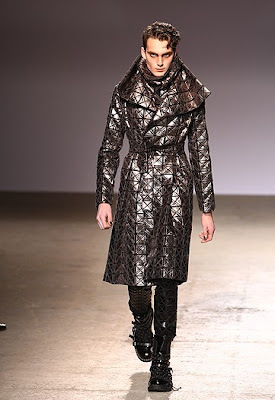 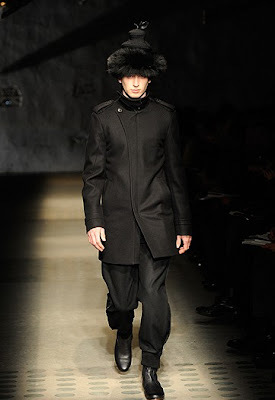 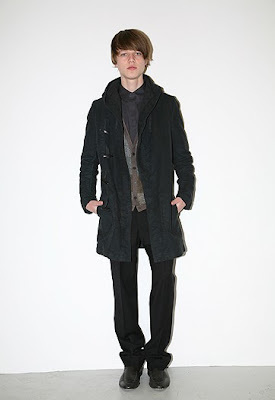 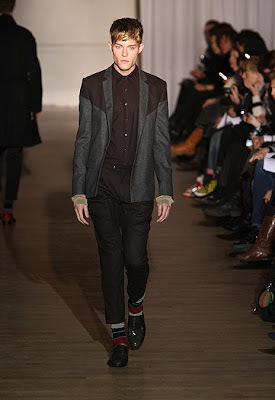 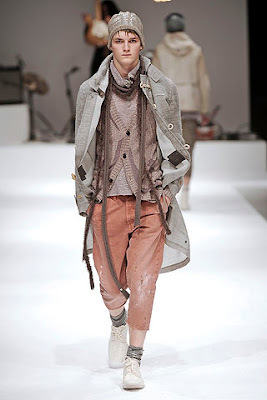 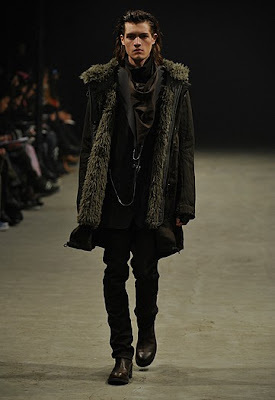 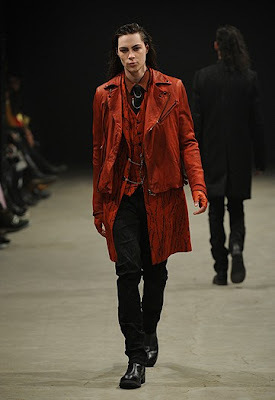 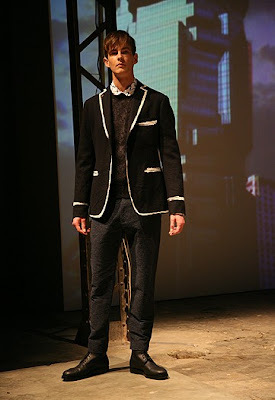 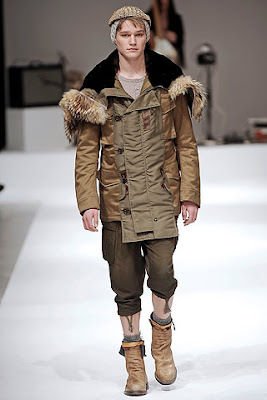 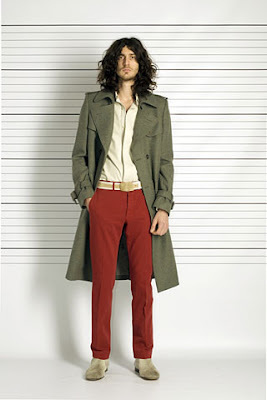 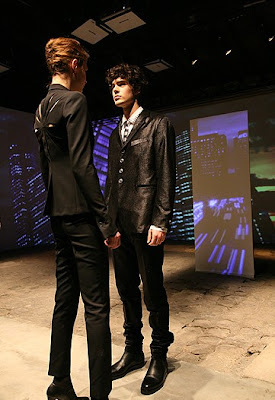 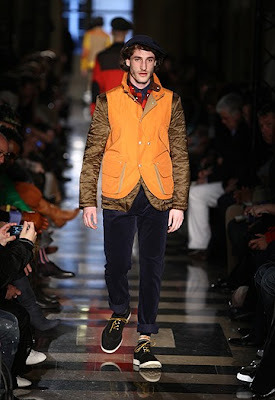 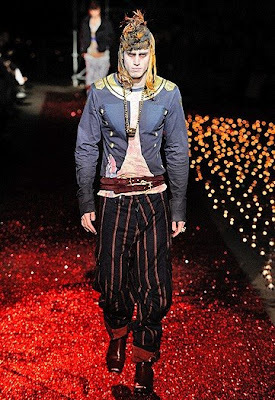 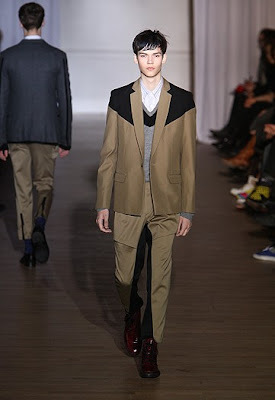 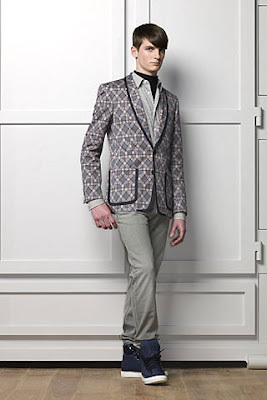 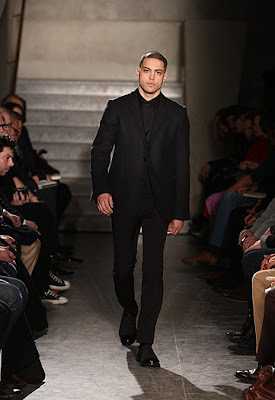 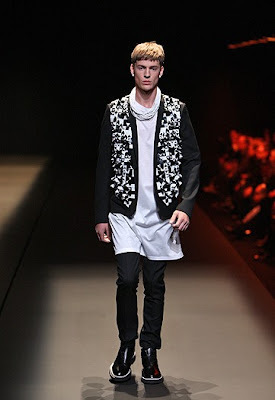 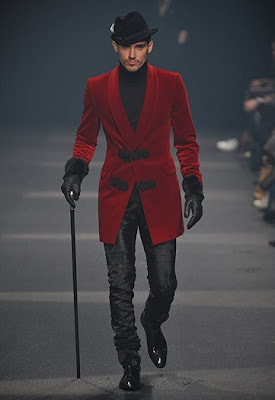 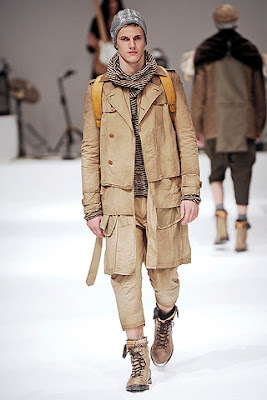 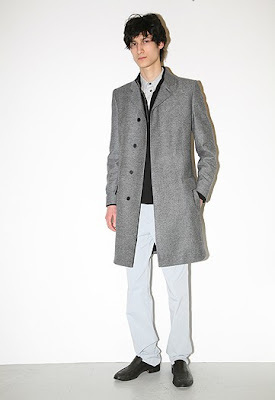 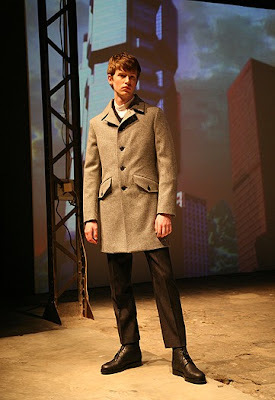 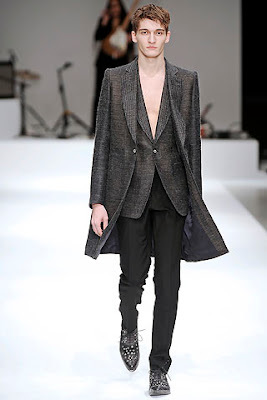 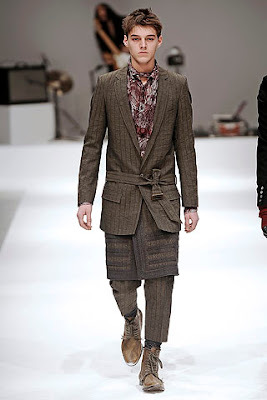 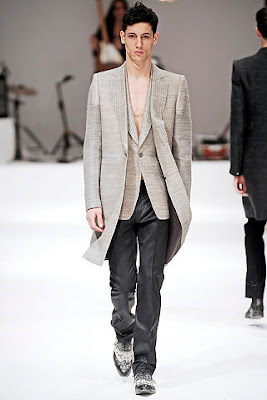 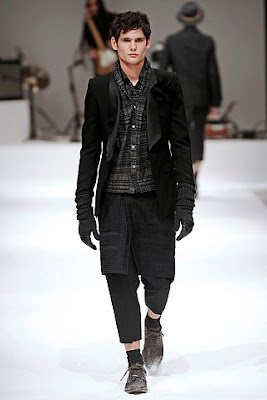 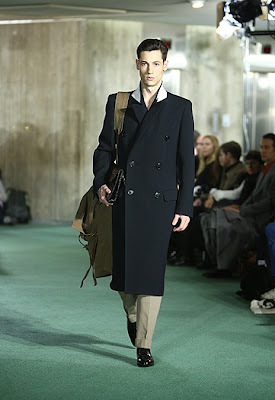 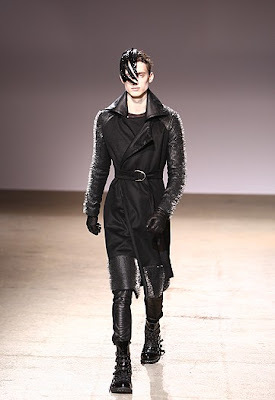 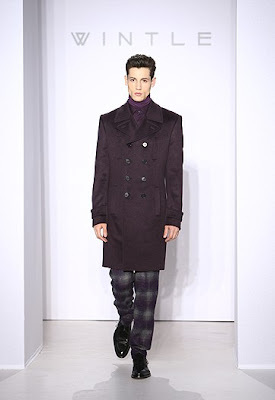 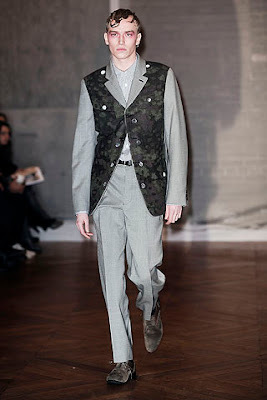 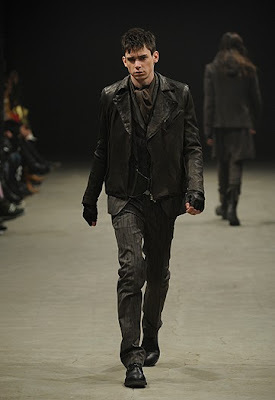 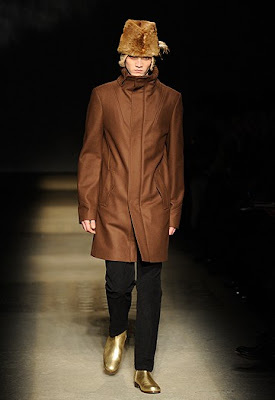 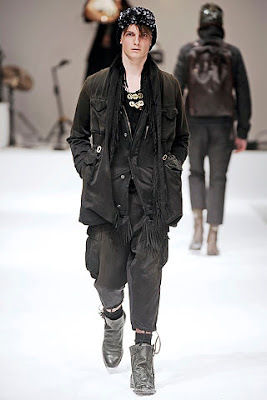 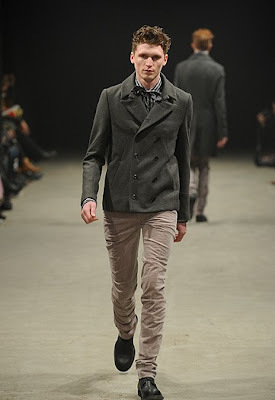 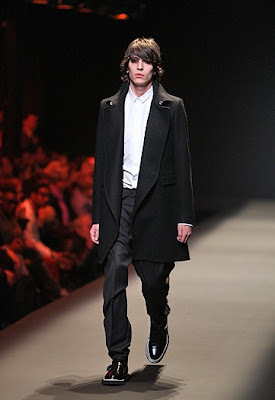 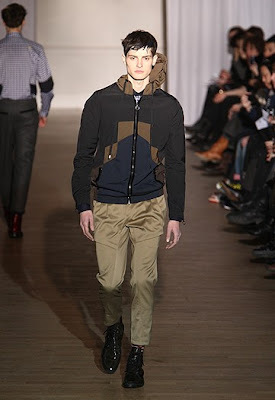 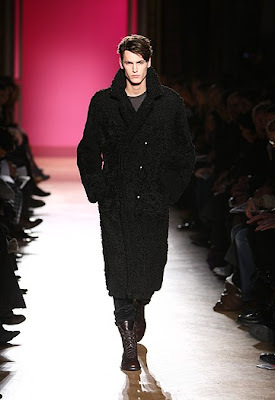 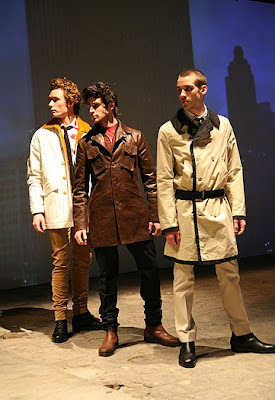 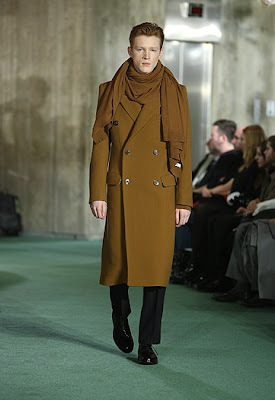 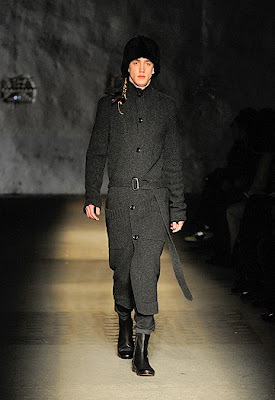 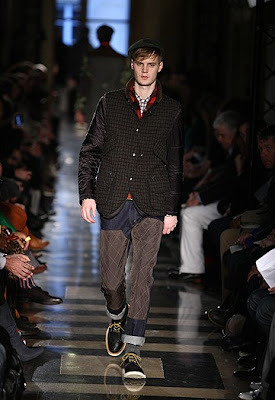 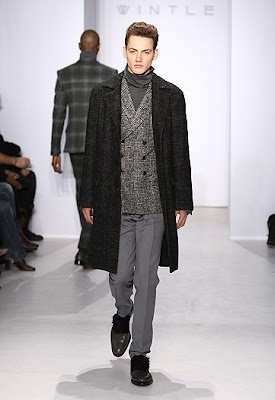 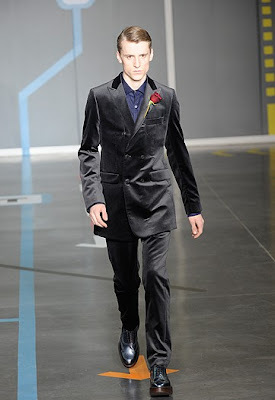 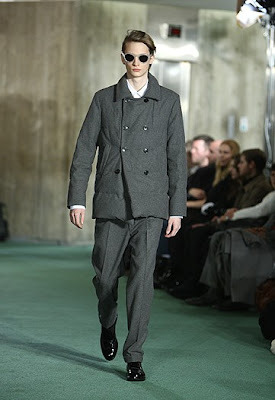 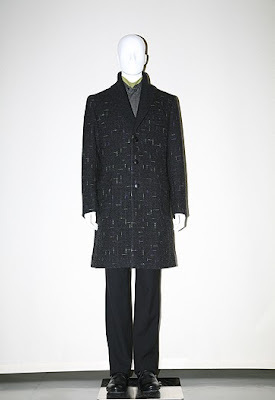 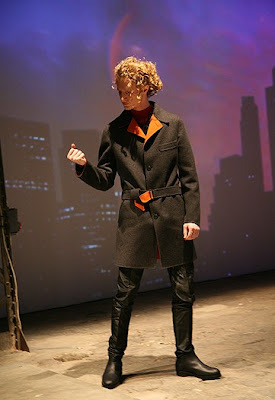 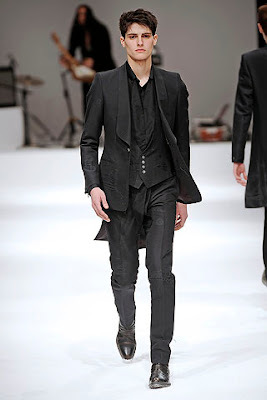 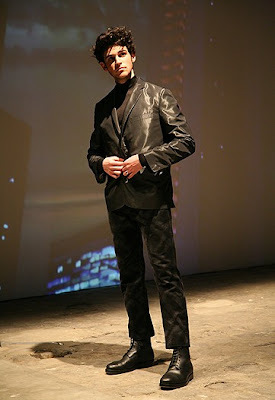 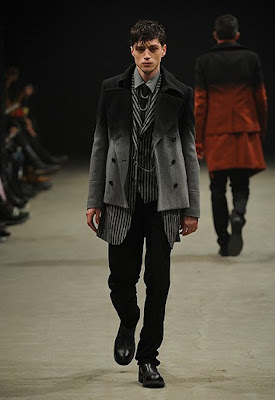 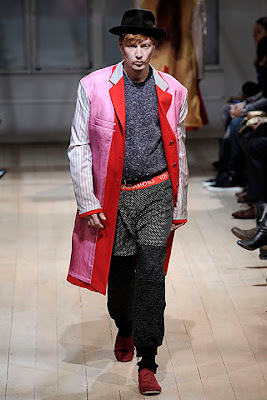 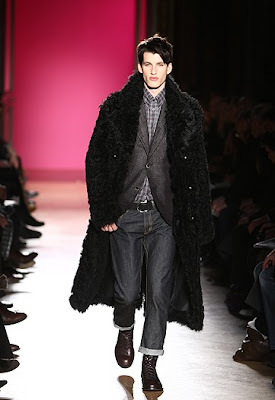 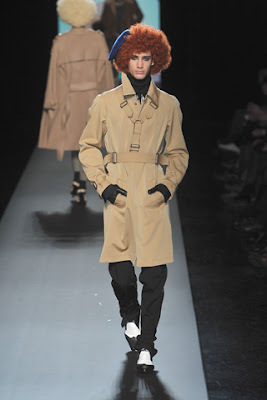 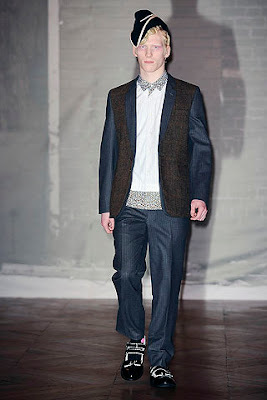 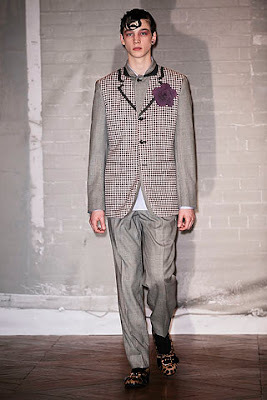 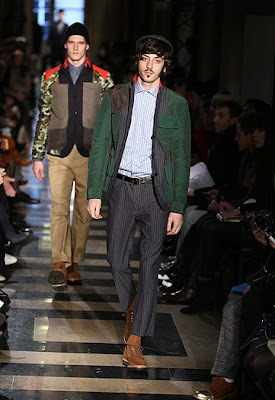 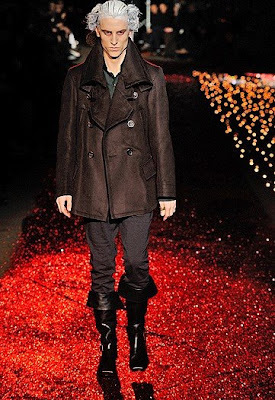 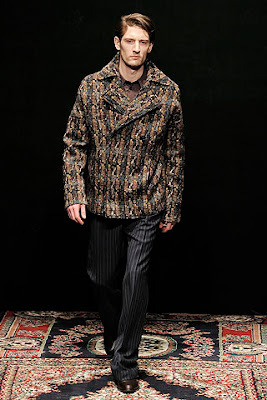 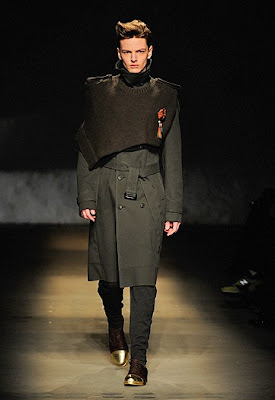 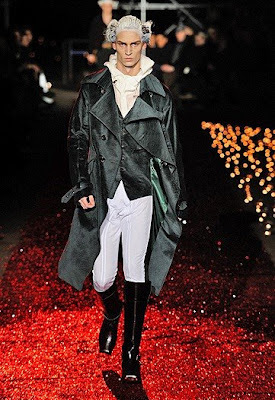 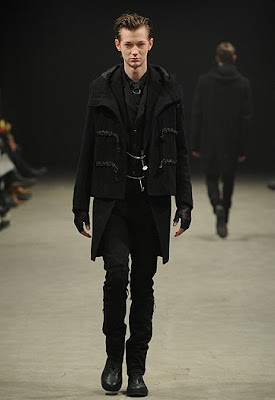 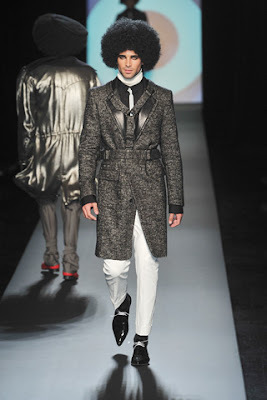 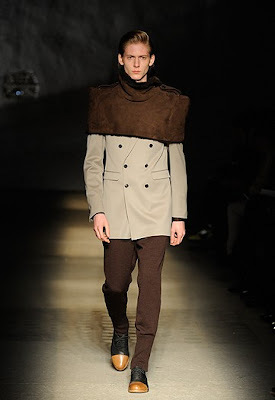 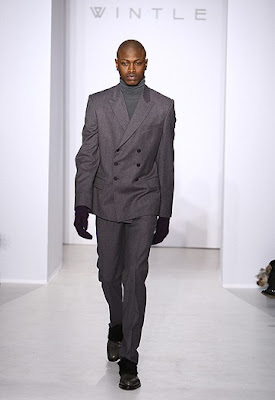 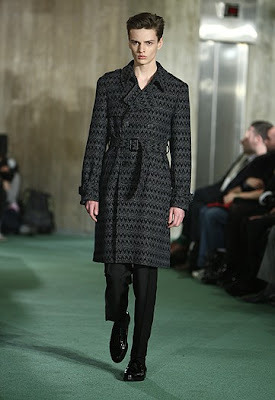 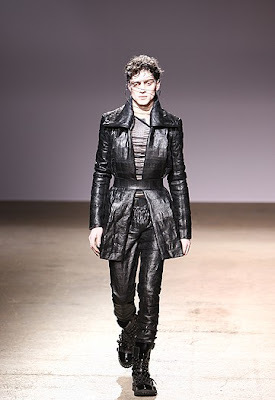 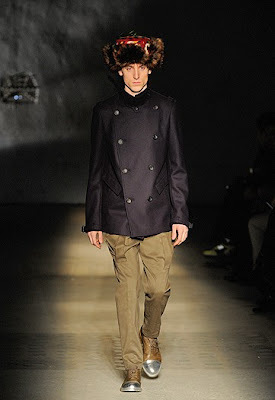 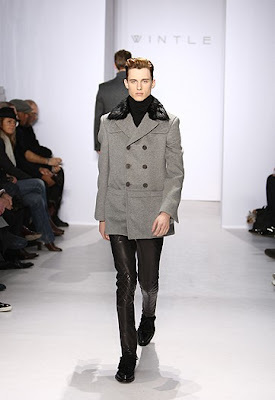 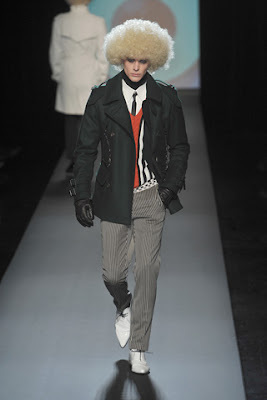 The best parts were military influenced coats and suits with flower embroidery, great balance of tough and soft. 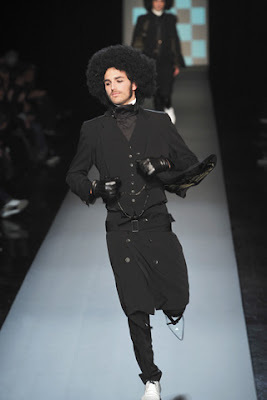 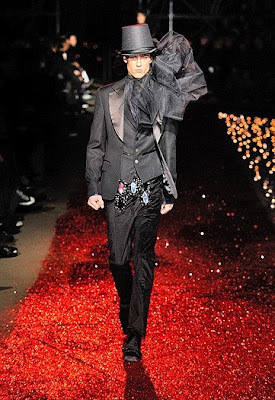 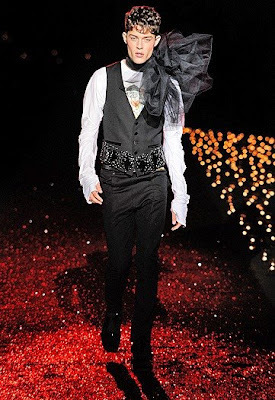 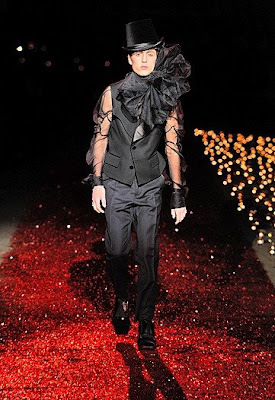 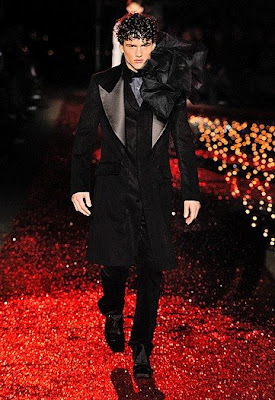 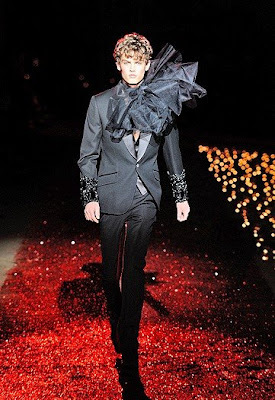 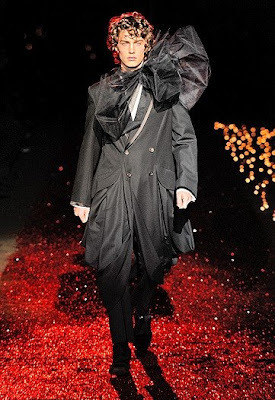 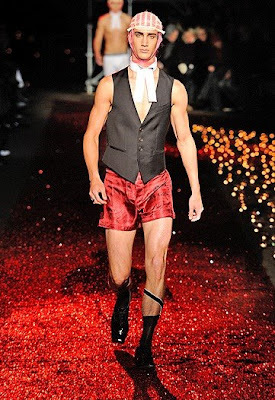 John Galliano paired giant black organza bow with sleek tuxedos to add extra romance. 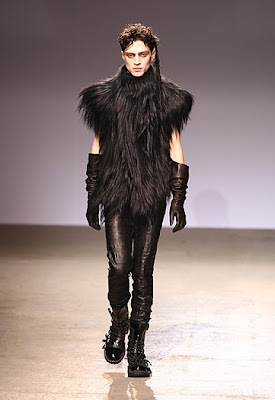 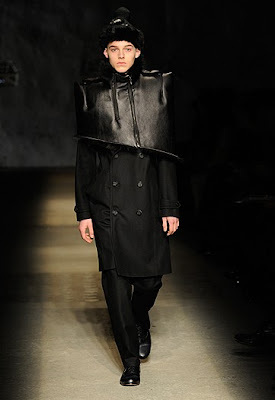 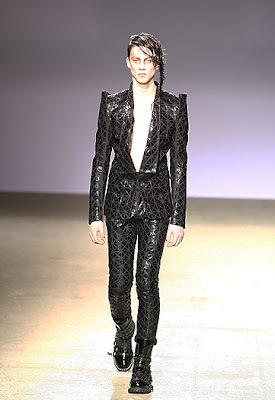 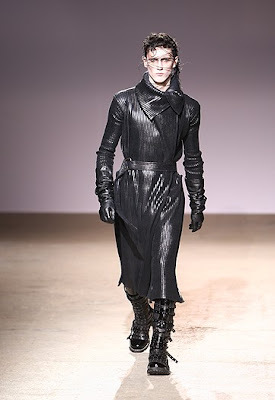 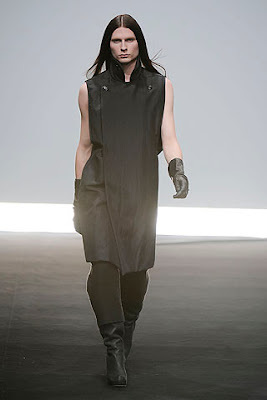 Gareth Pugh showed very touch cyber punk clothes. 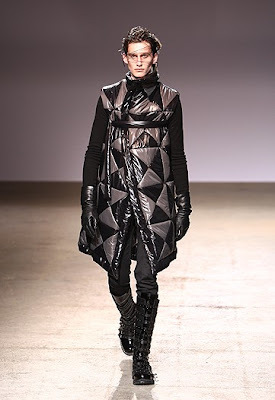 Futuristic and extreme shapes in entirely black and pewter with Goth leanings, shredded leggings, satin matador pants and shaggy furs. 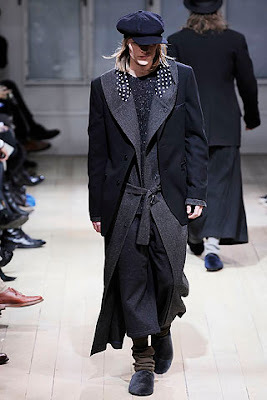 Some items were covered in spikes. 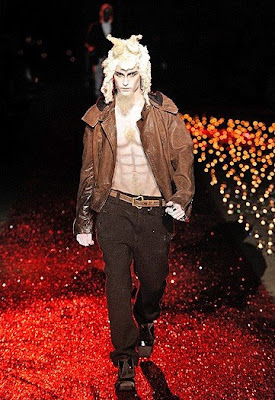 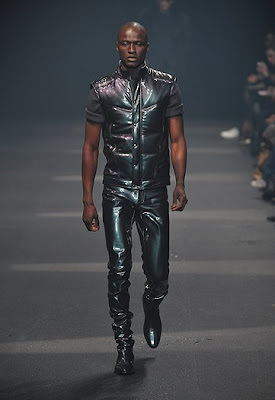 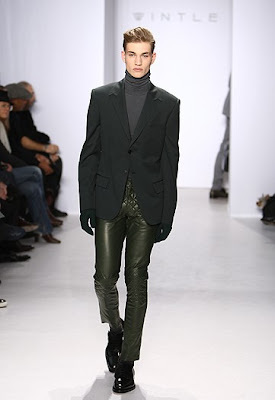 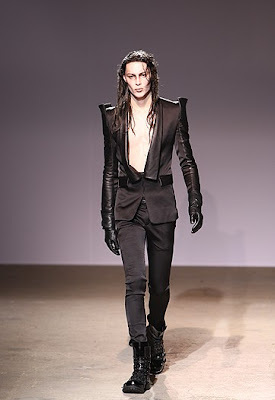 Thiery Mugler showed some X-men inspired clothing. 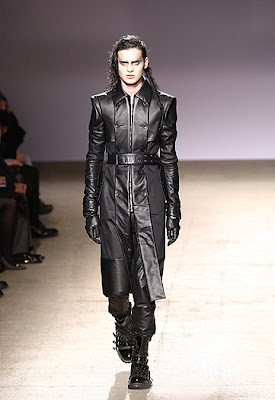 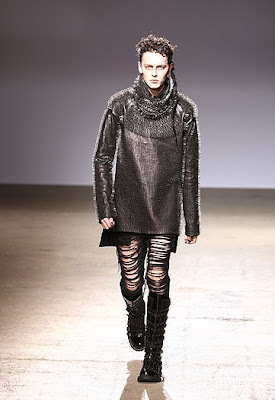 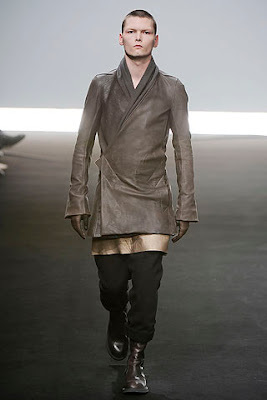 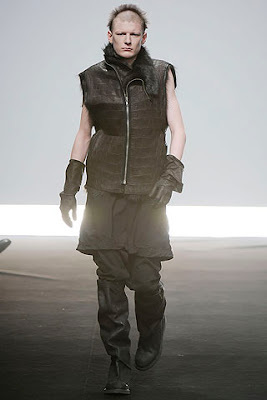 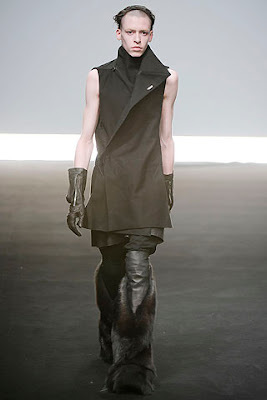 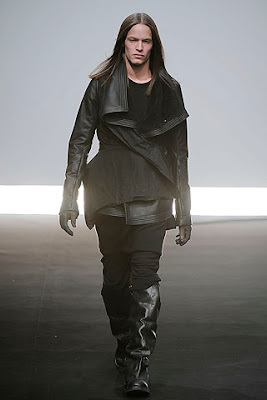 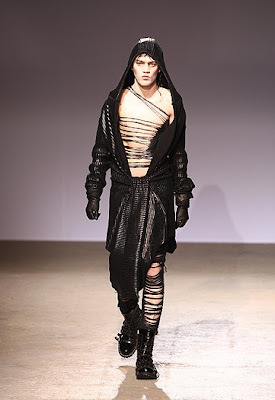 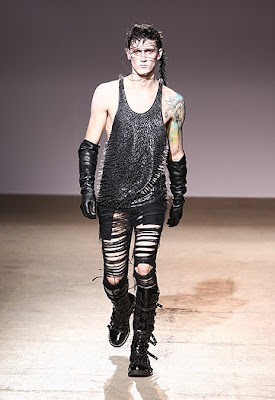 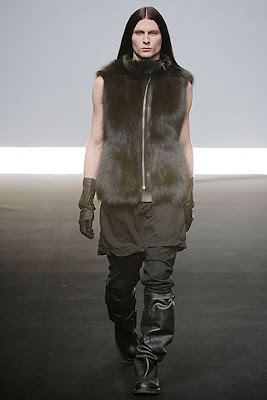 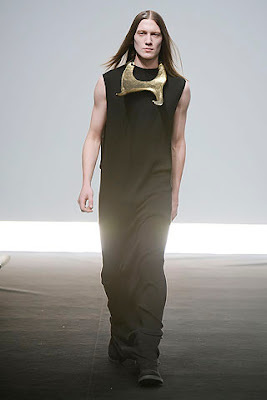 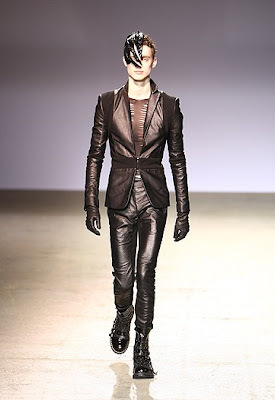 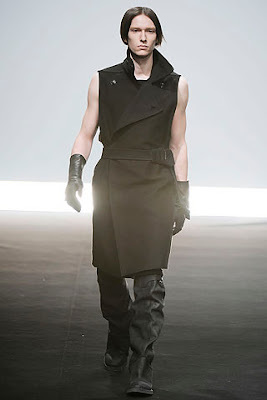 Wasteland warriors are main theme in Rick Owens show. 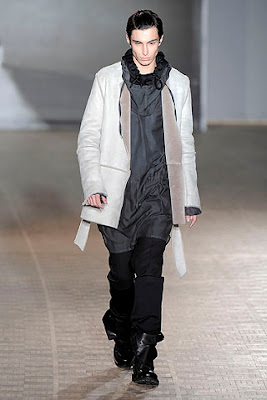 The collection is filled with floor-length knit dress and the short skirts layered over harem pants, oversized hood and opera jacket with strong shoulders. 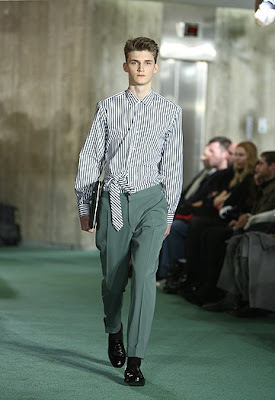 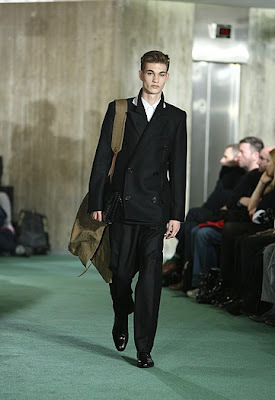 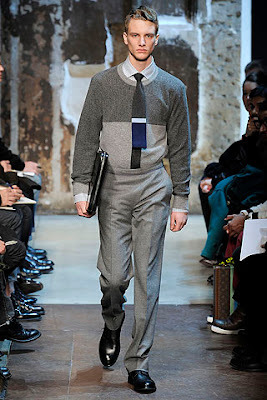 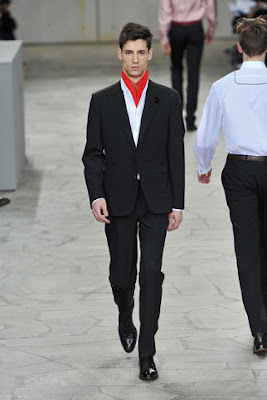 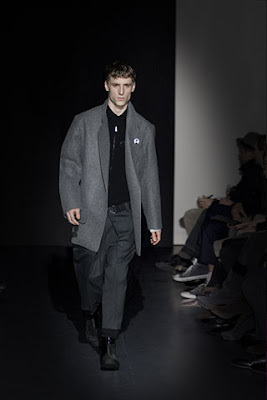 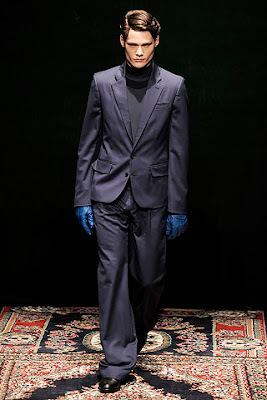 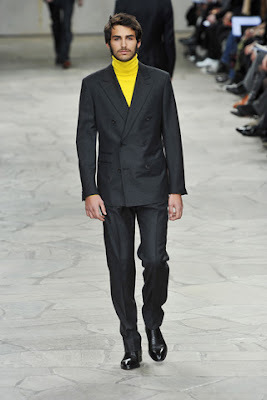 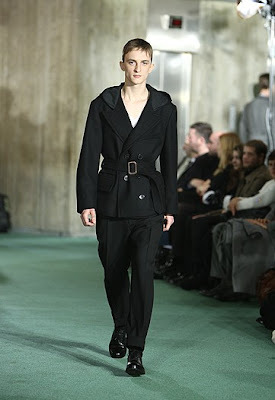 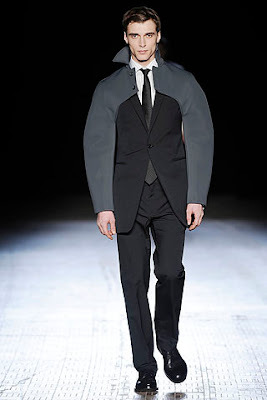 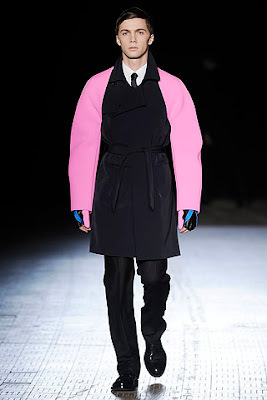 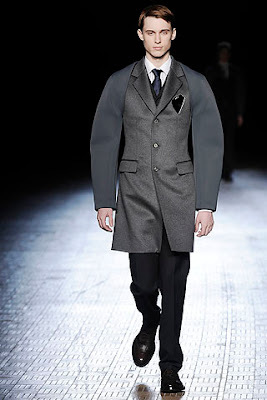 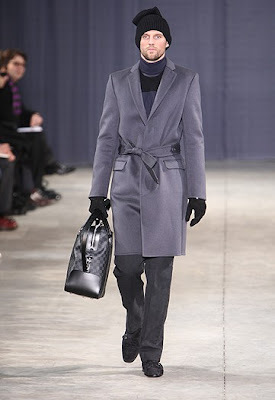 Raf Simons offered corporate warriors with new shape and fabric for suits, knitted and neoprenelike shrugs. 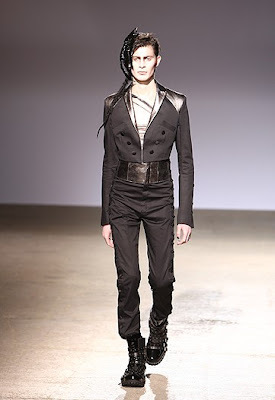 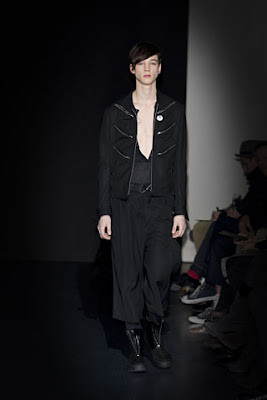 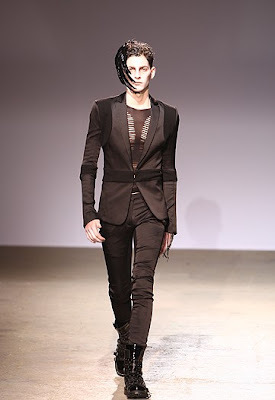 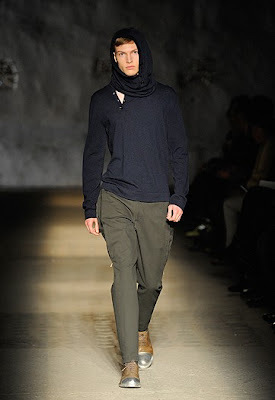 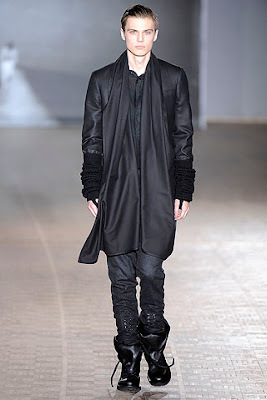 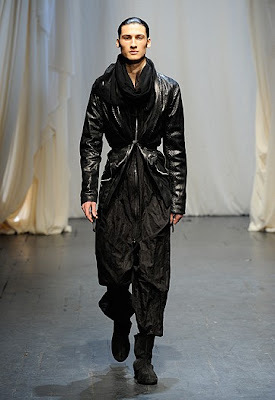 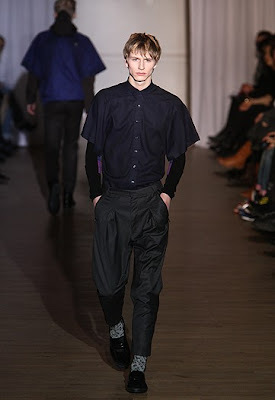 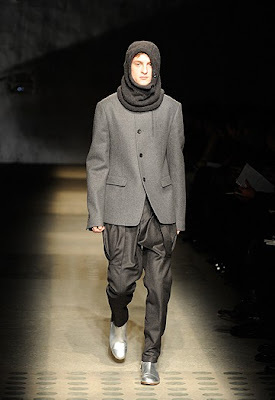 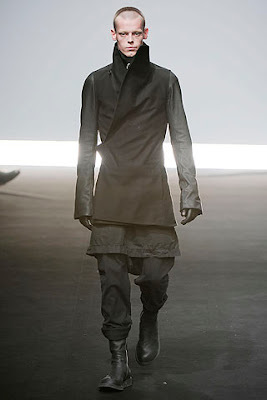 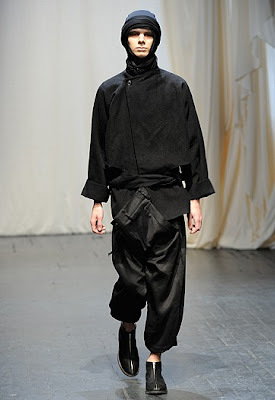 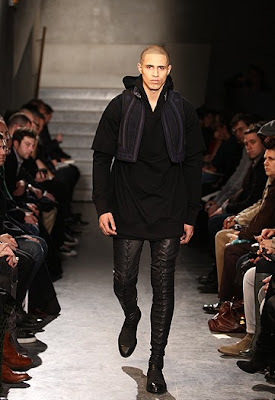 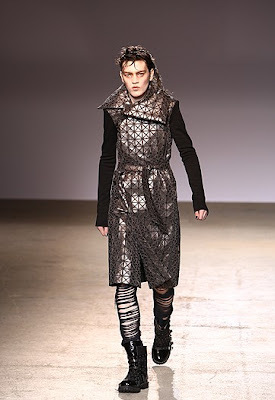 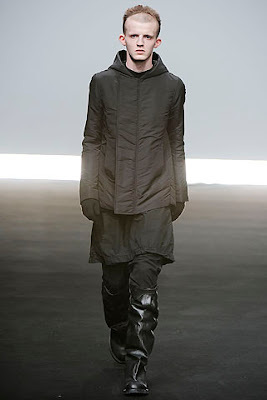 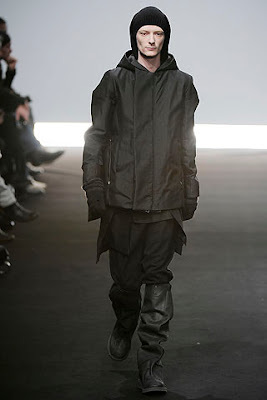 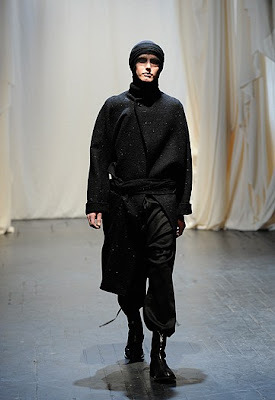 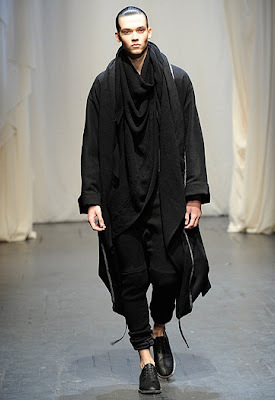 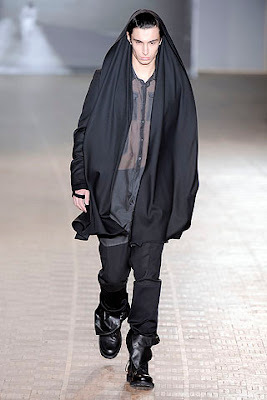 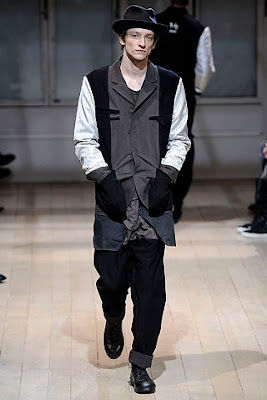 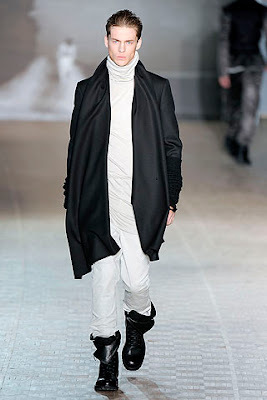 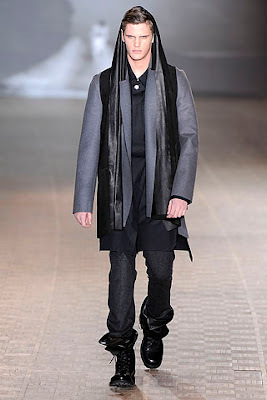 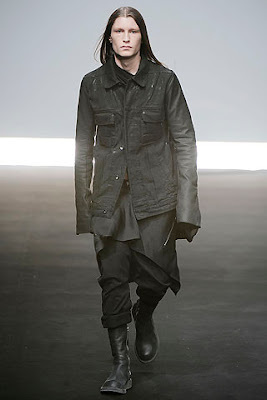 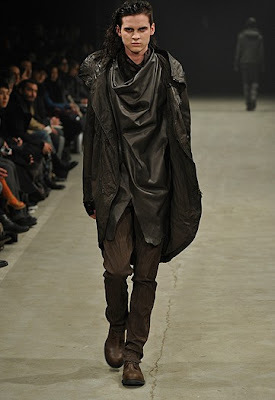 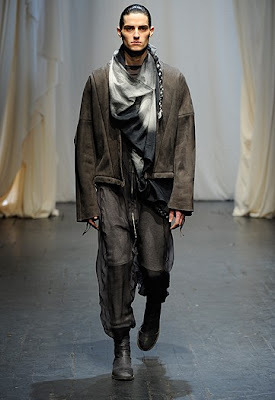 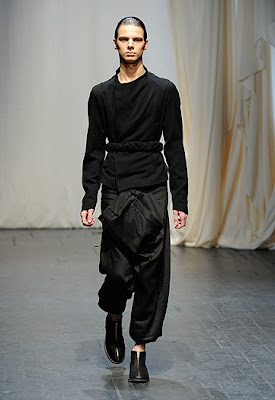 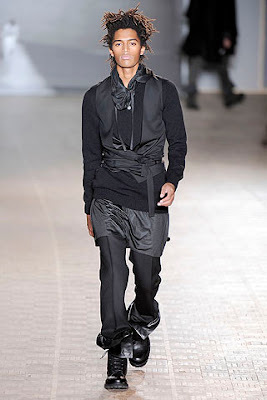 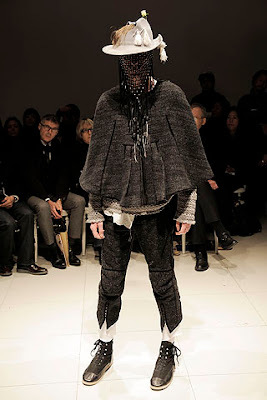 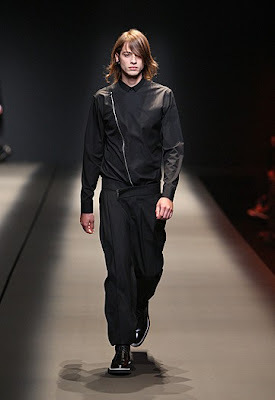 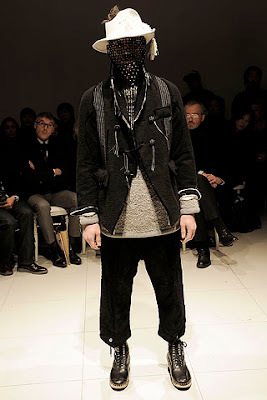 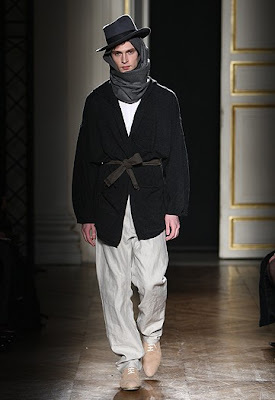 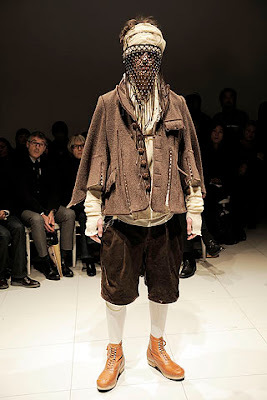 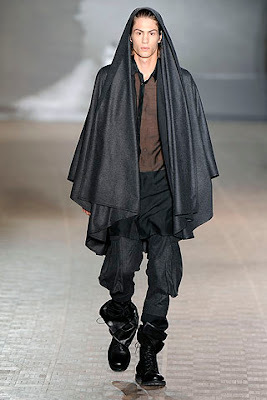 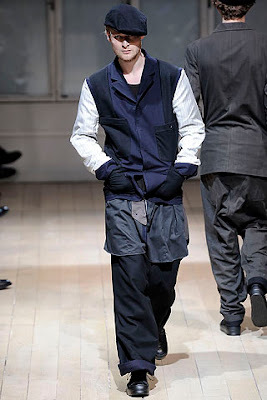 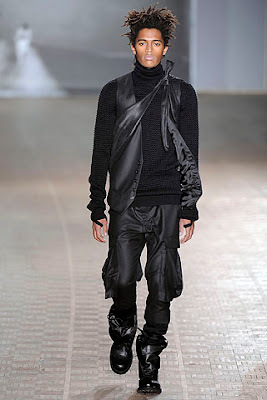 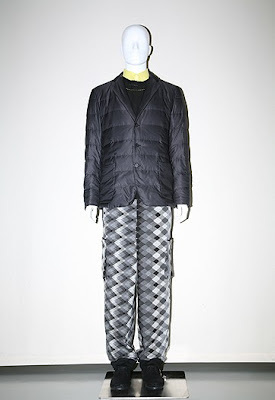 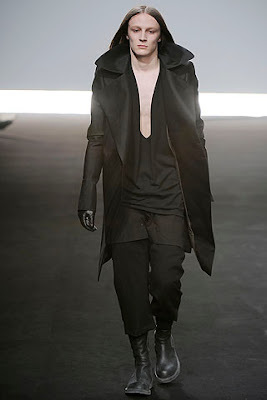 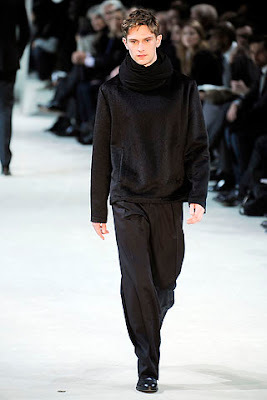 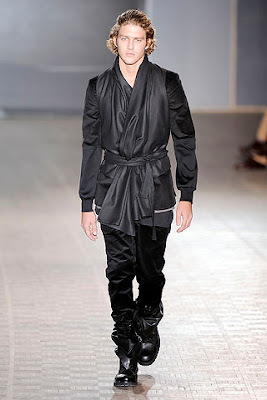 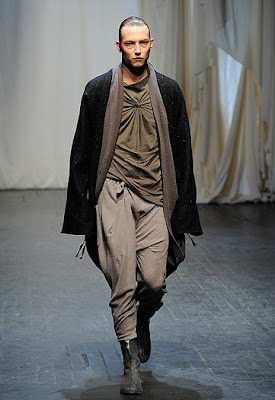 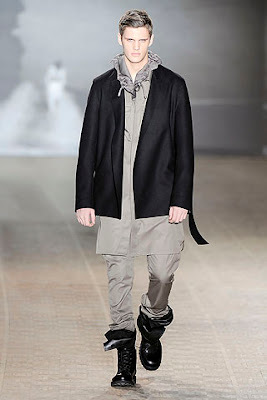 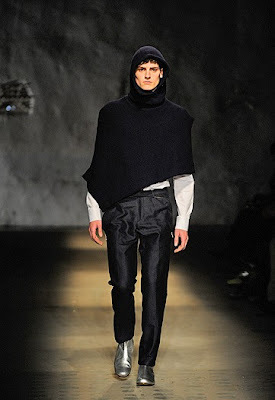 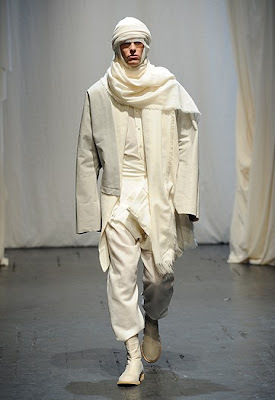 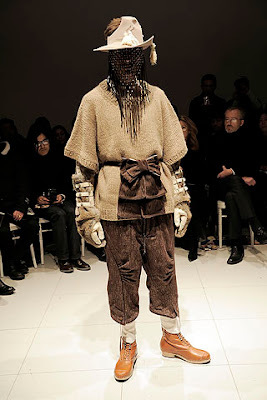 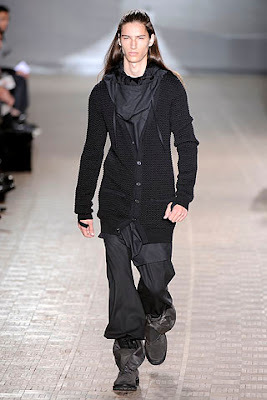 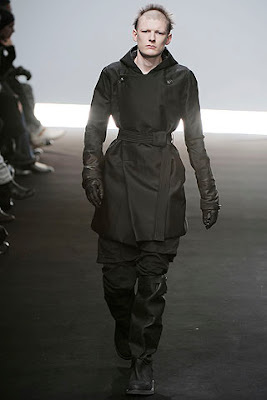 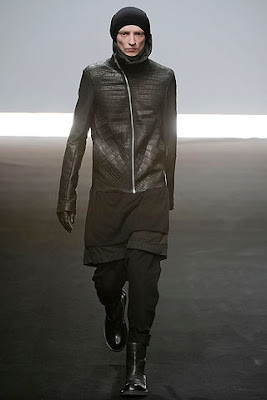 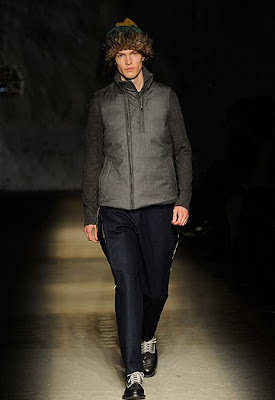 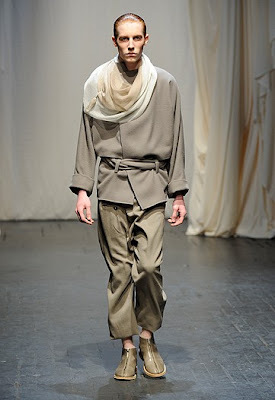 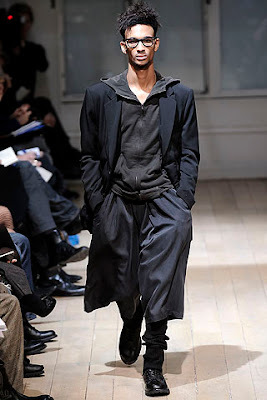 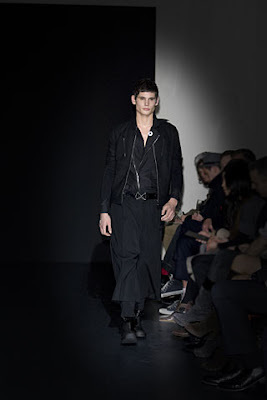 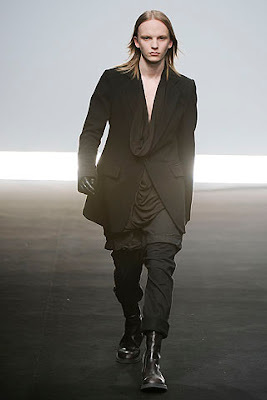 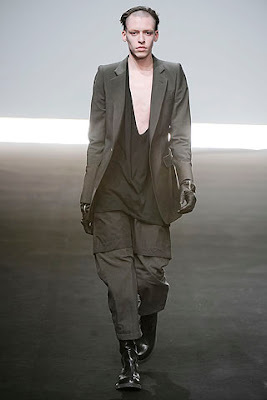 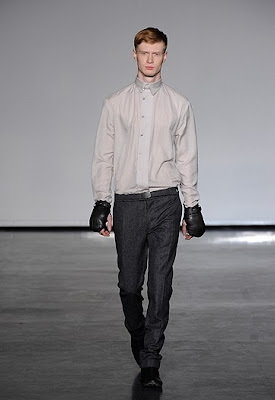 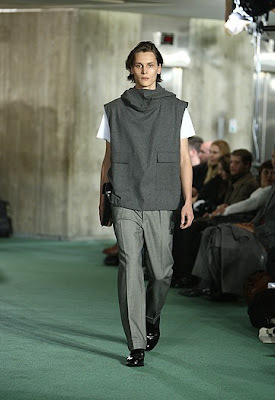 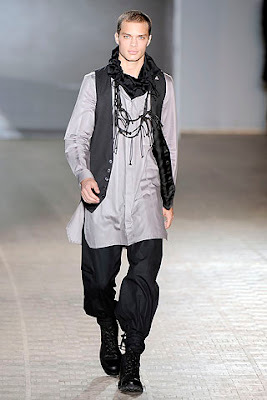 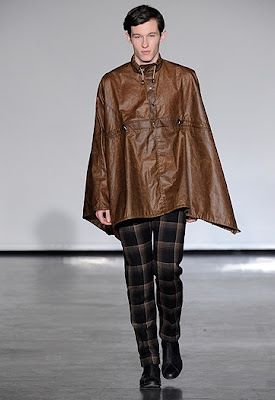 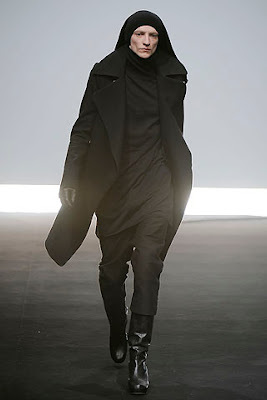 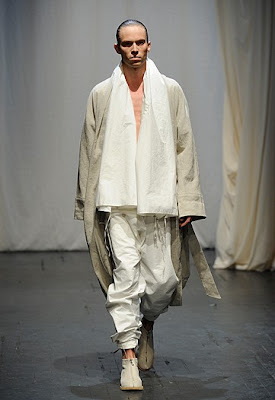 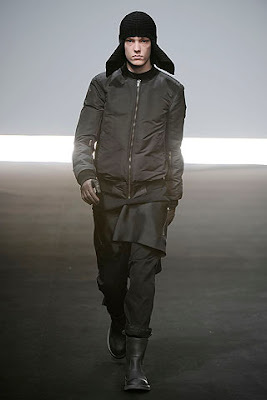 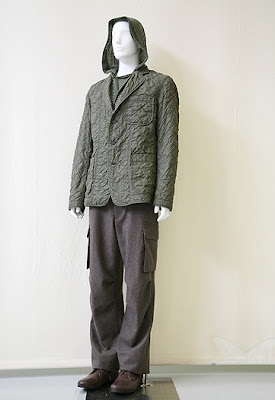 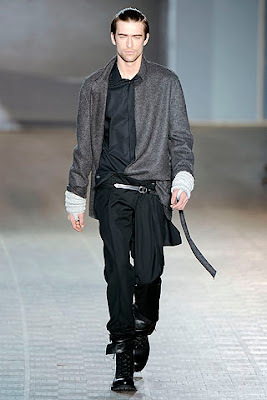 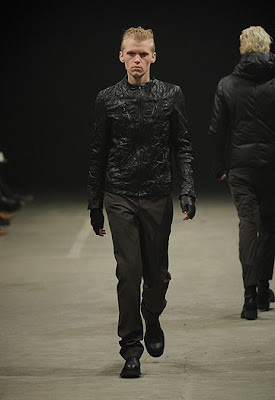 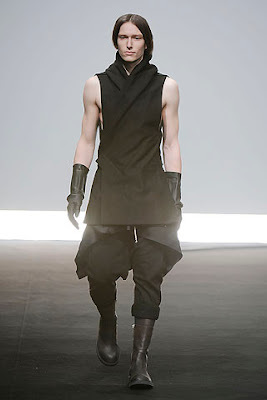 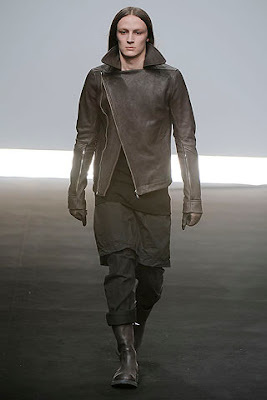 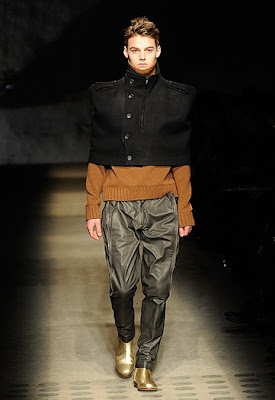 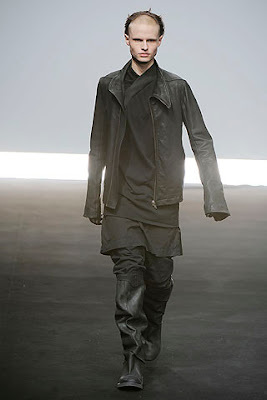 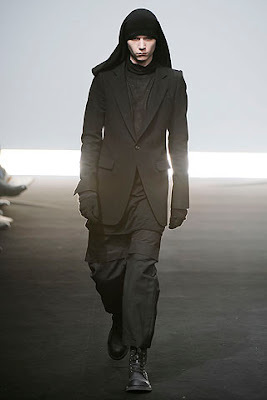 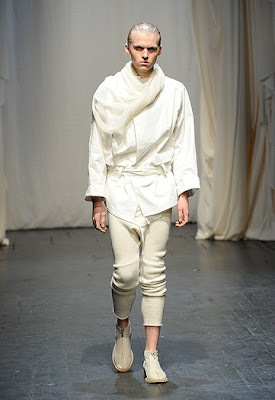 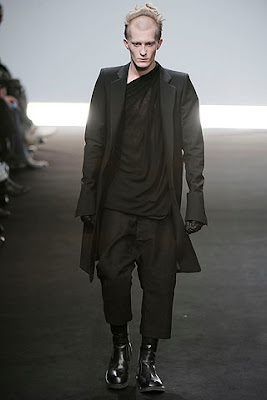 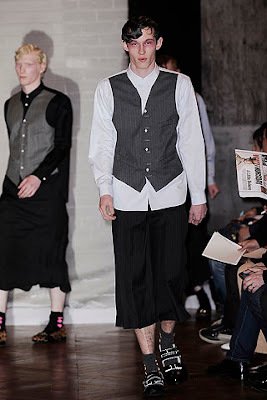 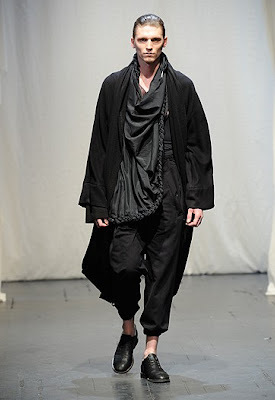 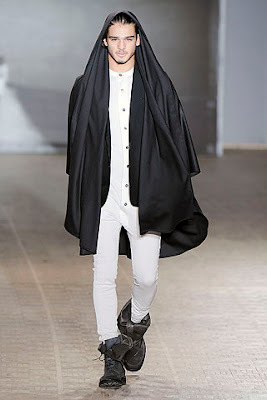 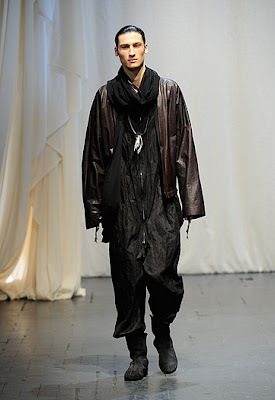 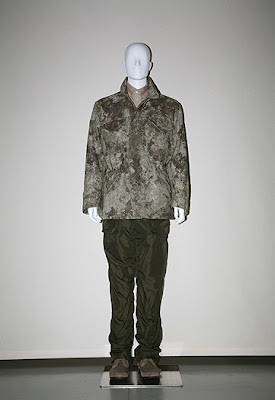 There's a lot of ninja inspiration that can be seen in the collection of Damir Doma and Kazuyuki Kamagai for Attachment. 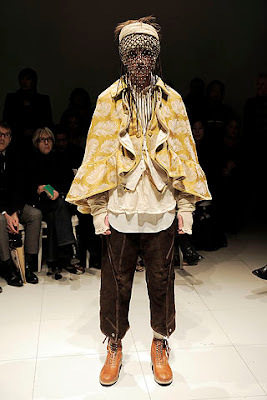 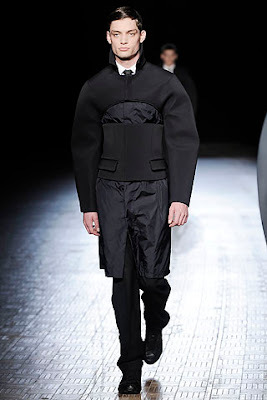 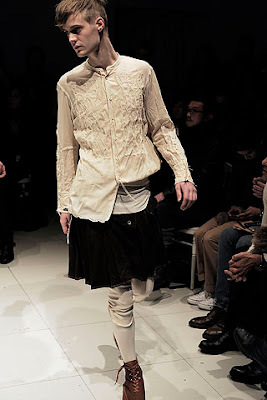 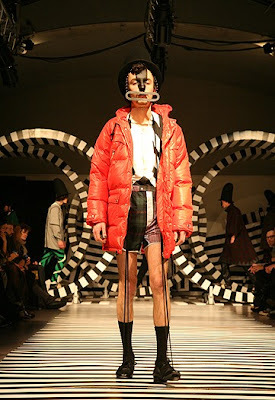 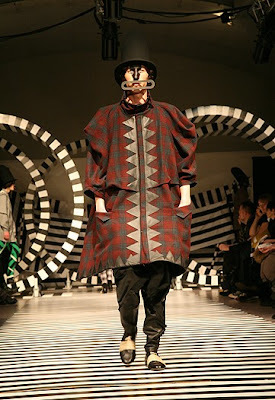 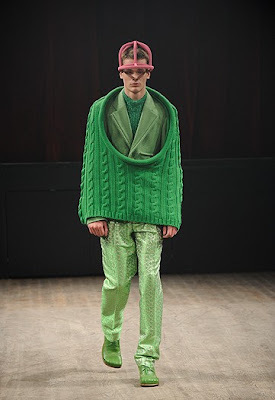 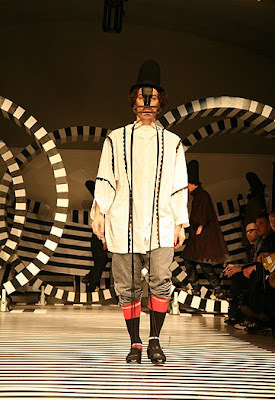 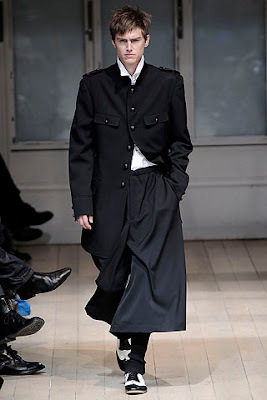 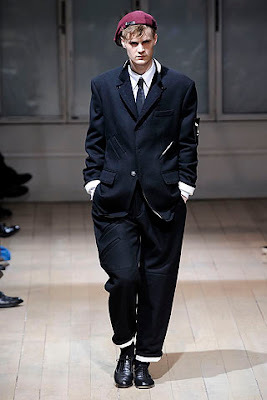 2) Comme des Garcons – Rei Kawakubo showed another very interesting and irresistible show. 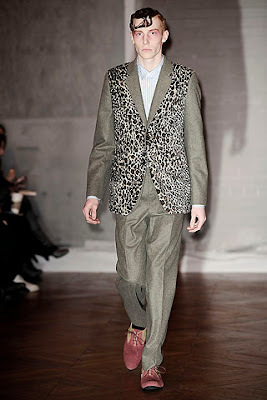 Just the accessories alone are a head turner: leopard slip-ons with jeweled buckles, or two-tone patent Mary Janes with big bows. 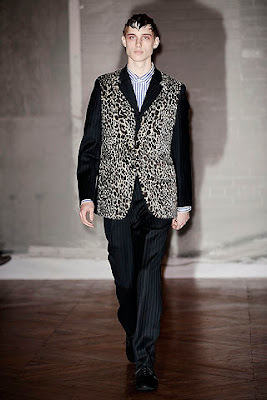 The best part was when he inserted contradictory panels of fabric into these cloths: a leopard spot next to twill, a rough check in a Prince of Wales jacket, and a print of a Napoleonic tailcoat hard up against gray pinstripe. 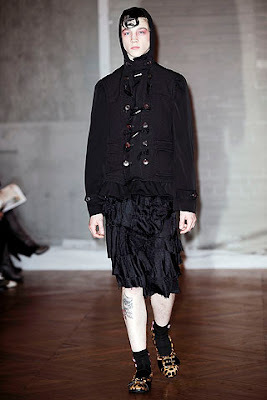 Even his black skirt looks very wearable and manly. 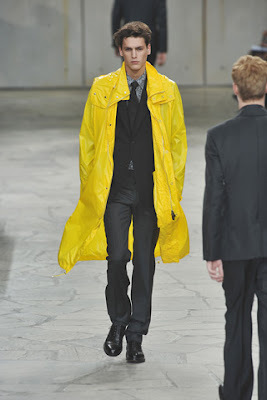 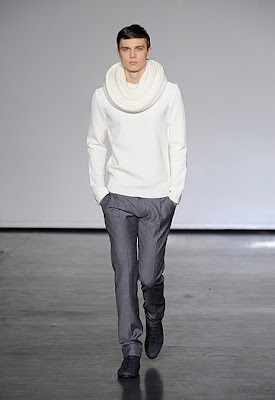 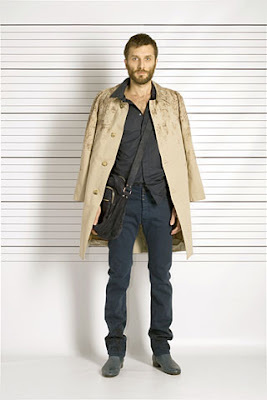 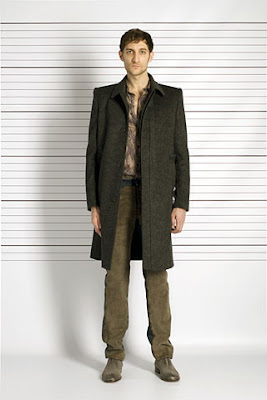 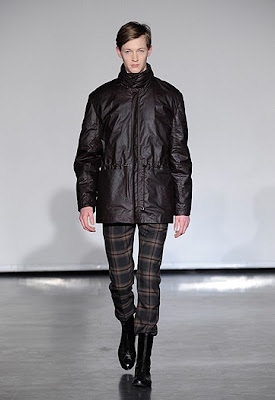 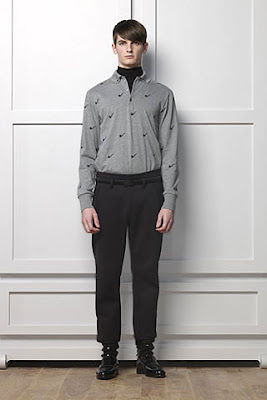 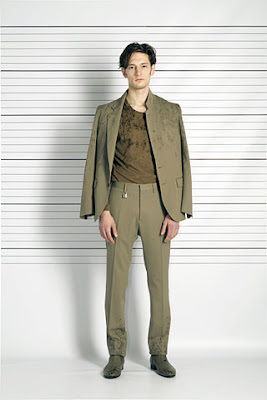 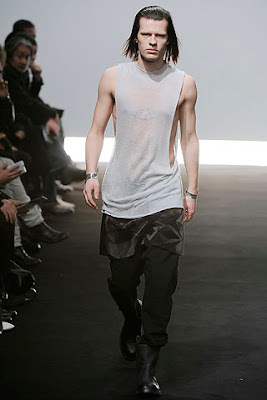 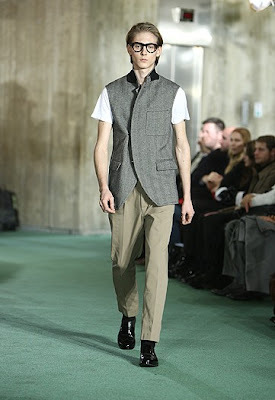 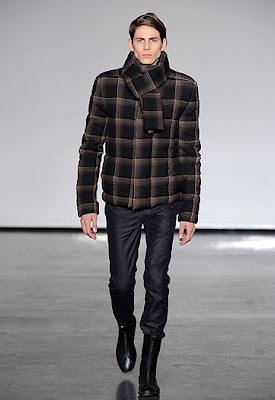 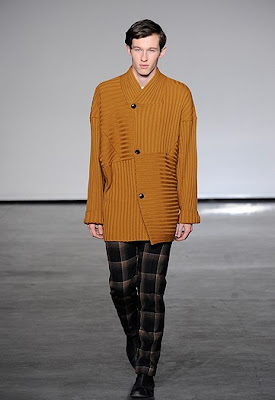 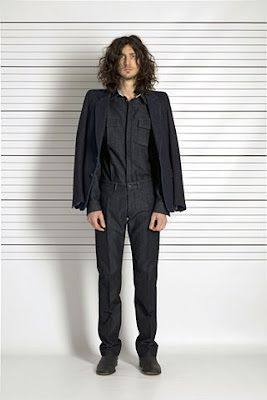 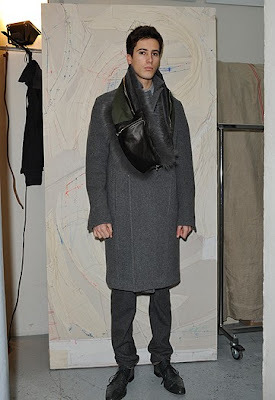 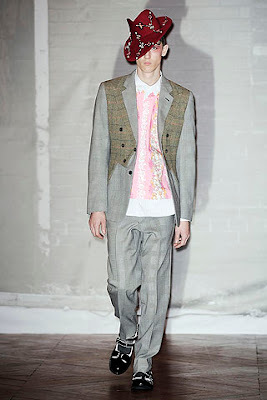 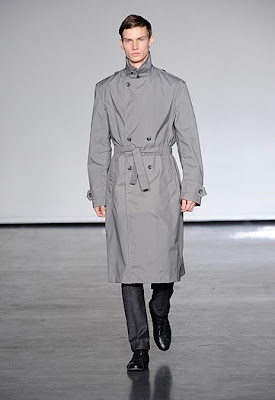 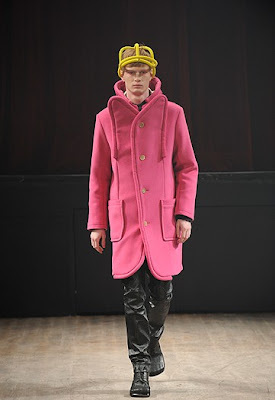 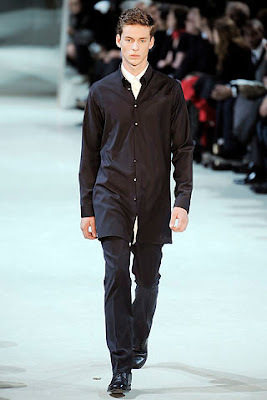 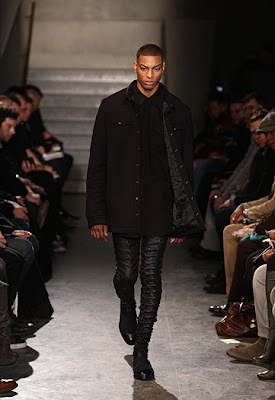 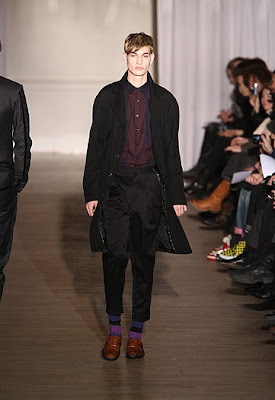 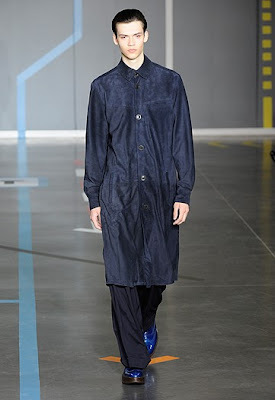 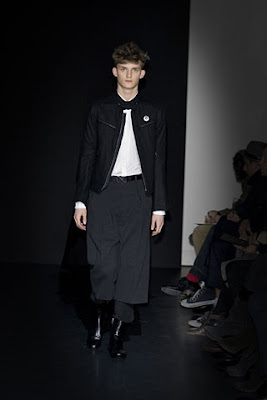 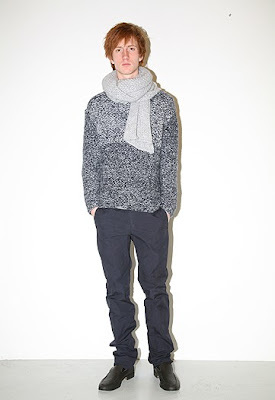 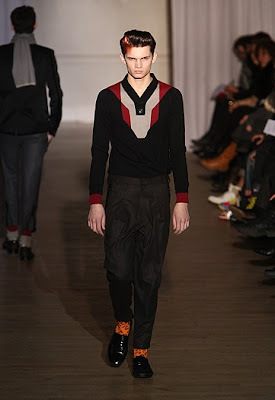 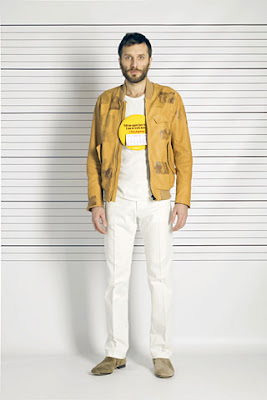 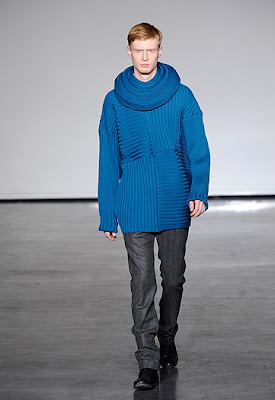 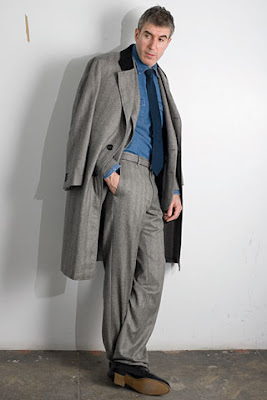 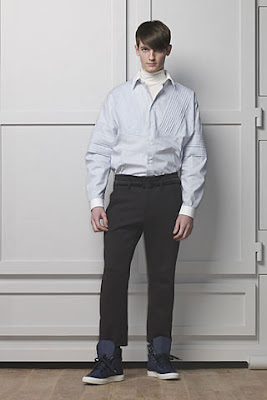 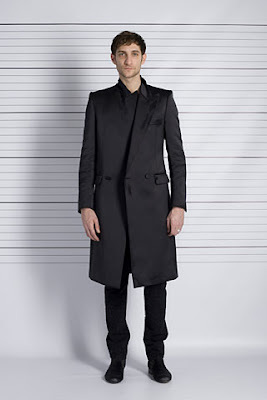 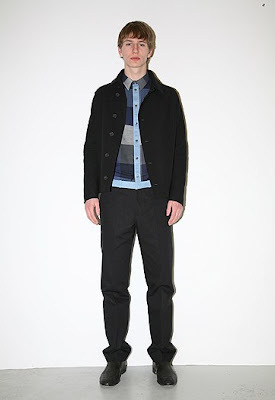 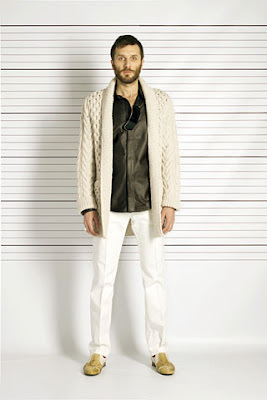 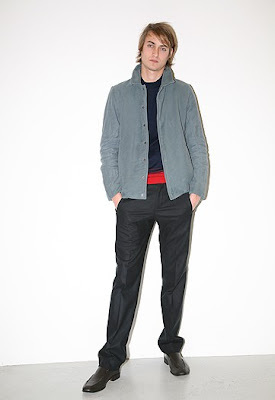 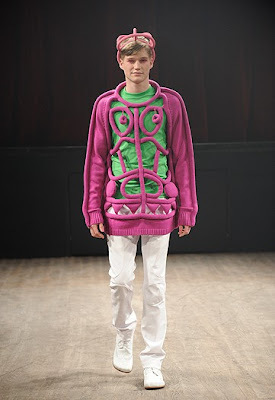 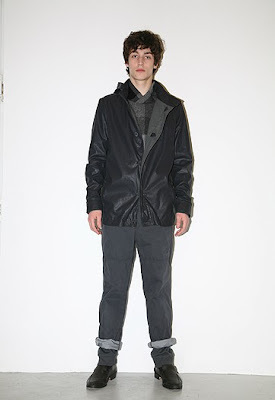 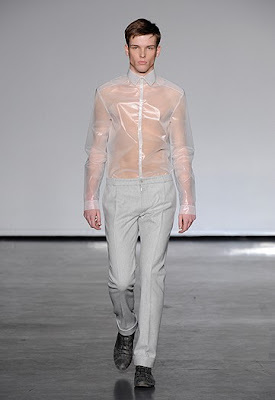 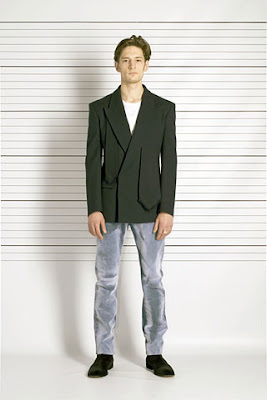 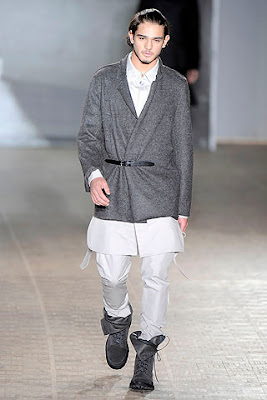 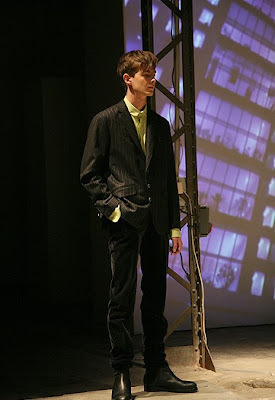 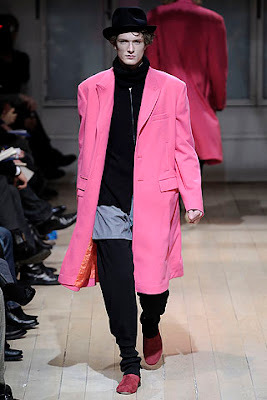 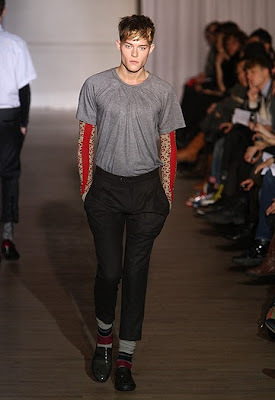 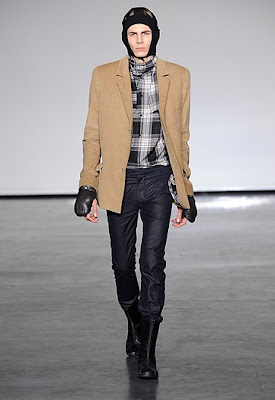 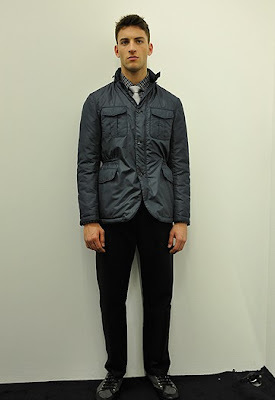 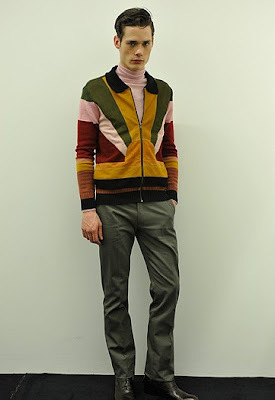 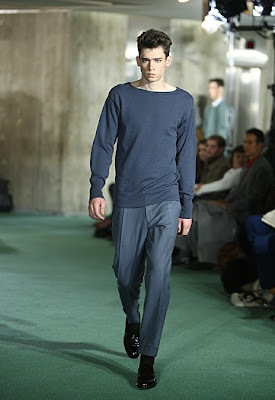 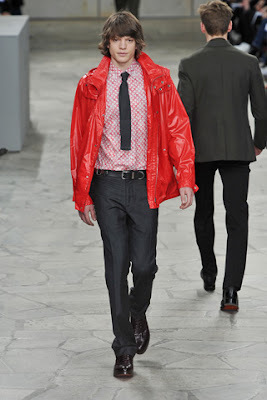 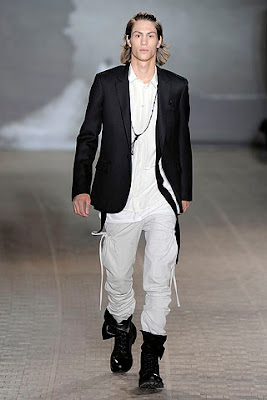 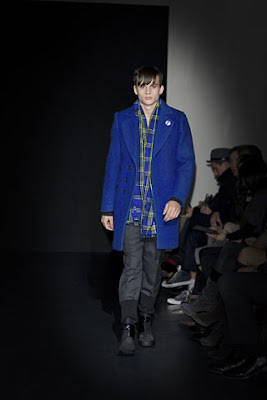 Raf Simons - I always love Raf creative way of showing new shapes and used of new fabrics. 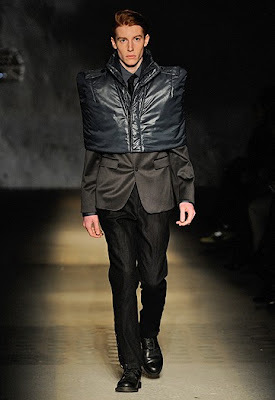 His shrugs looks so modern and new. 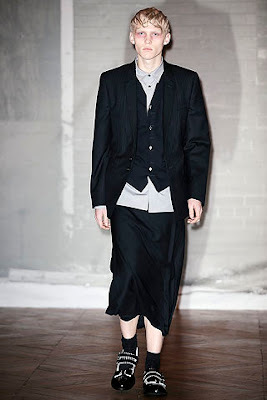 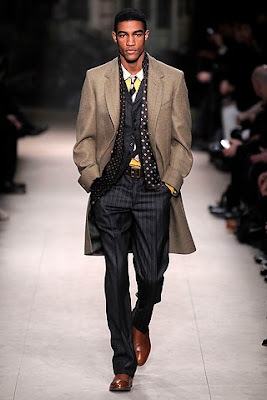 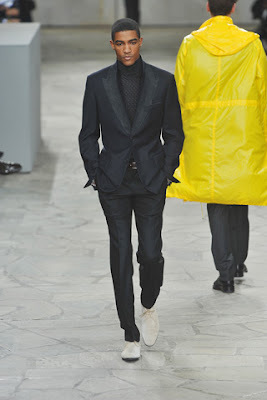 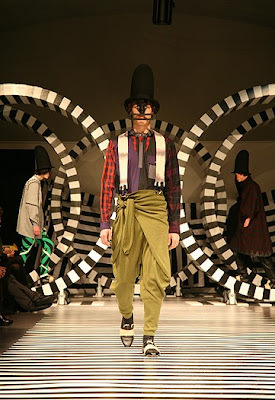 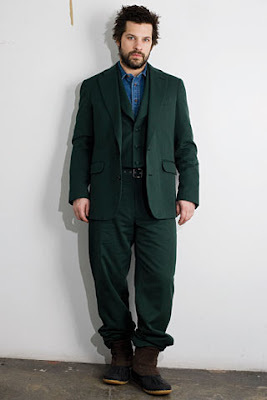 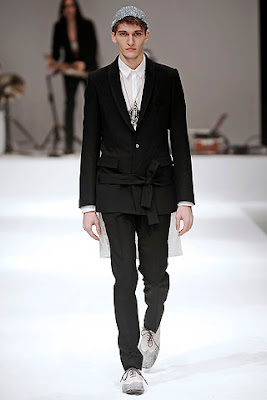 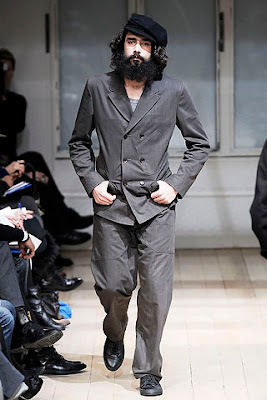 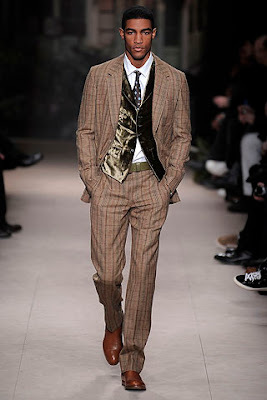 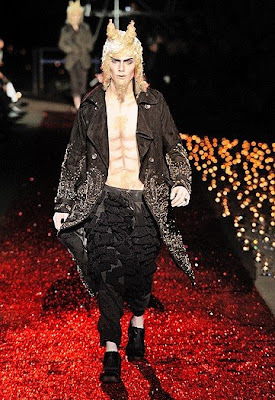 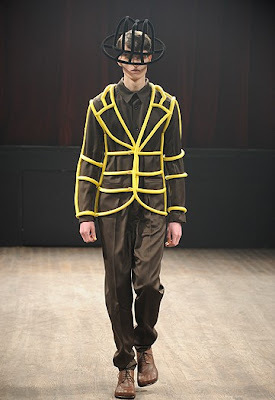 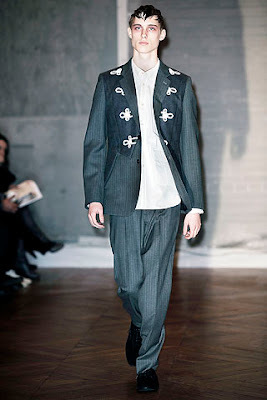 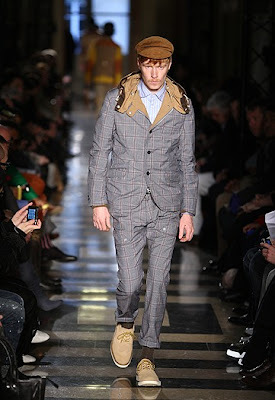 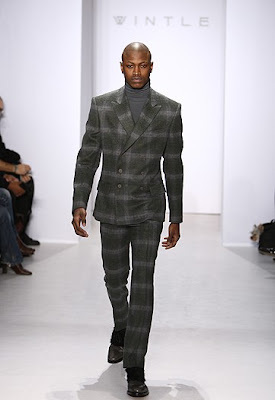 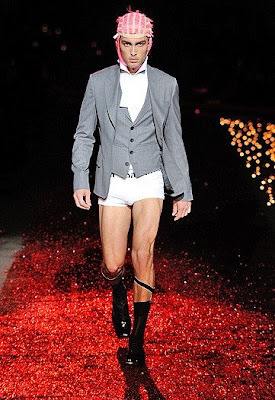 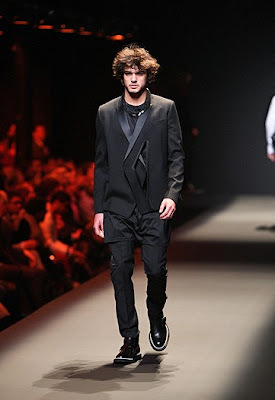 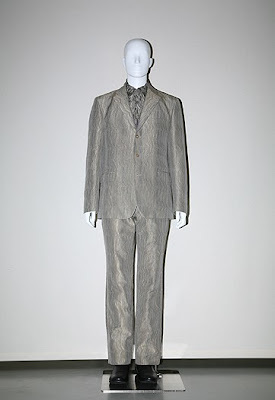 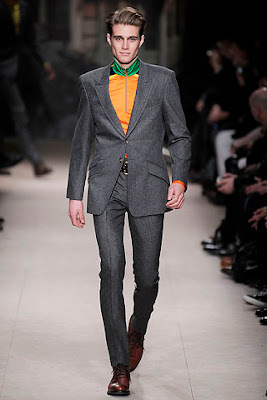 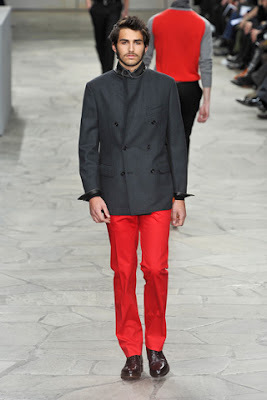 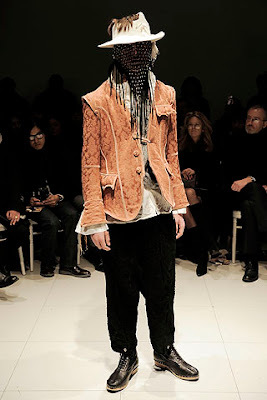 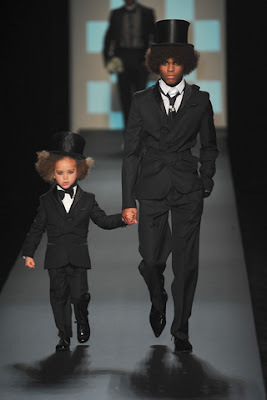 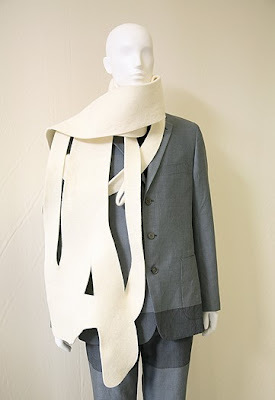 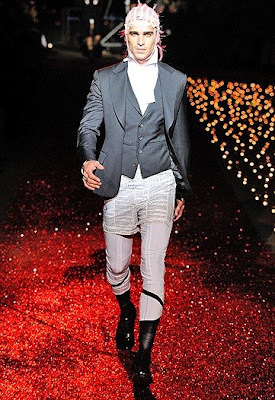 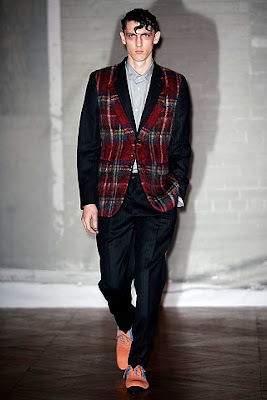 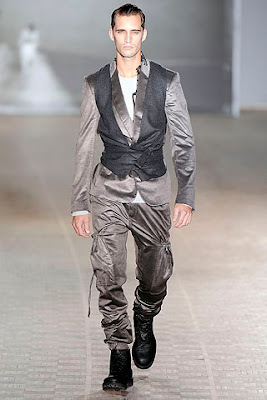 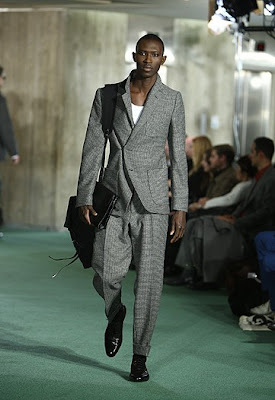 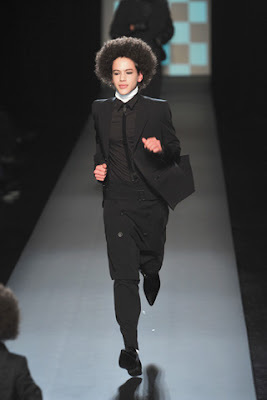 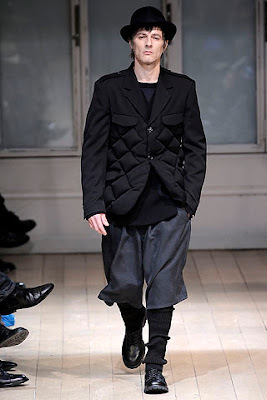 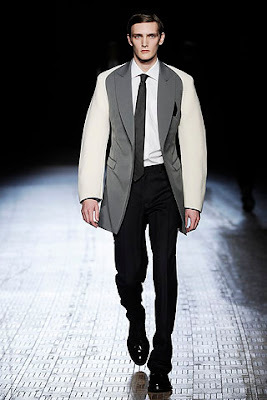 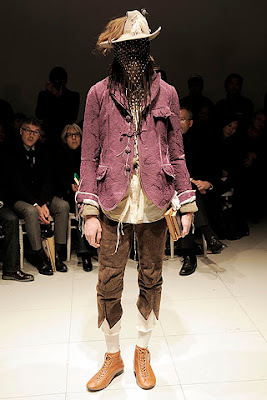 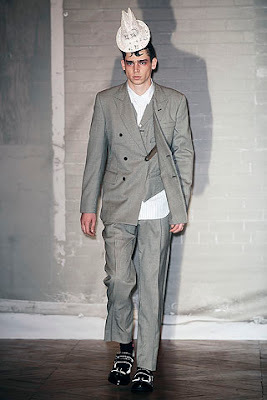 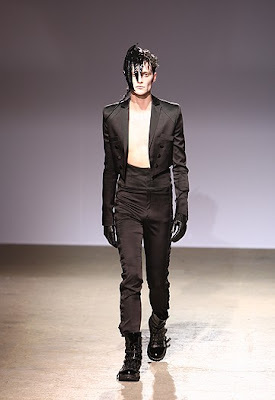 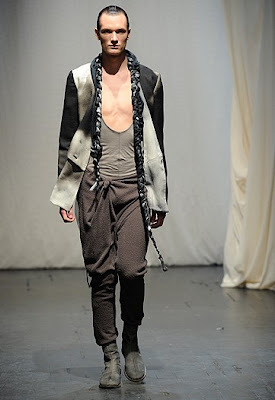 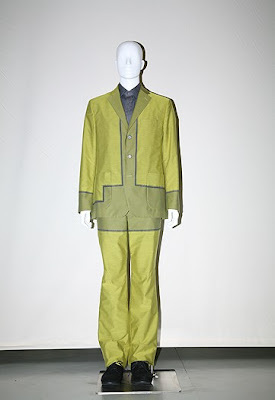 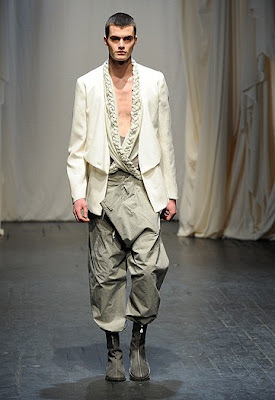 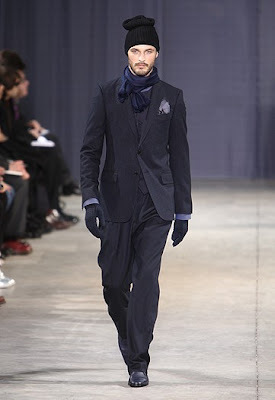 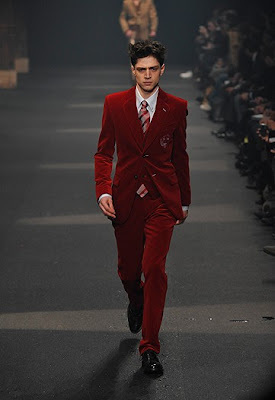 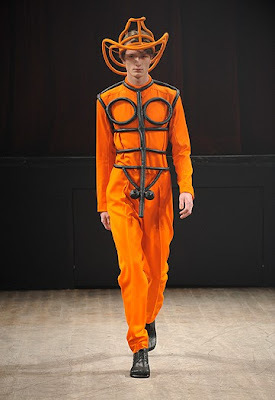 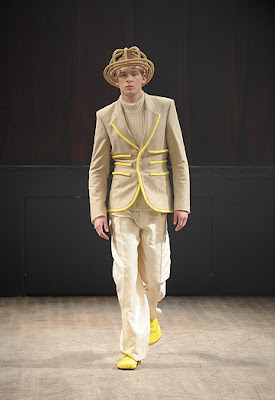 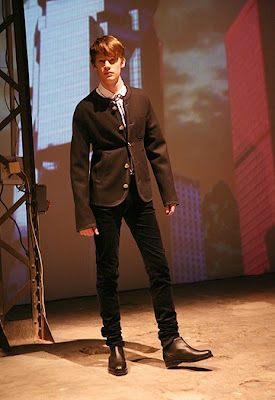 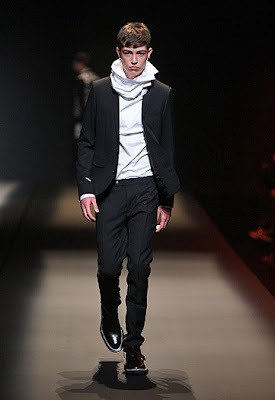 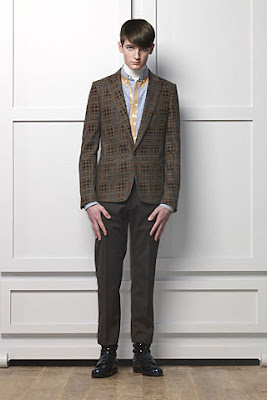 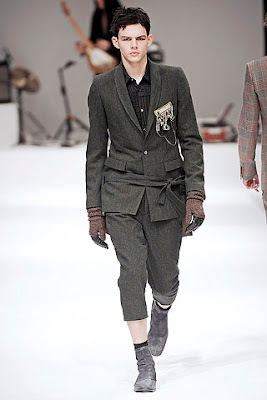 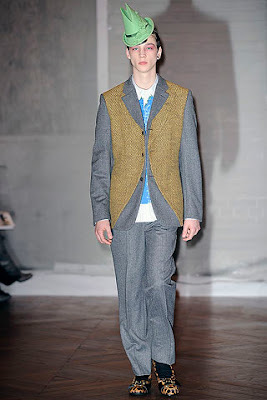 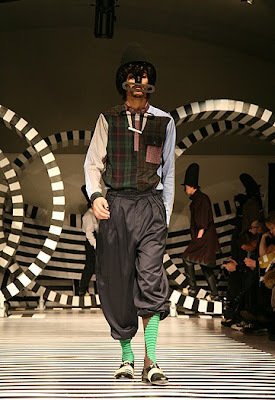 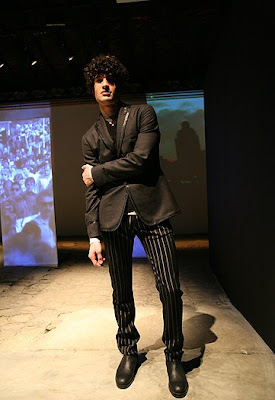 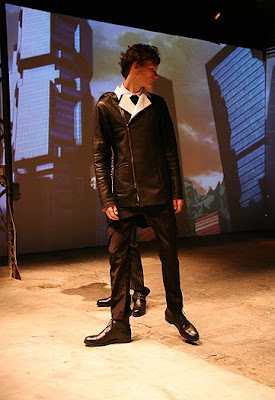 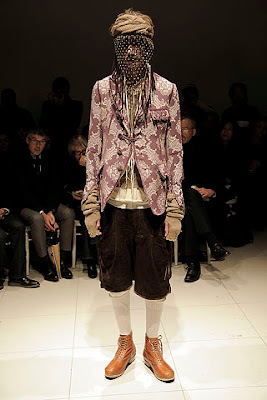 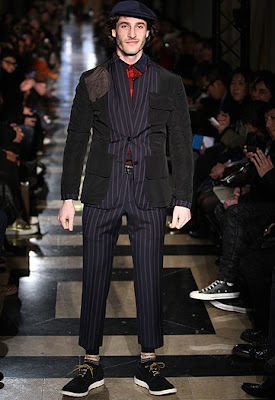 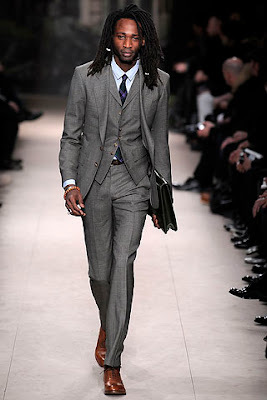 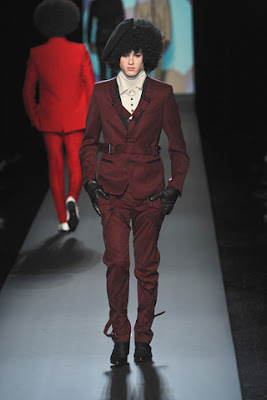 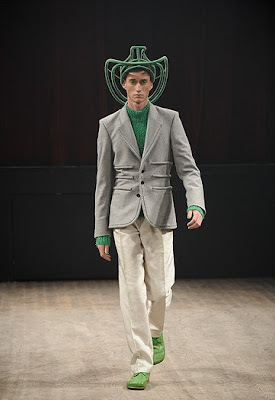 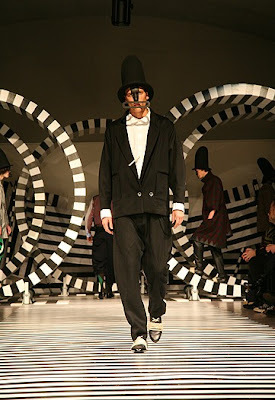 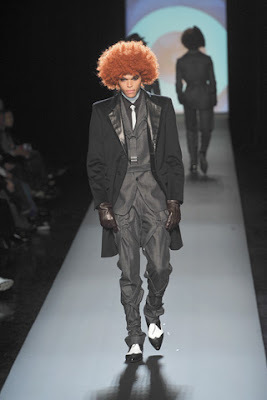 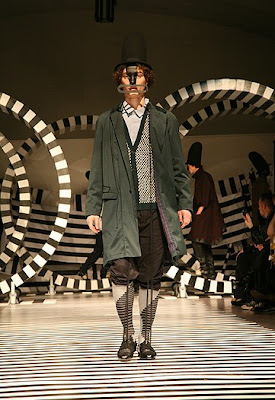 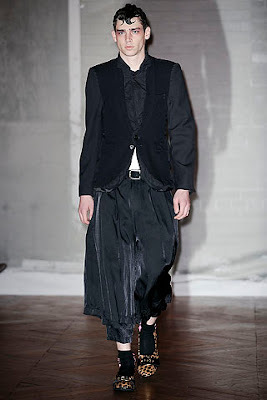 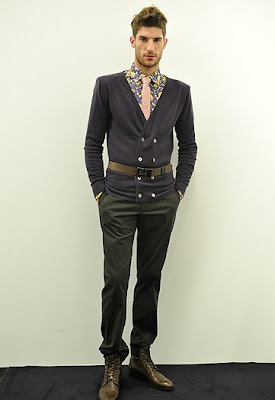 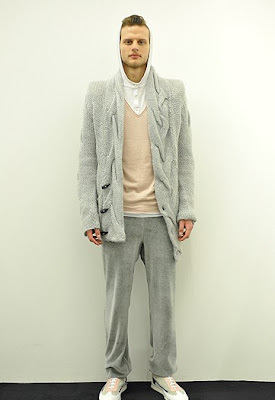 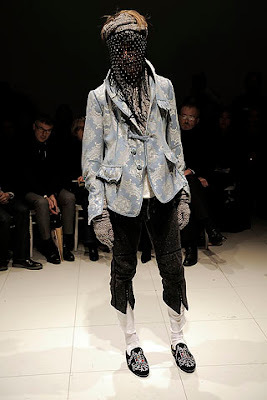 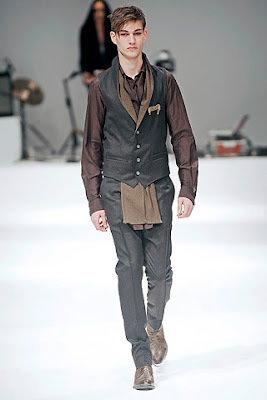 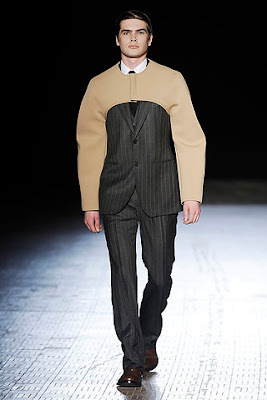 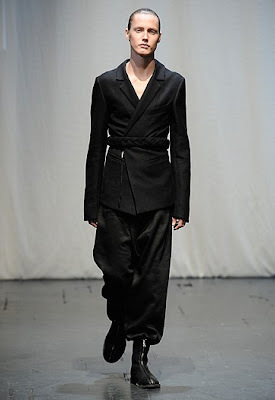 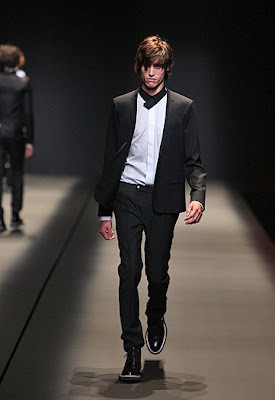 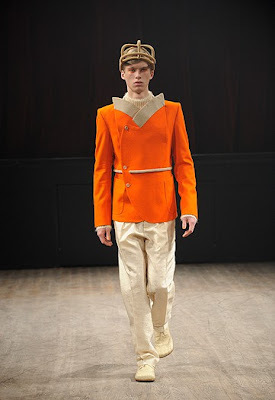 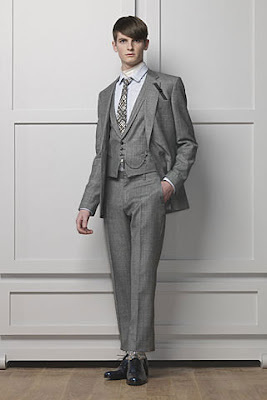 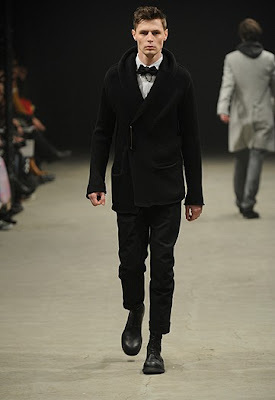 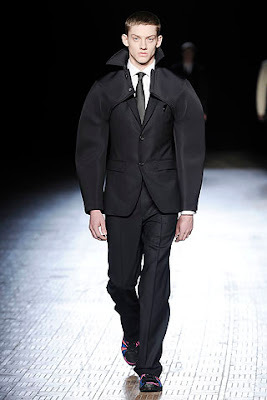 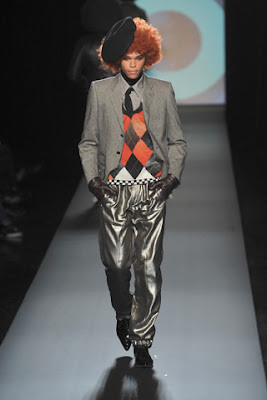 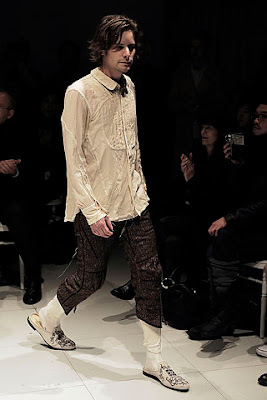 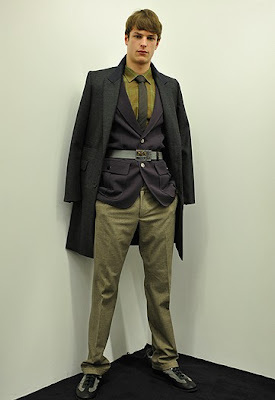 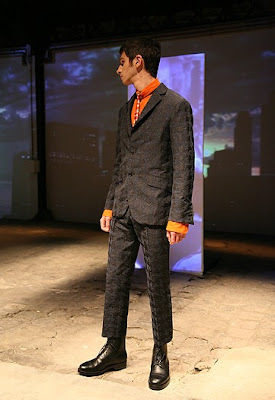 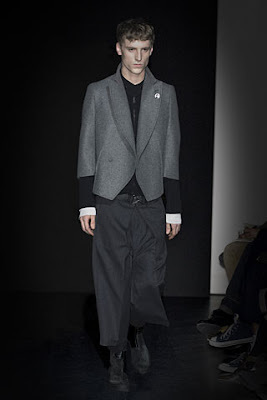 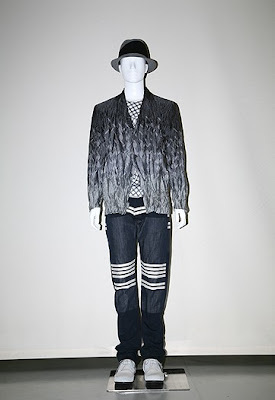 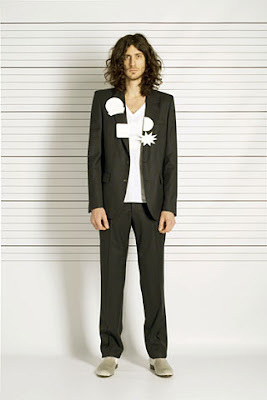 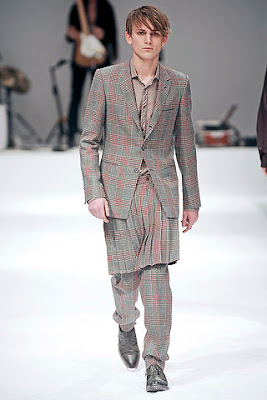 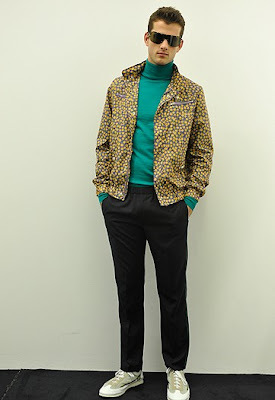 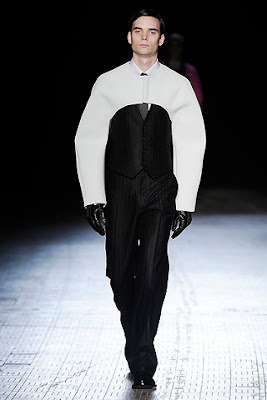 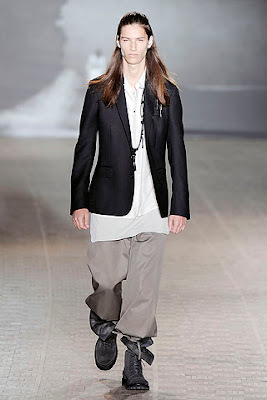 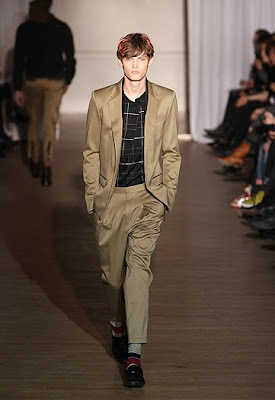 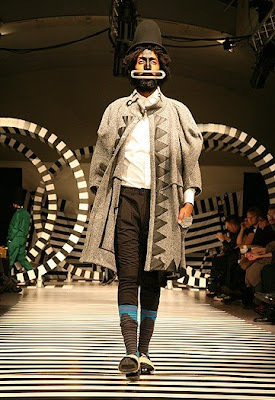 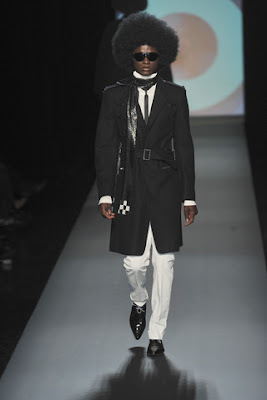 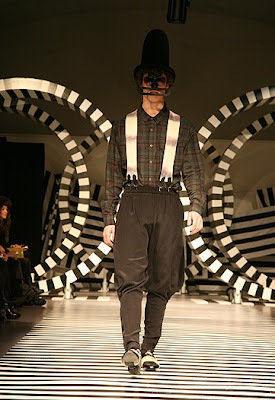 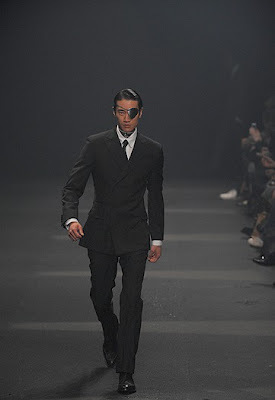 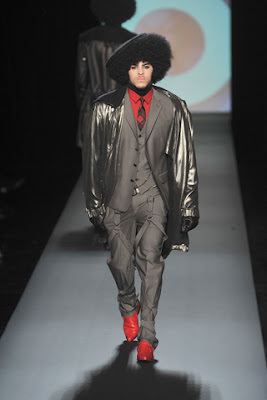 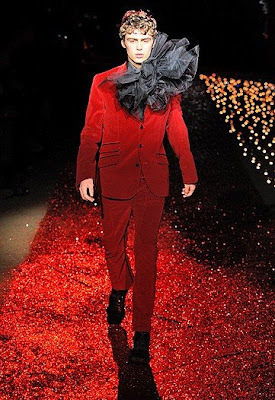 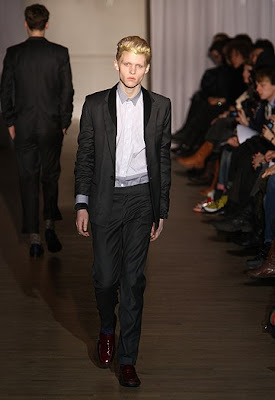 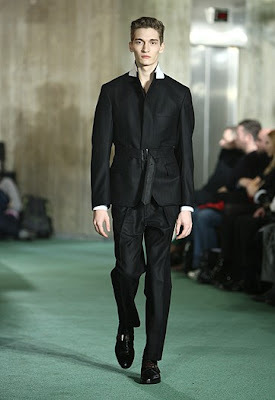 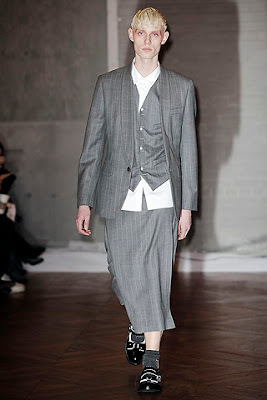 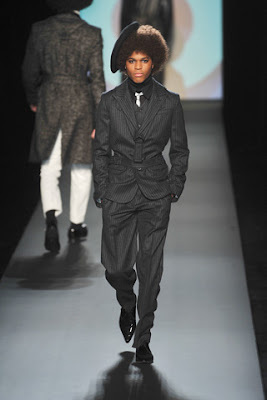 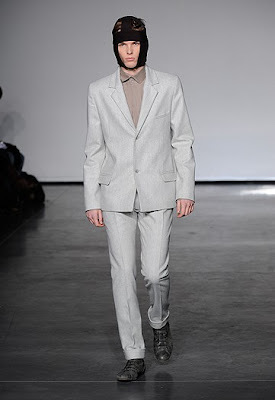 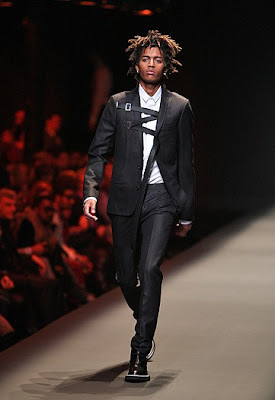 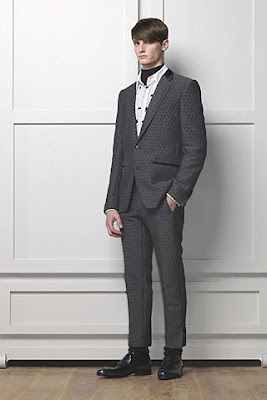 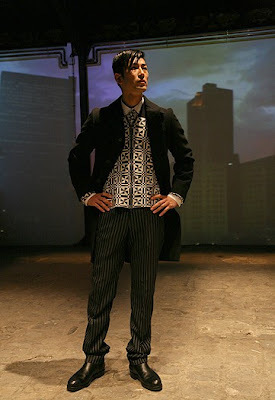 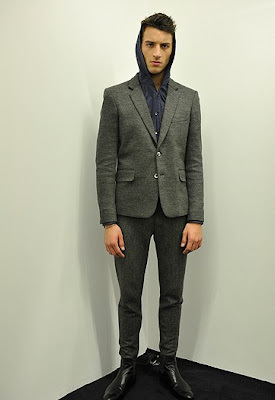 I really the stunning mixing of two different fabrics for suits,a similar concept to Rei Kawakubos' Comme des Garcons. 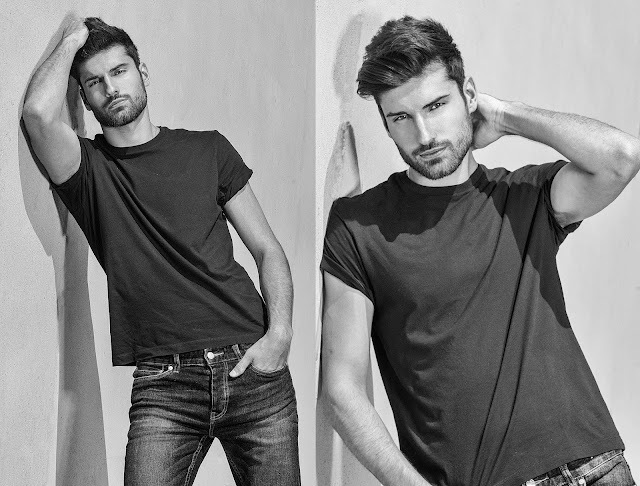 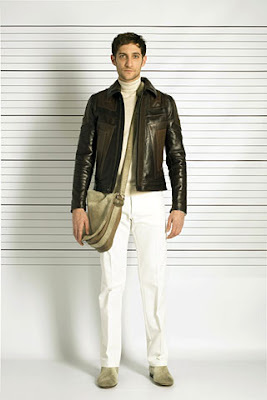 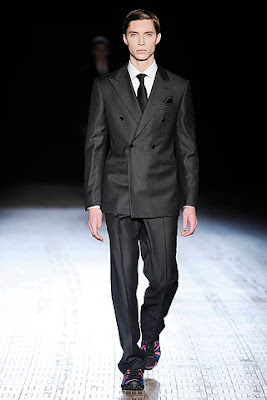 3) Hugo boss – I love the ultra sleek and sharp clothes. 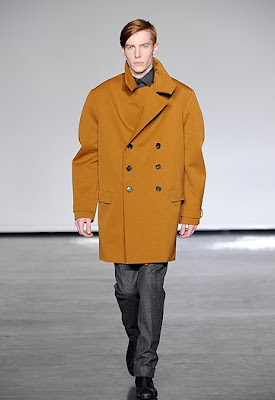 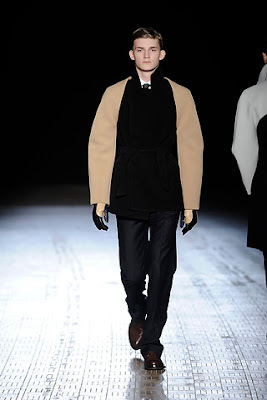 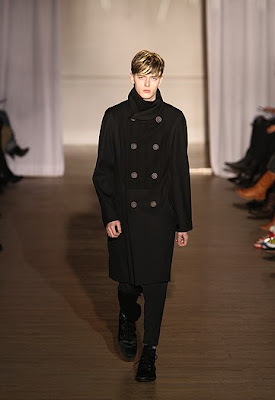 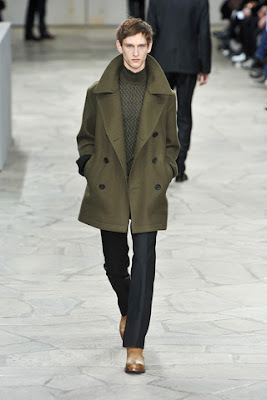 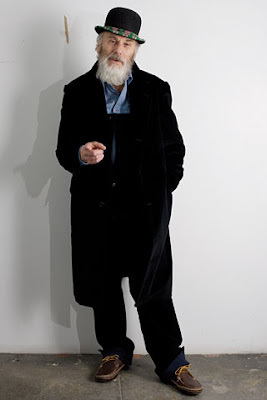 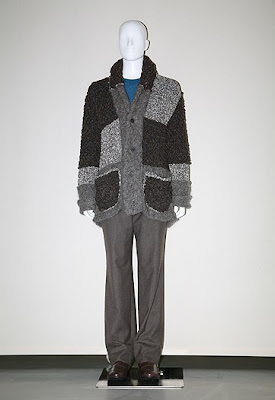 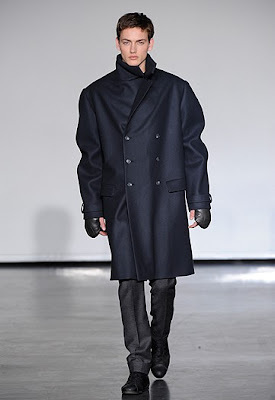 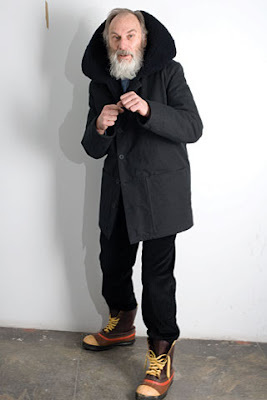 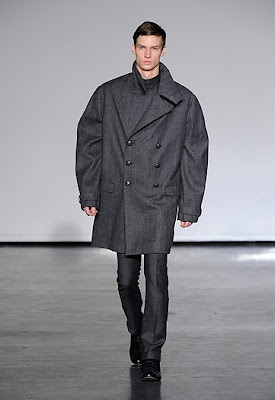 I love all the coats and jacket from this ultra minimalist show. 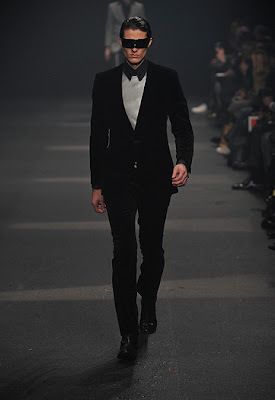 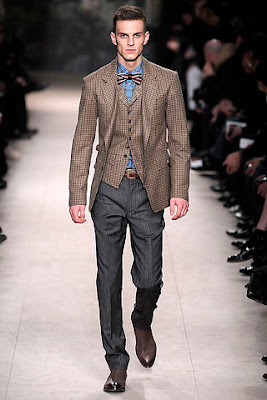 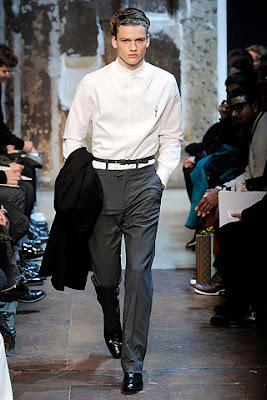 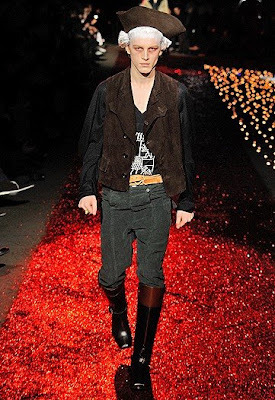 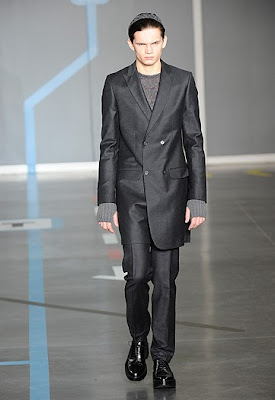 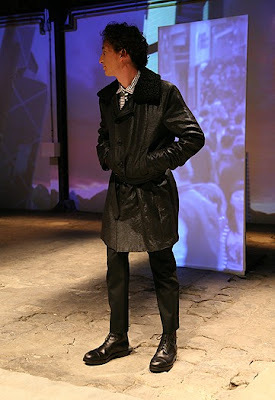 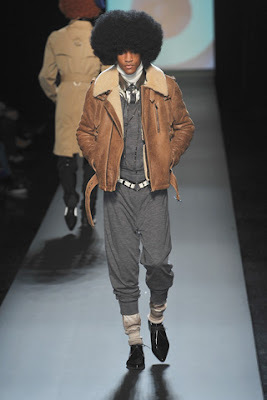 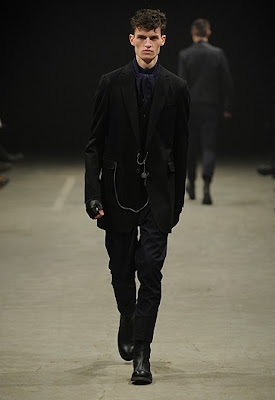 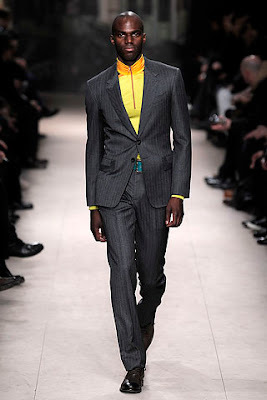 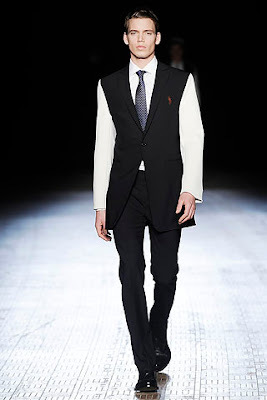 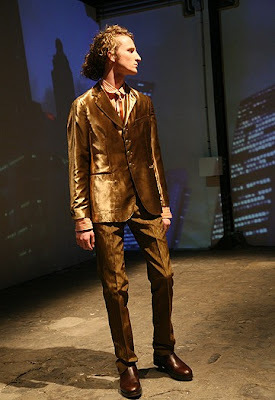 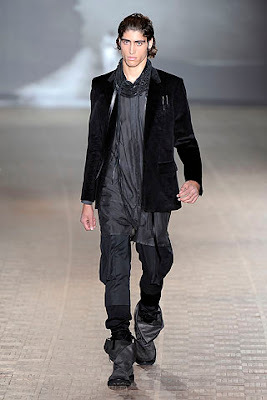 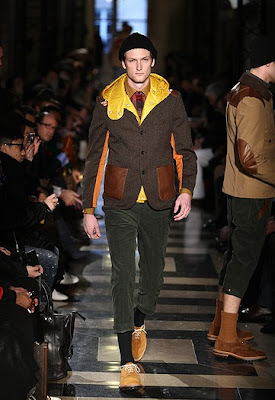 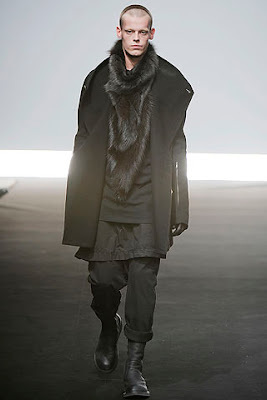 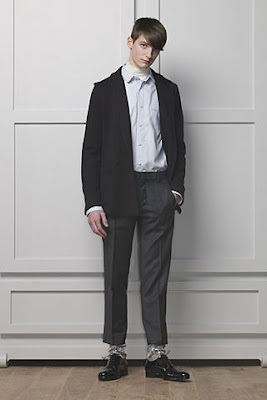 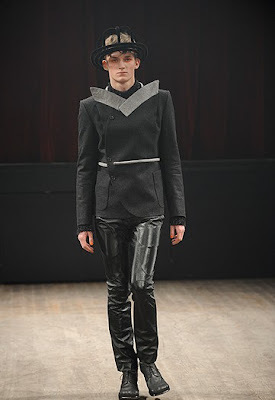 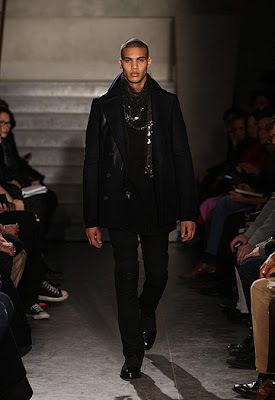 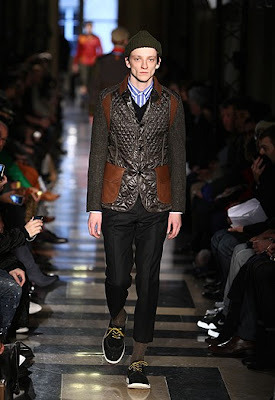 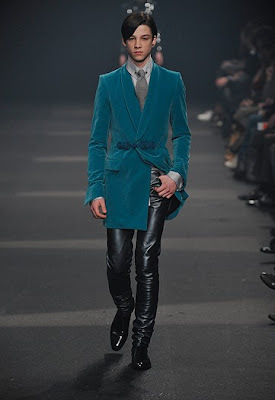 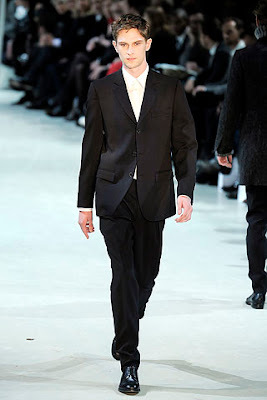 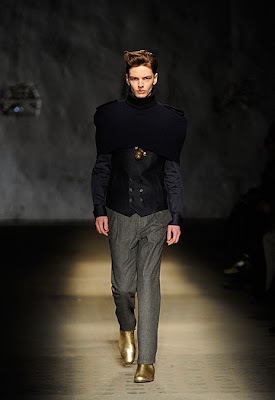 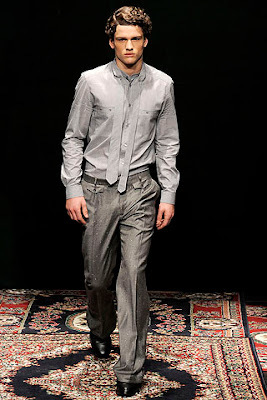 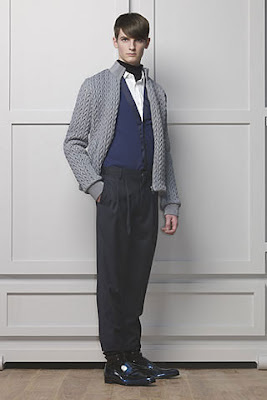 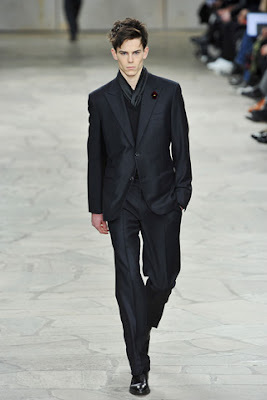 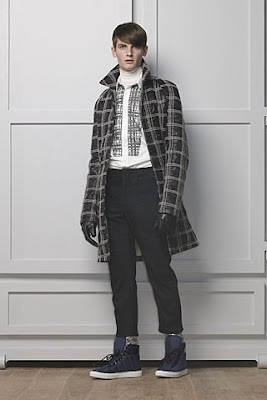 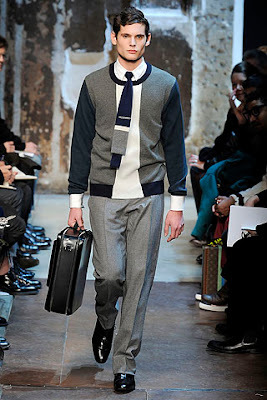 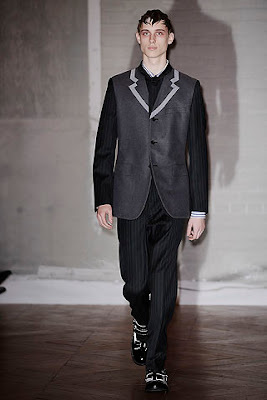 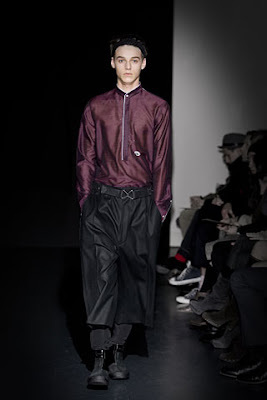 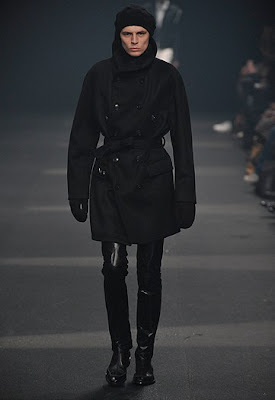 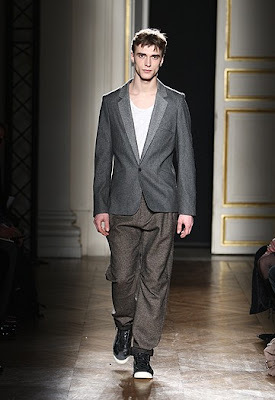 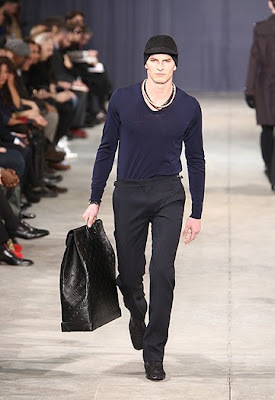 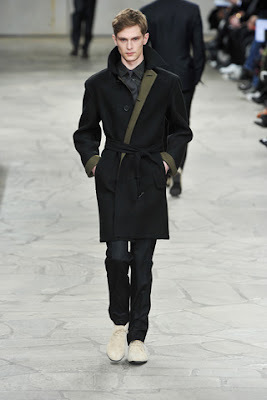 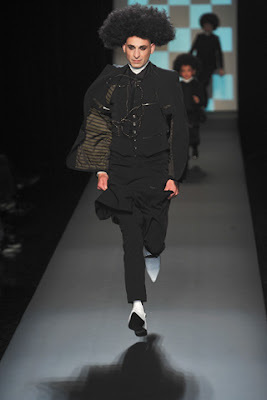 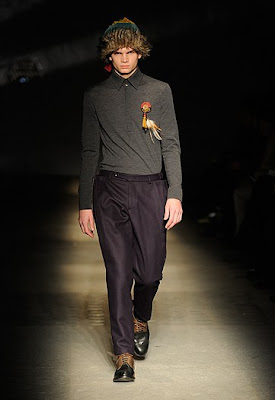 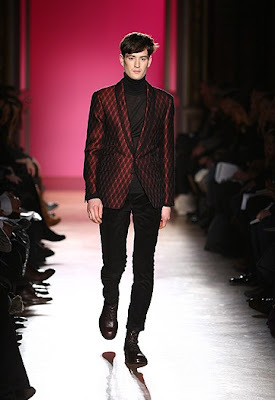 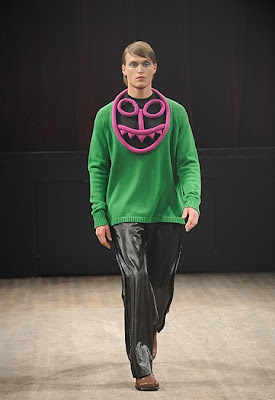 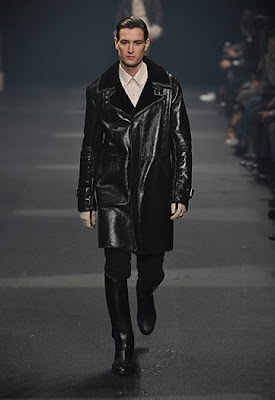 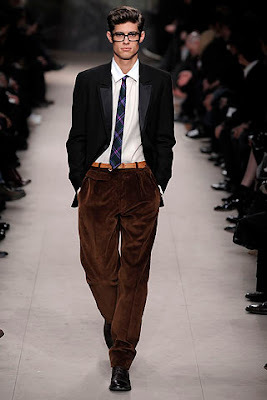 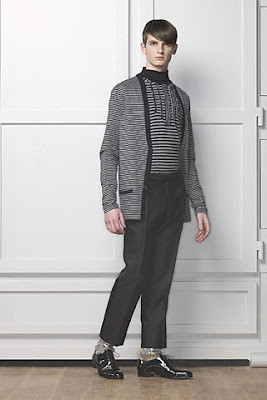 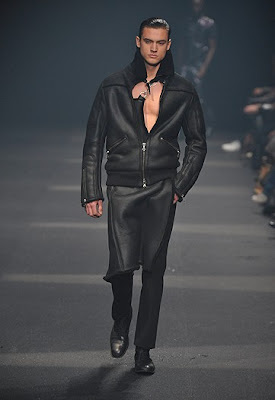 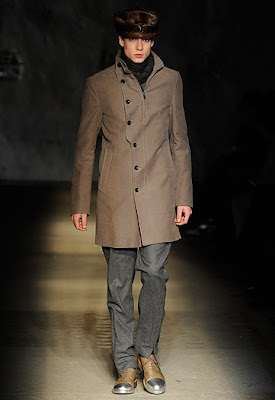 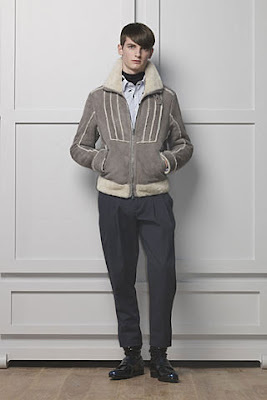 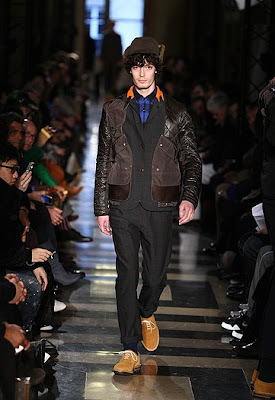 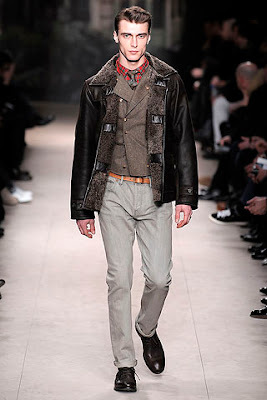 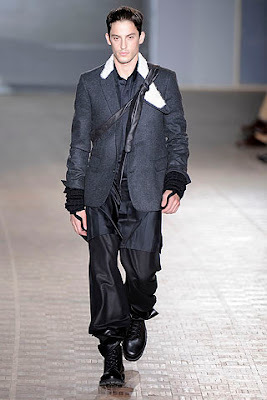 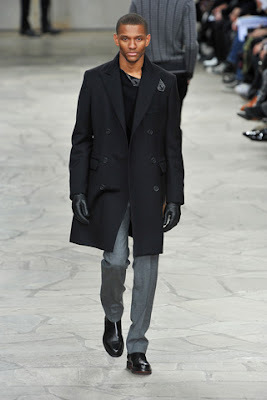 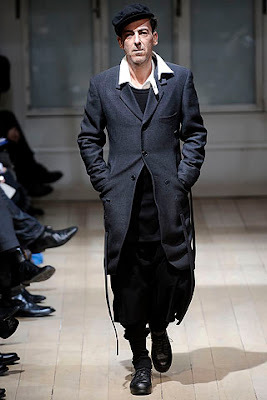 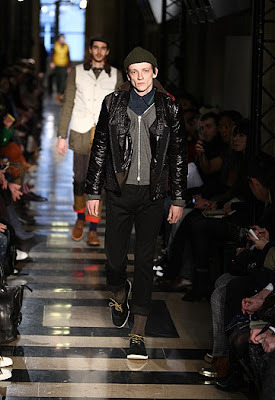 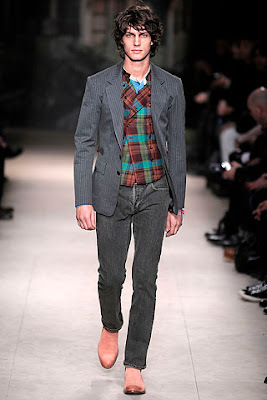 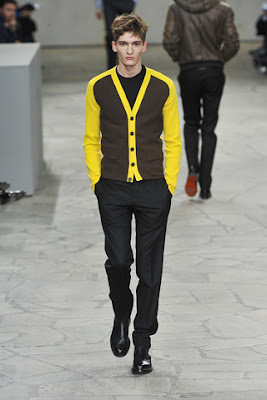 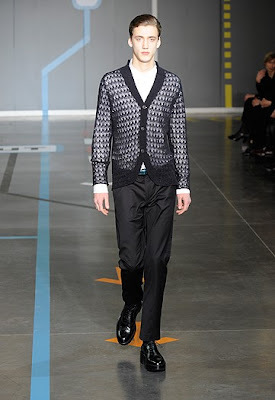 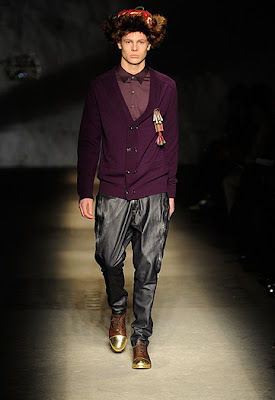 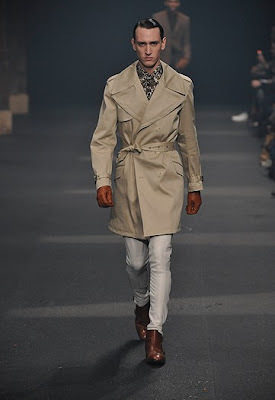 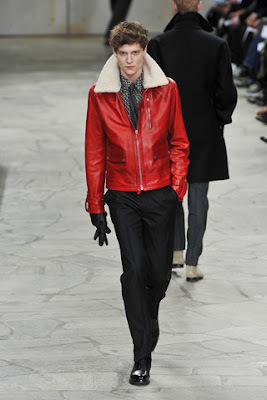 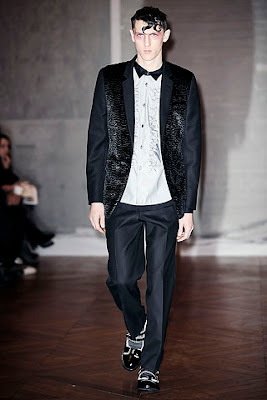 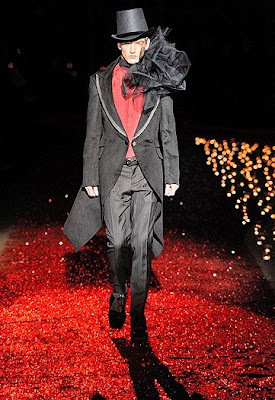 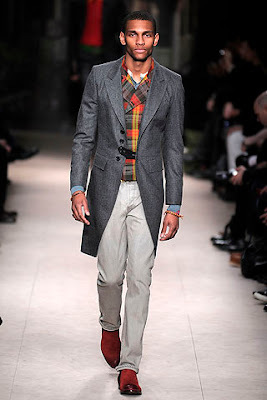 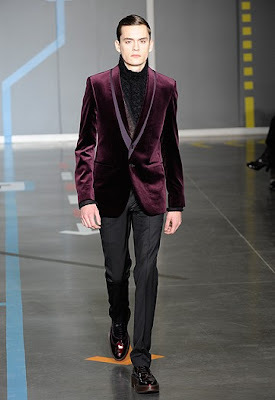 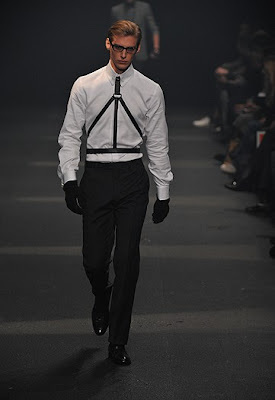 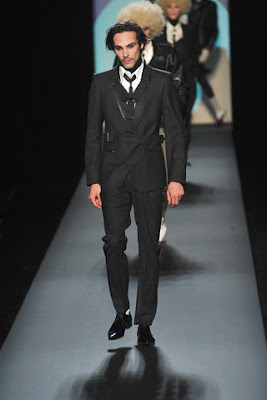 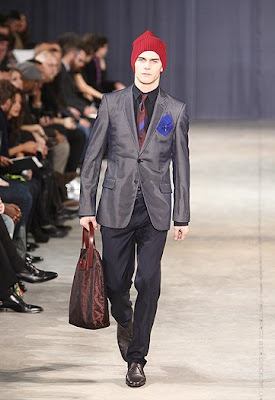 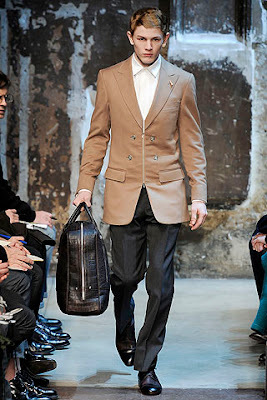 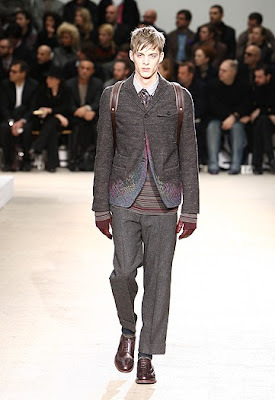 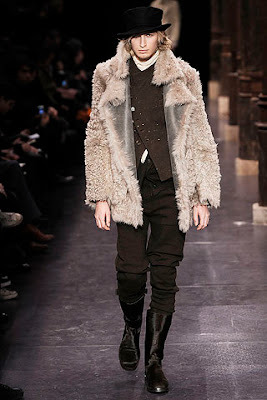 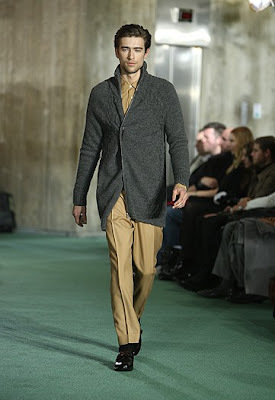 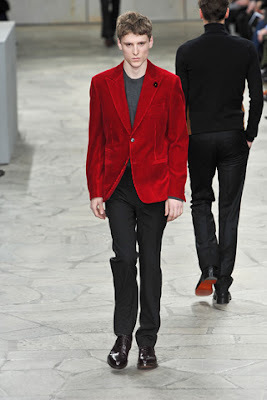 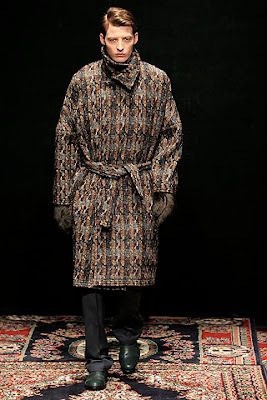 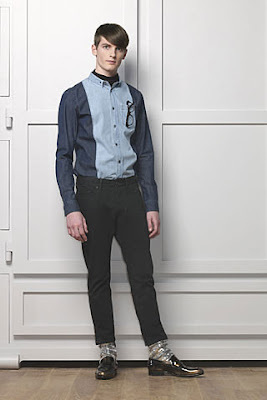 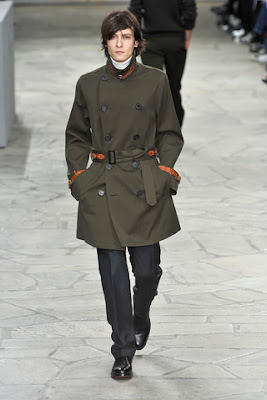 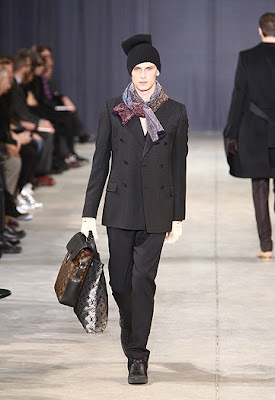 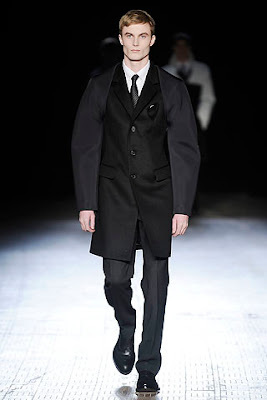 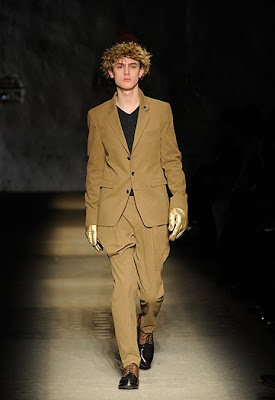 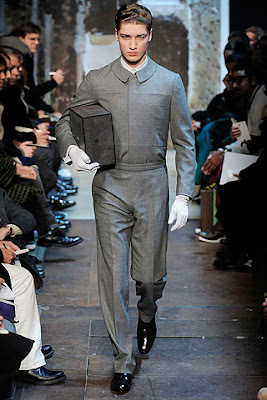 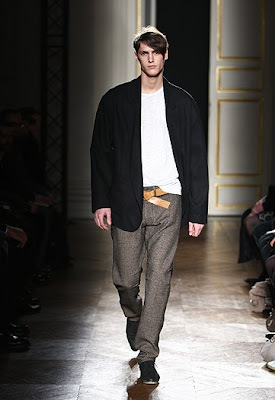 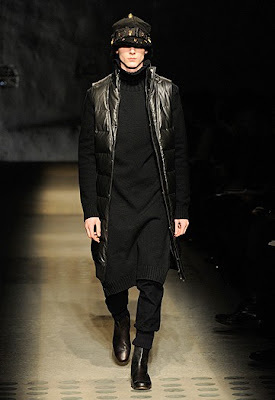 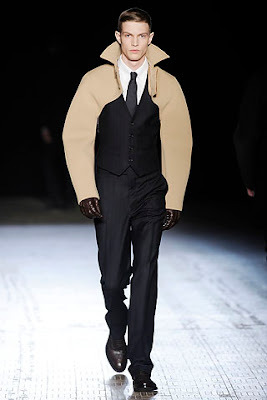 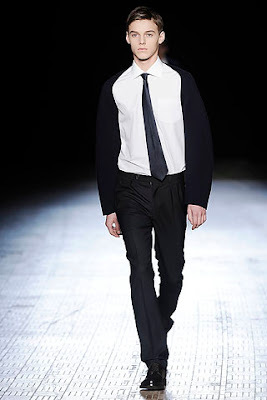 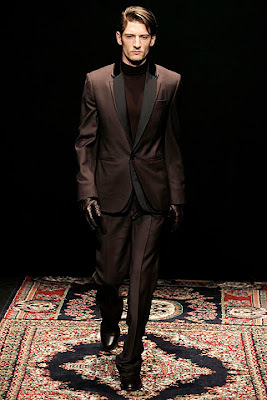 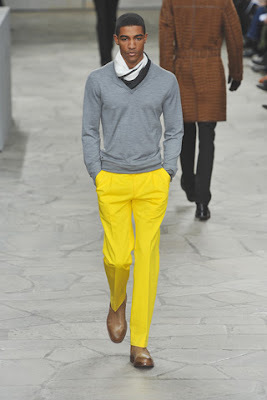 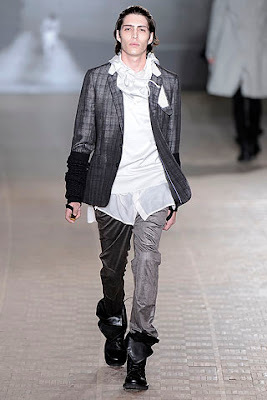 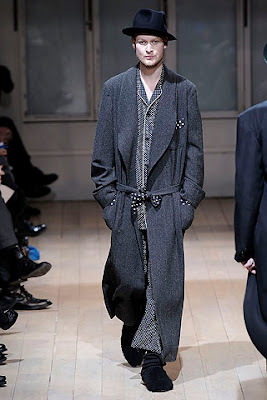 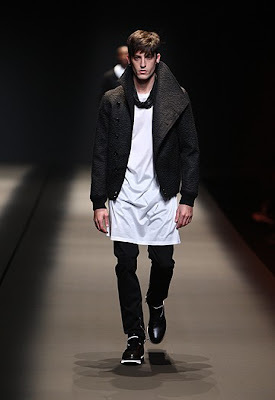 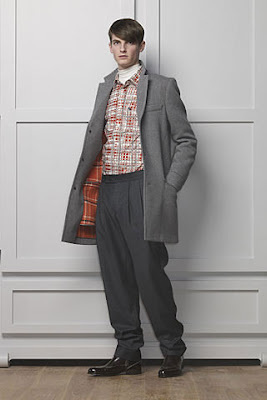 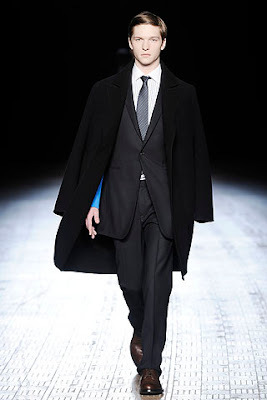 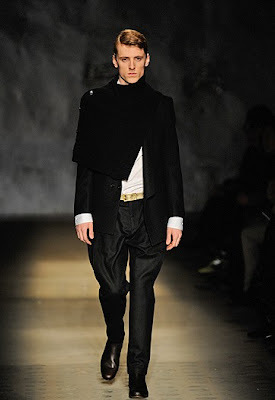 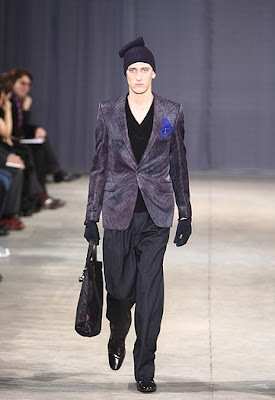 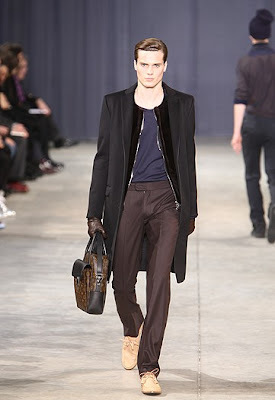 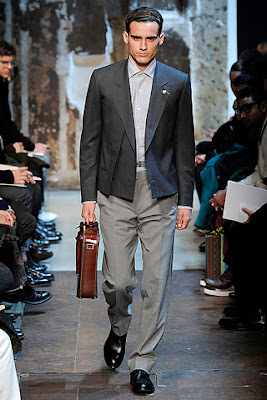 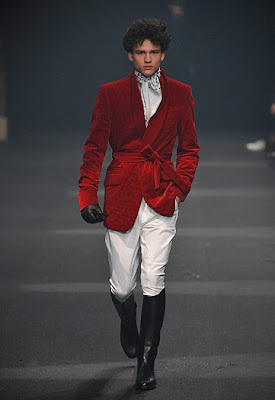 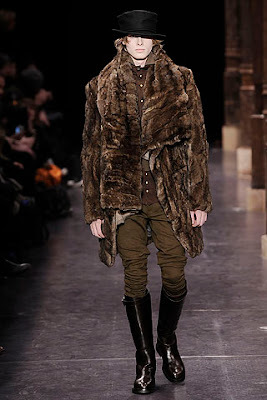 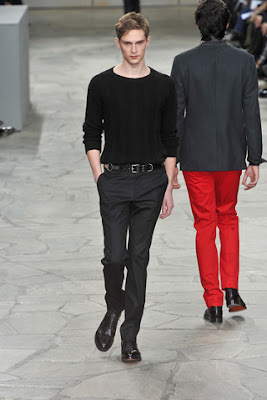 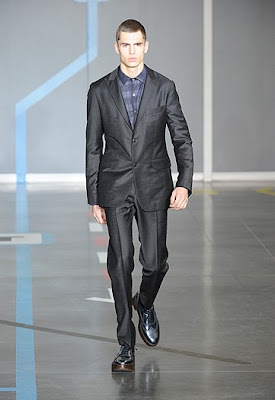 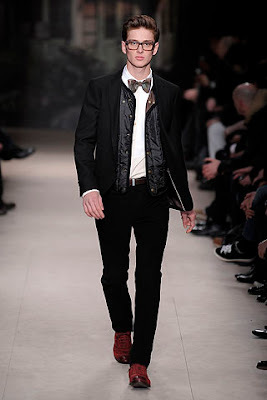 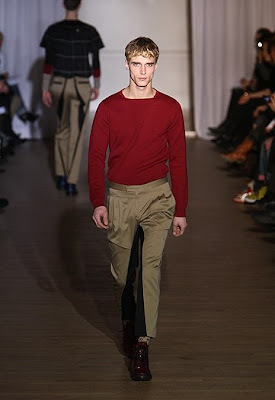 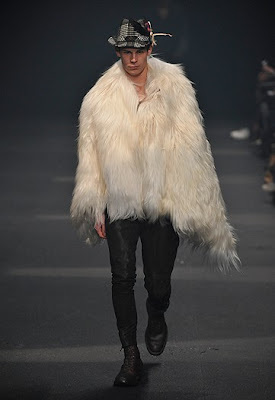 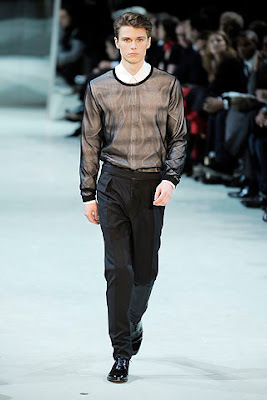 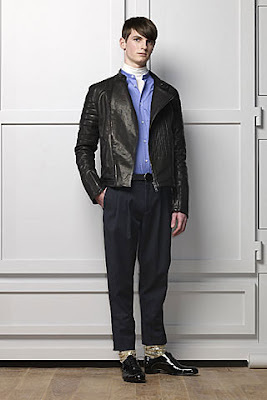 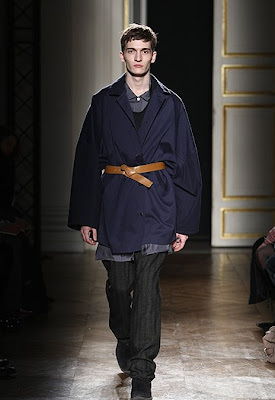 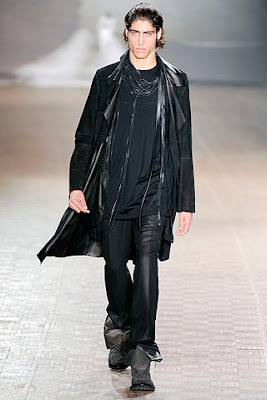 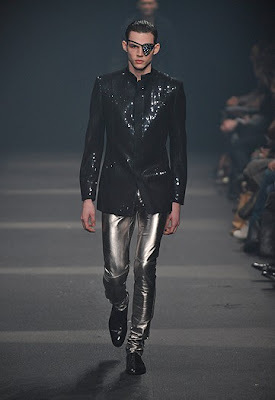 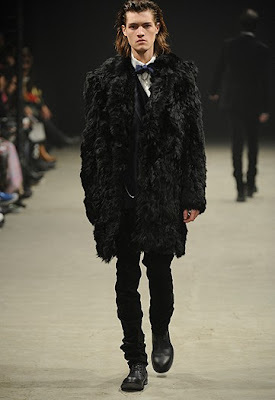 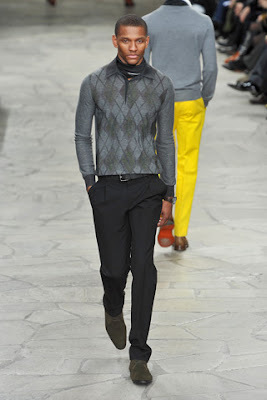 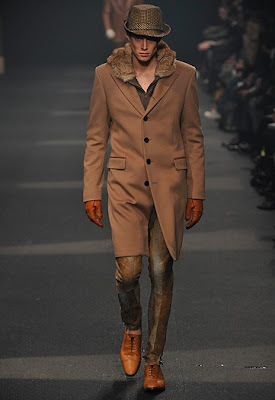 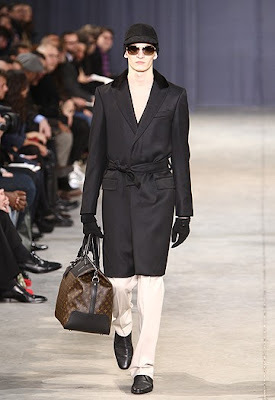 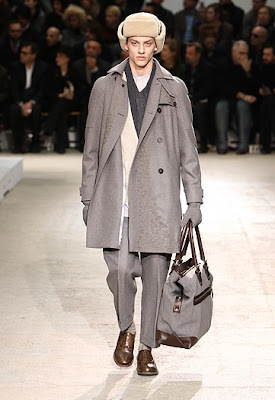 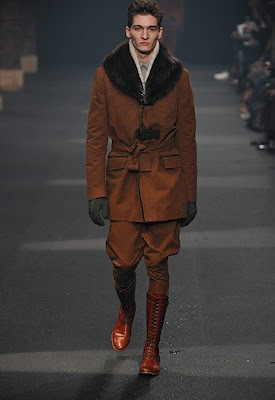 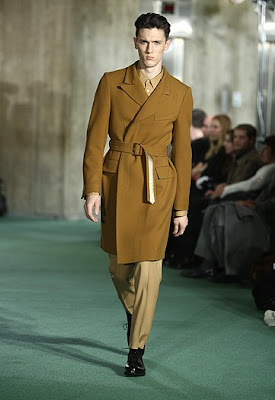 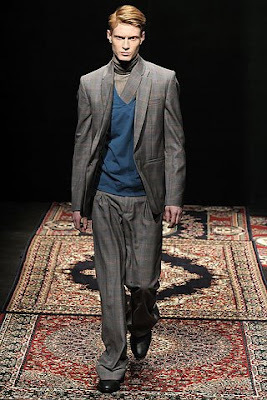 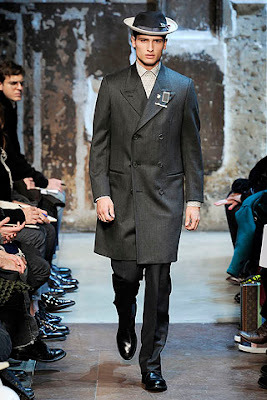 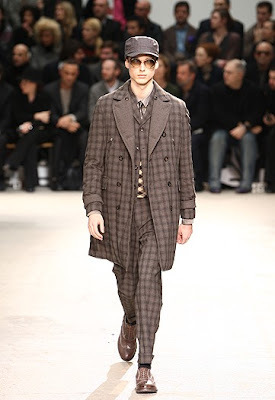 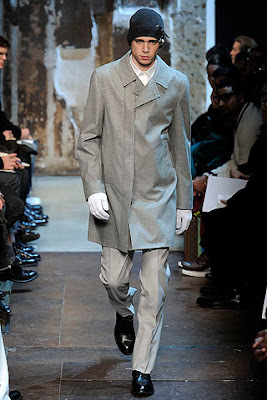 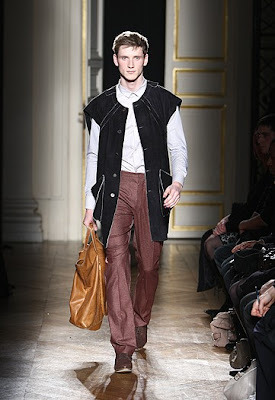 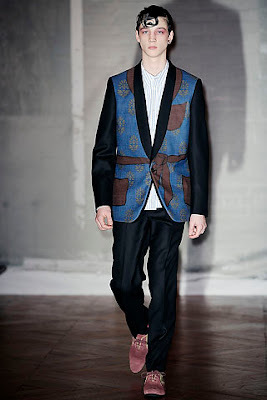 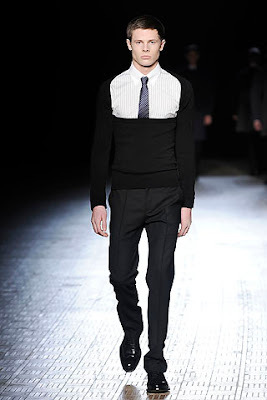 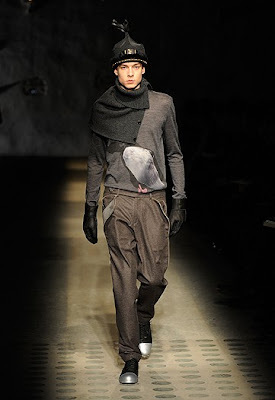 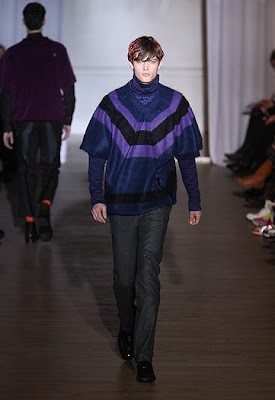 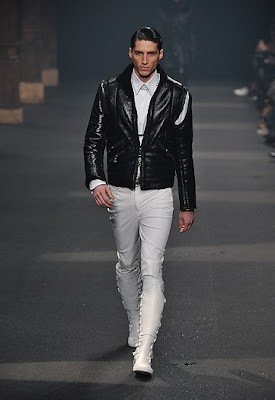 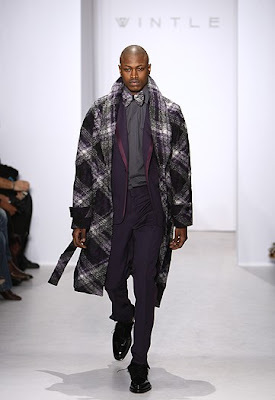 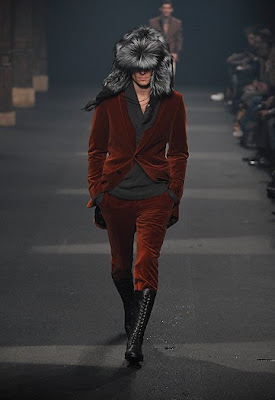 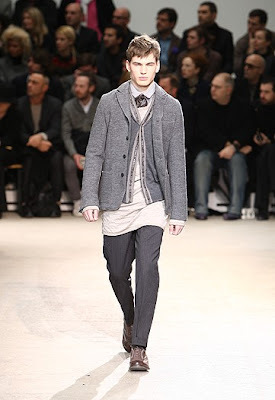 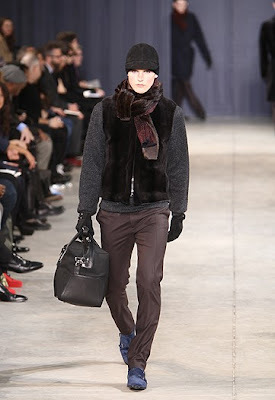 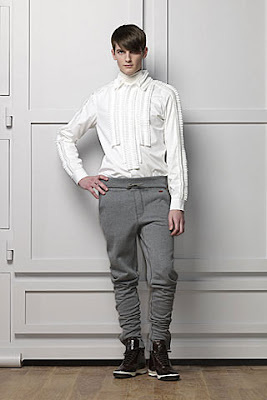 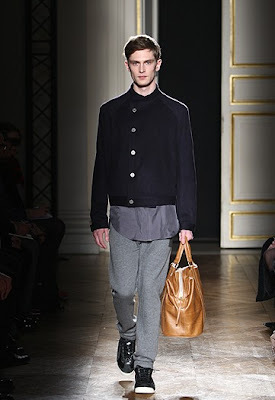 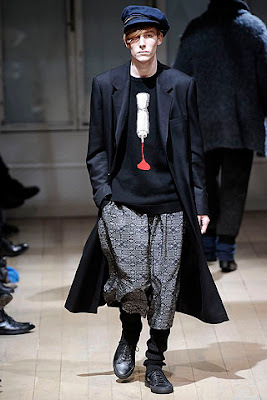 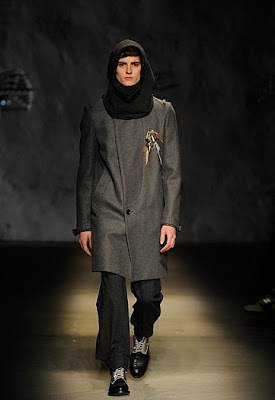 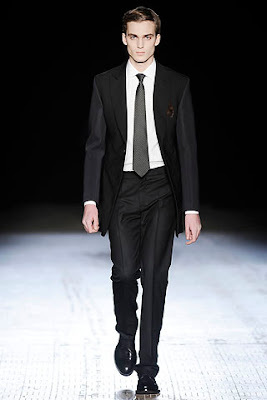 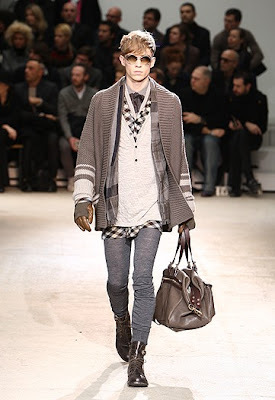 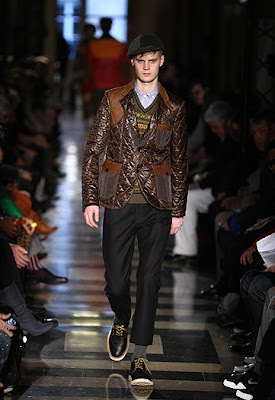 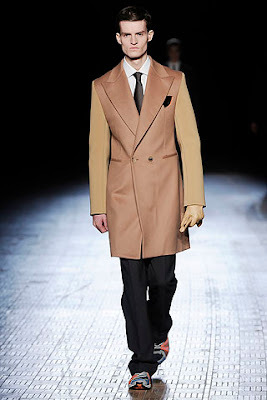 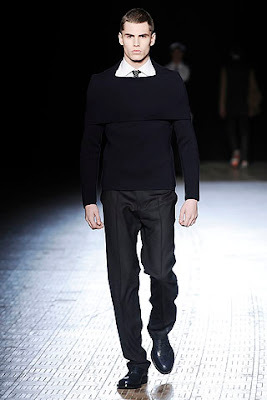 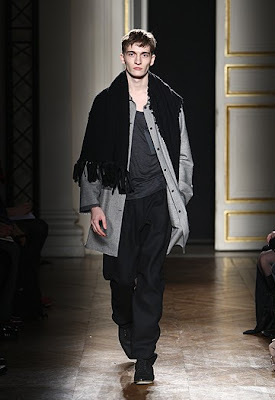 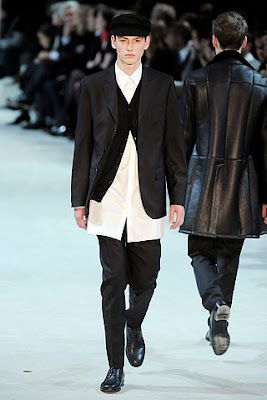 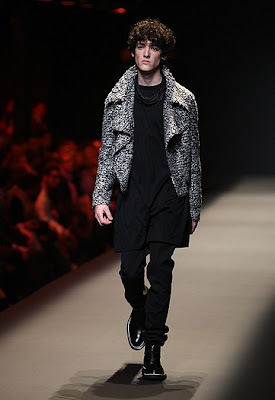 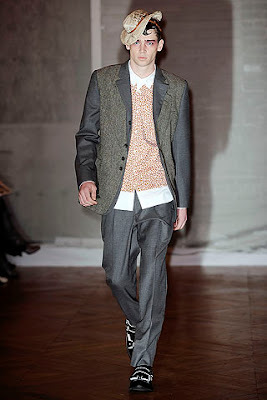 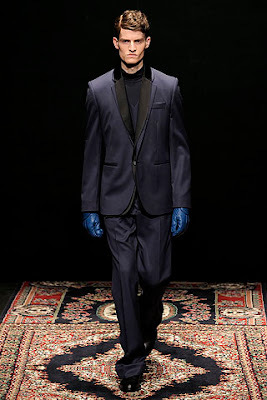 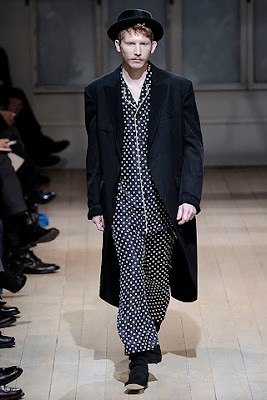 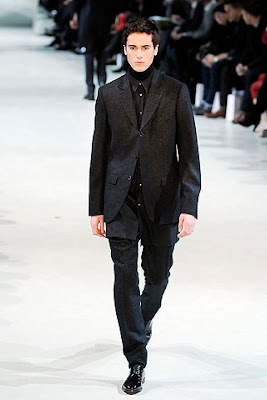 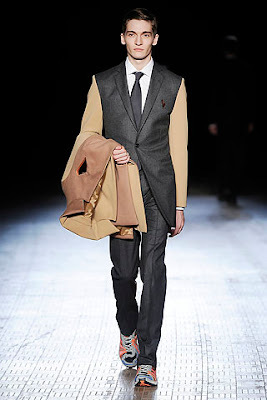 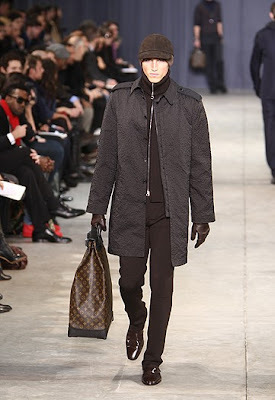 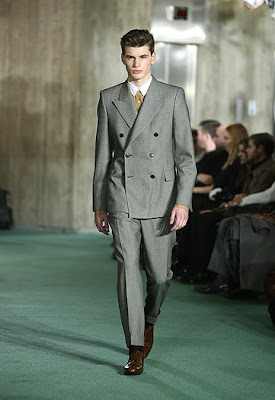 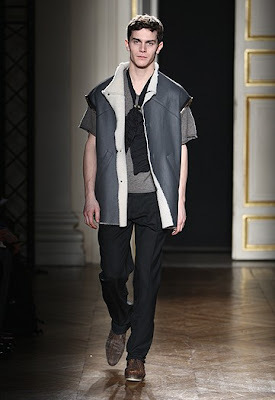 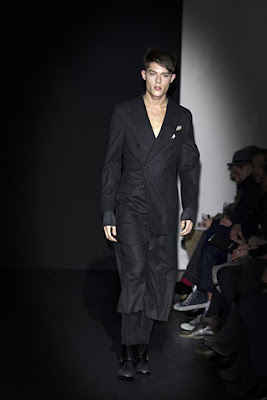 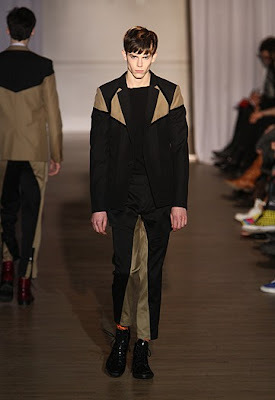 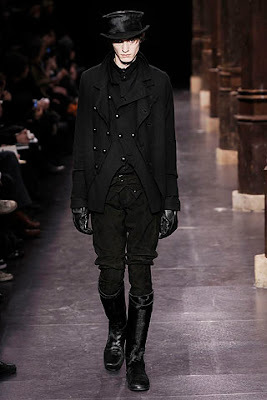 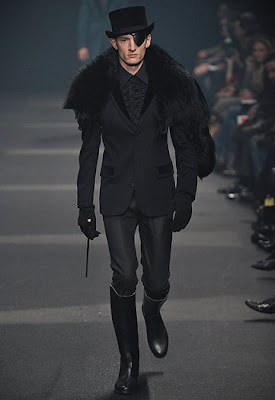 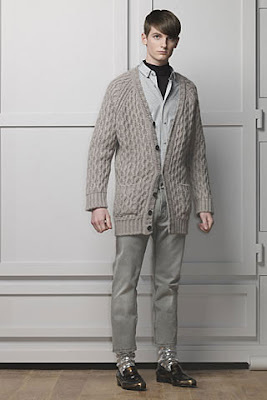 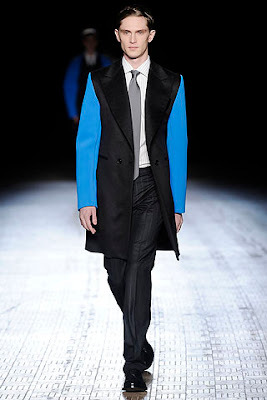 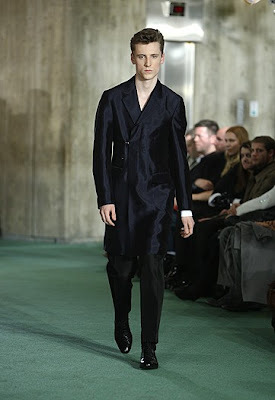 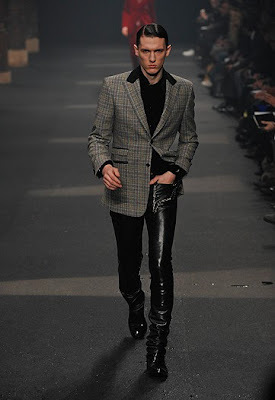 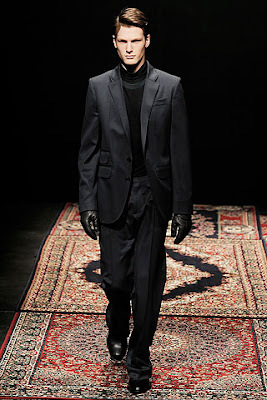 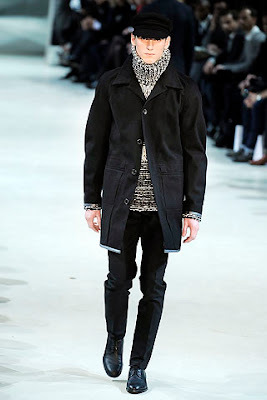 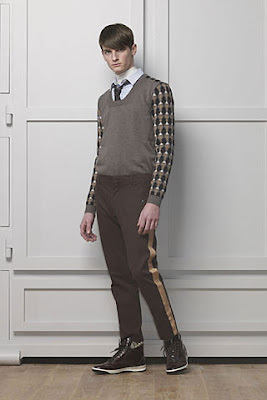 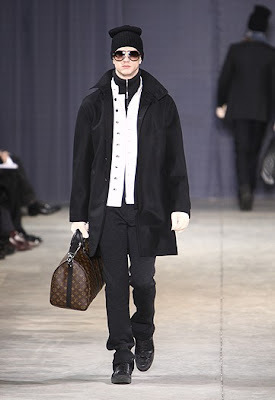 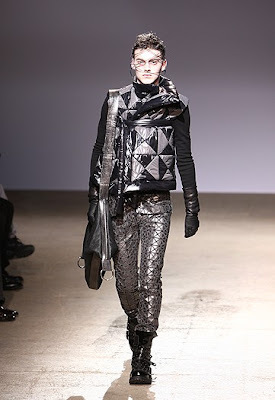 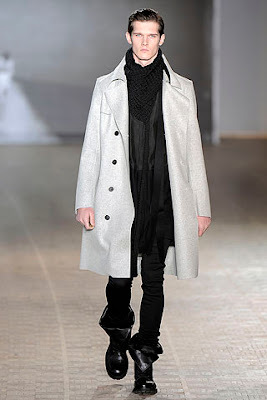 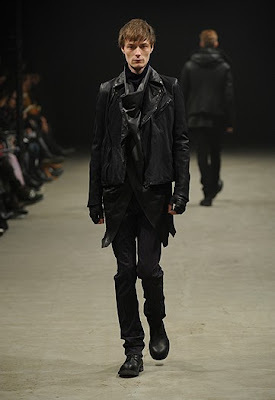 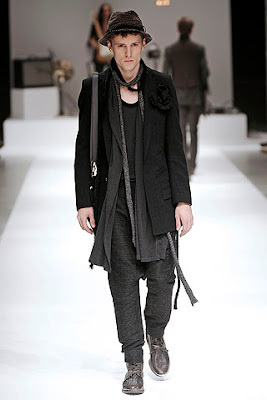 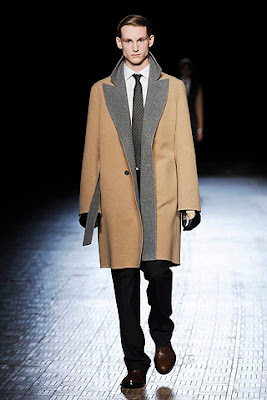 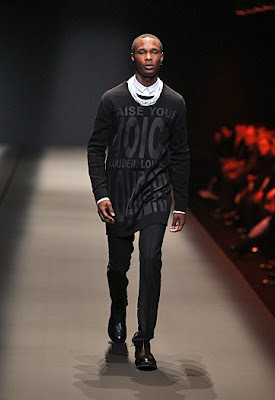 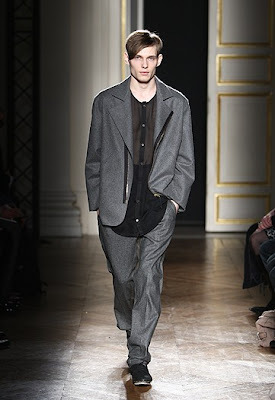 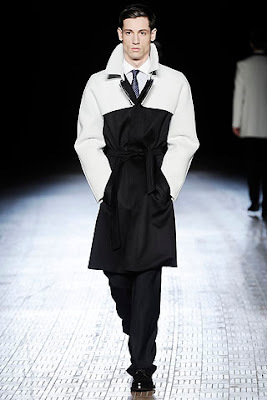 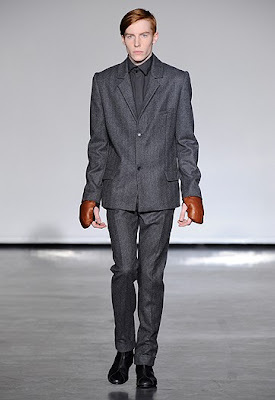 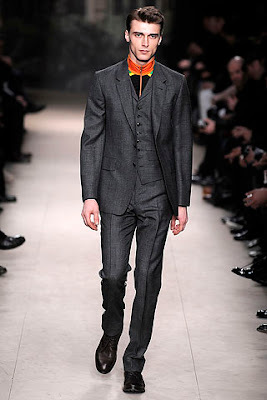 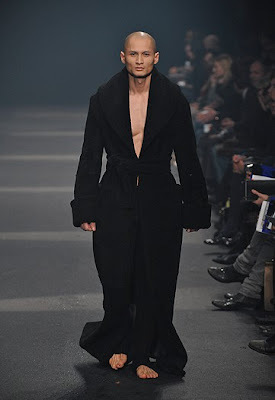 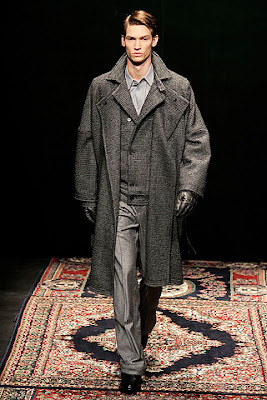 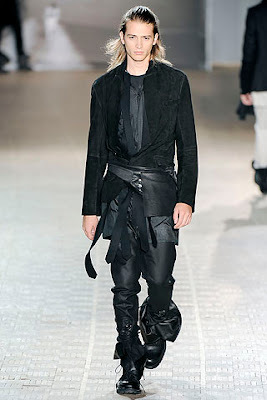 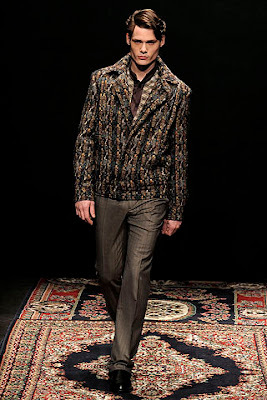 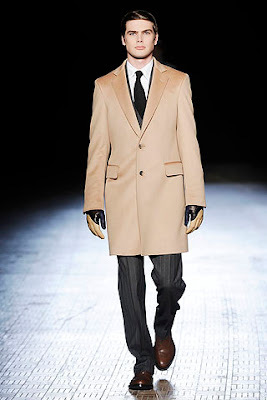 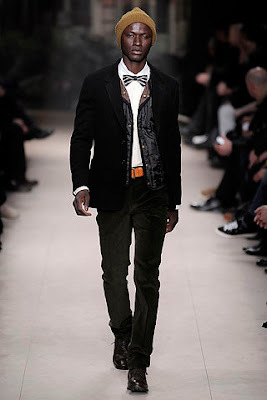 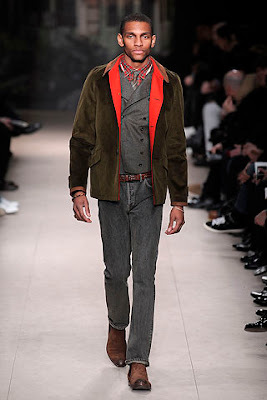 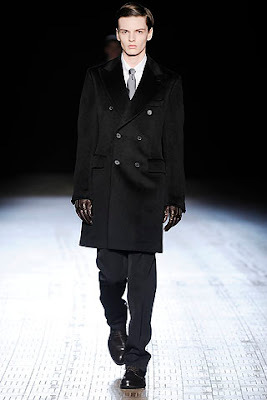 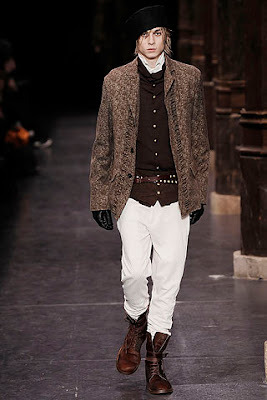 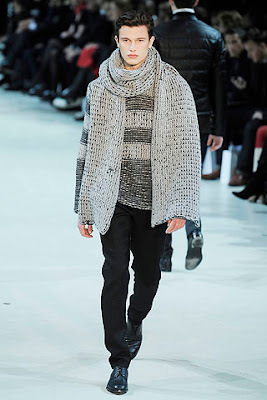 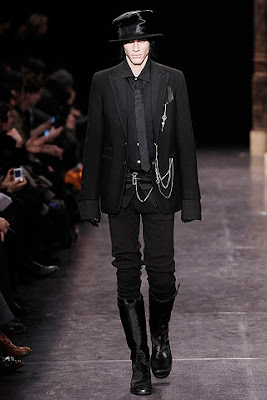 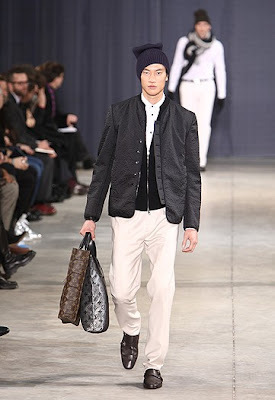 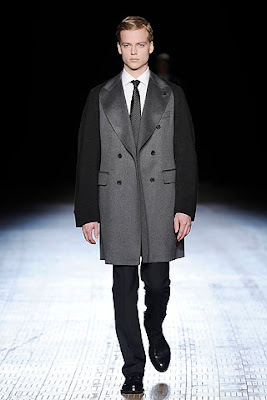 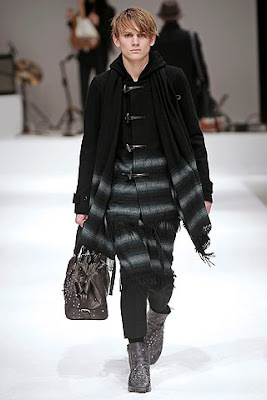 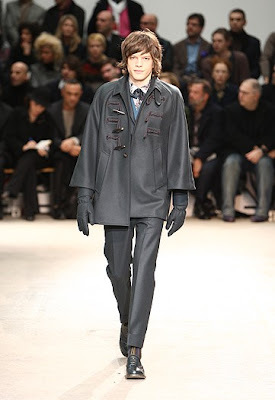 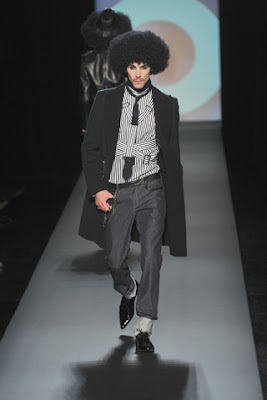 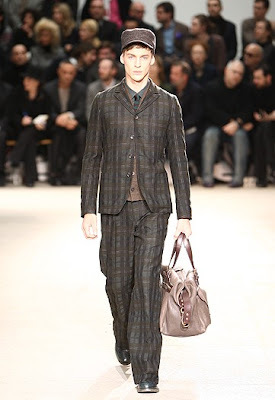 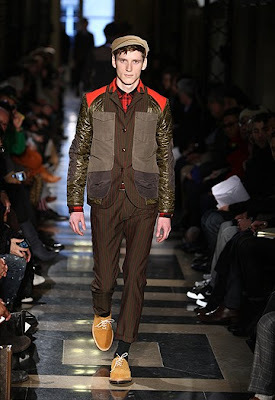 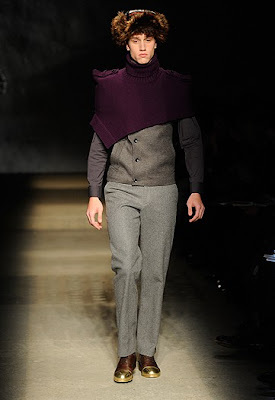 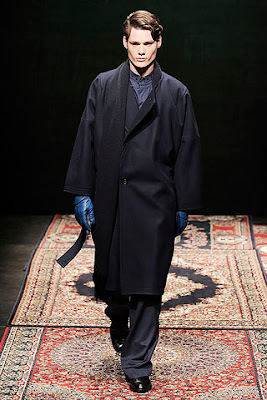 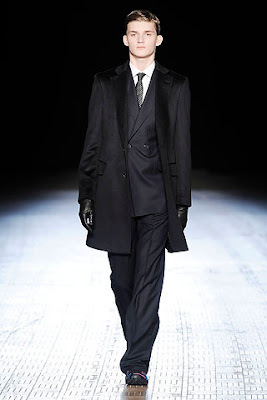 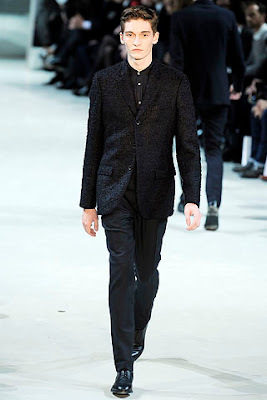 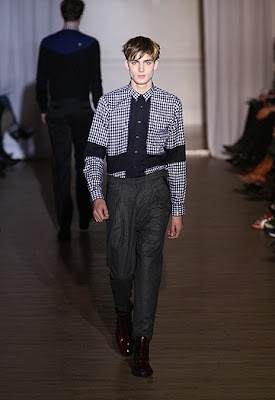 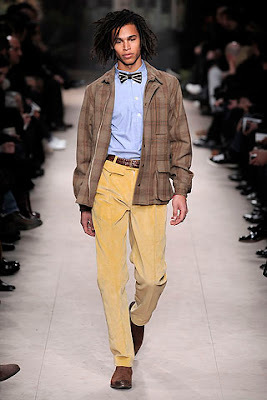 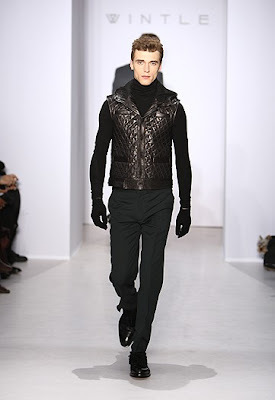 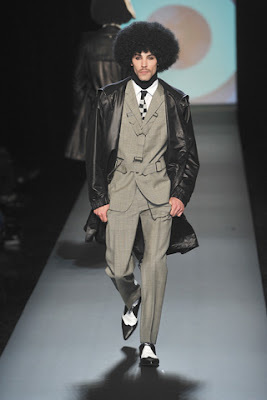 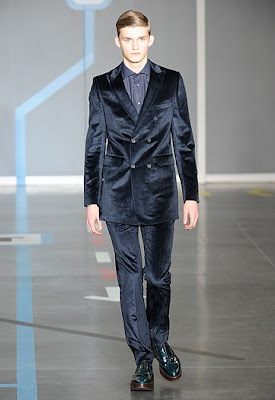 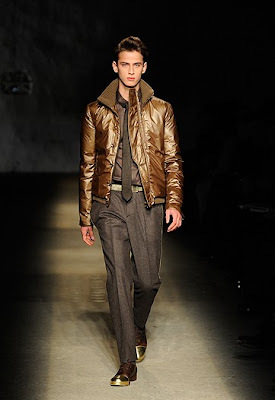 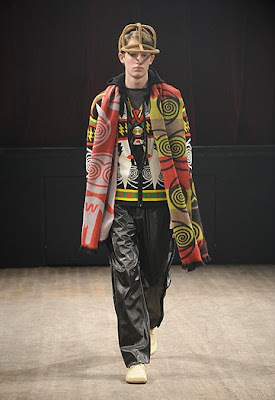 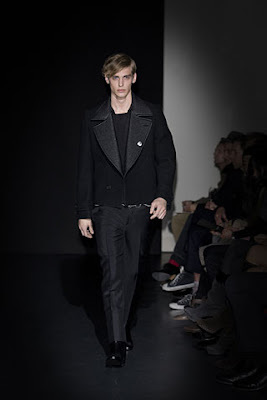 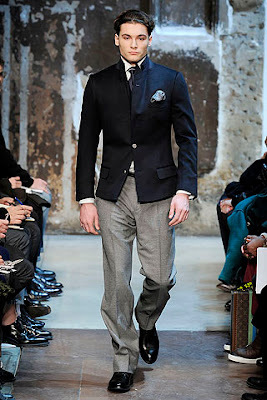 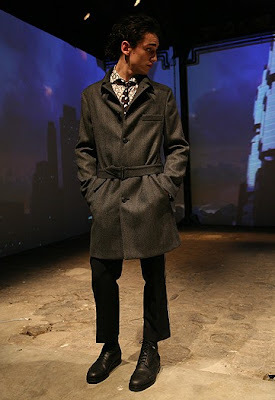 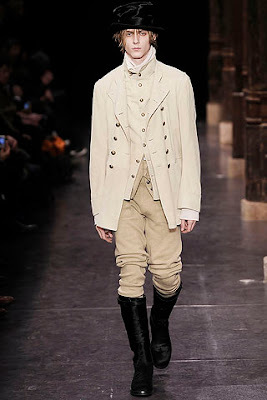 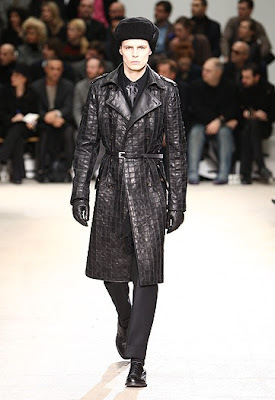 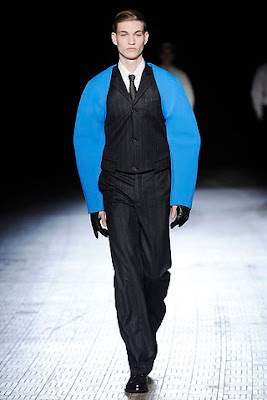 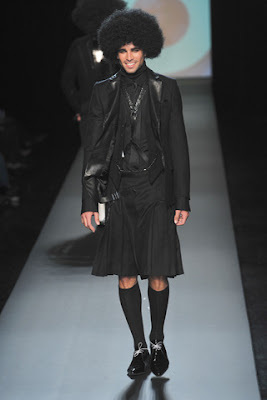 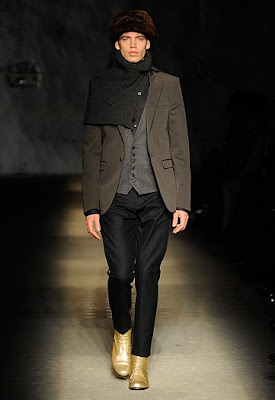 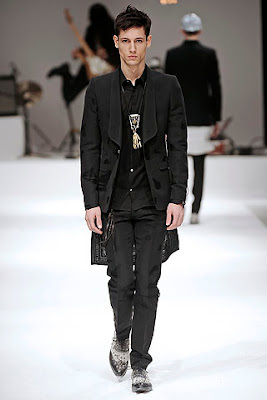 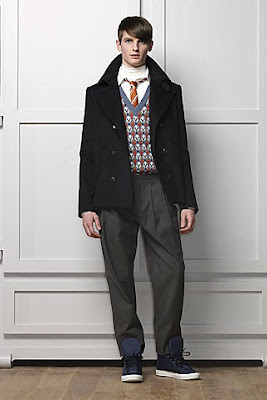 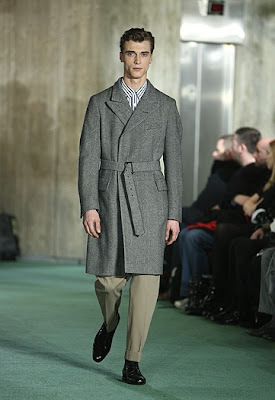 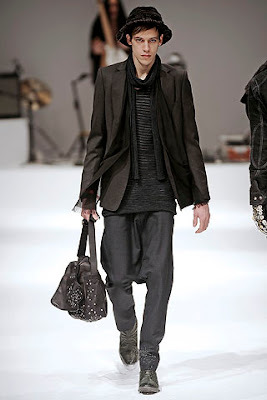 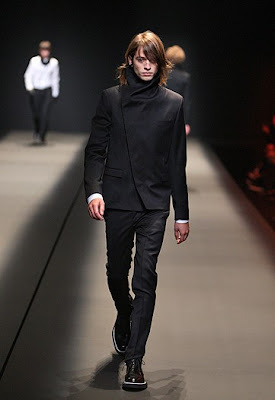 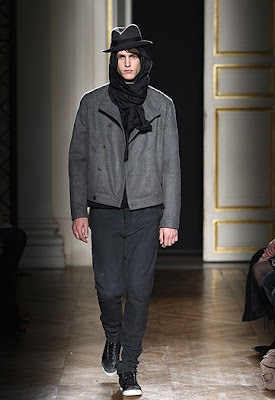 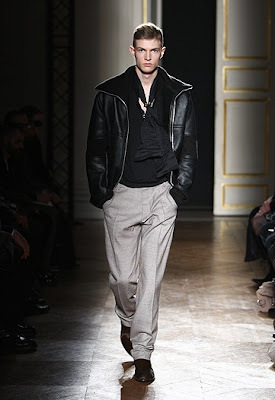 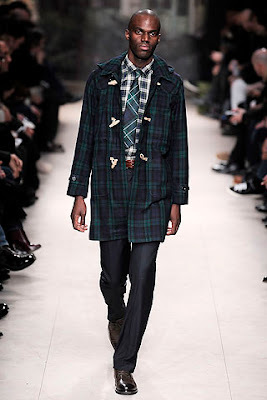 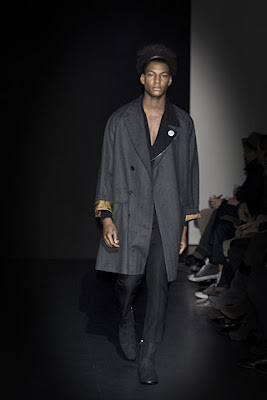 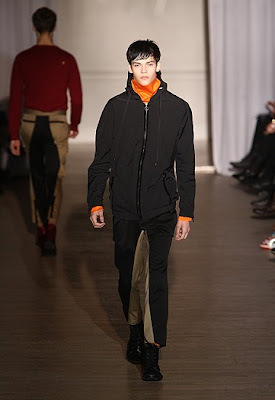 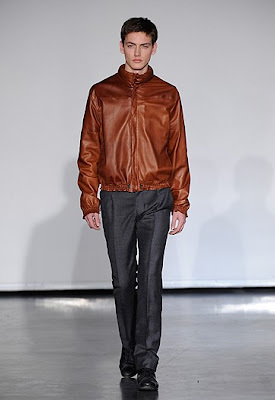 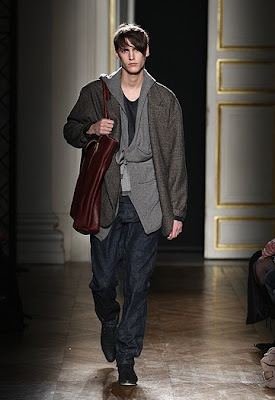 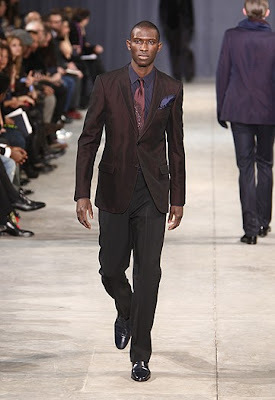 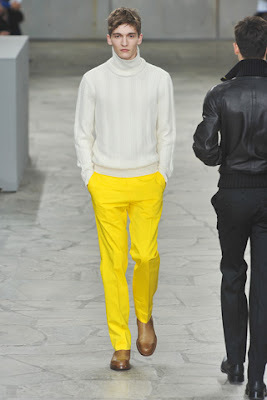 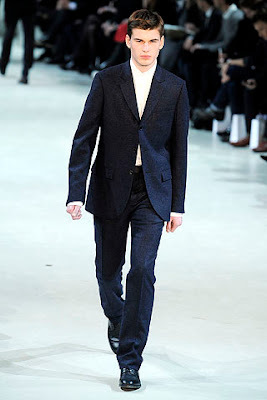 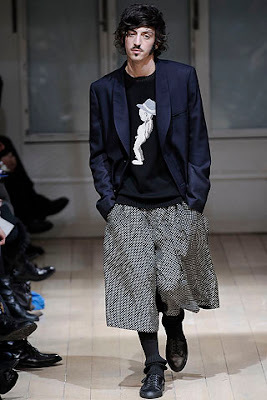 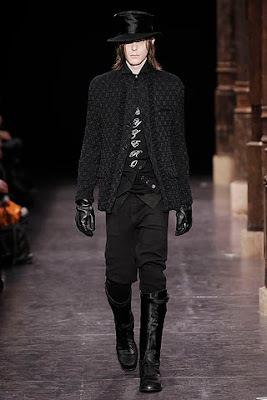 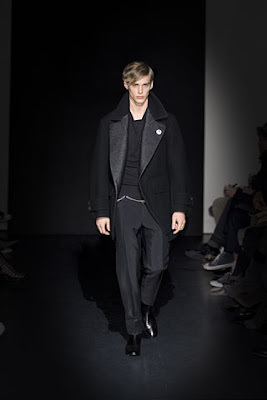 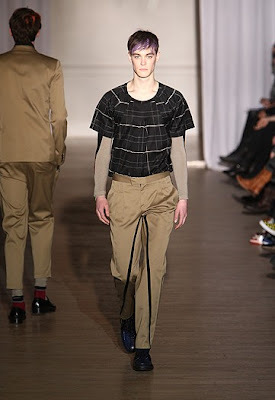 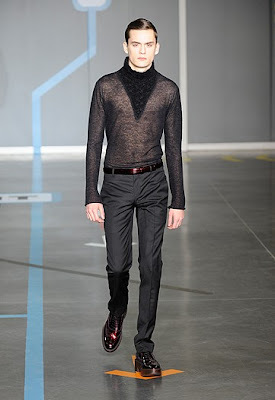 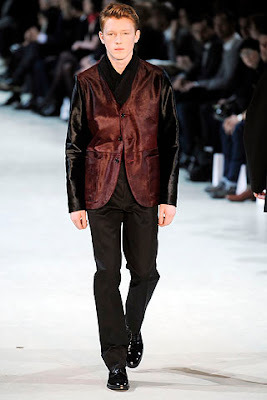 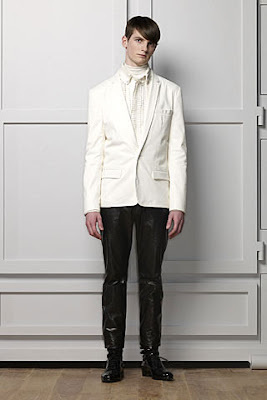 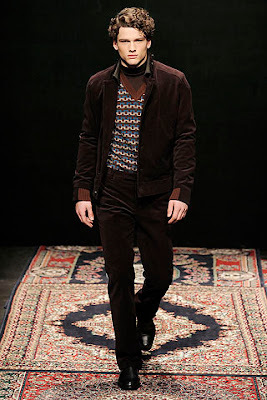 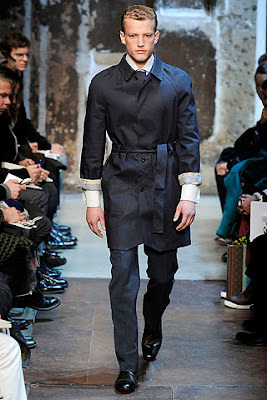 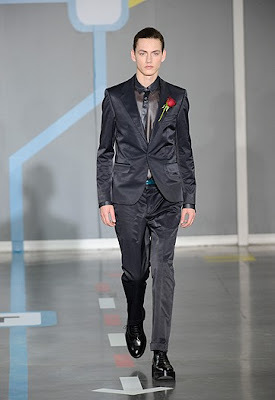 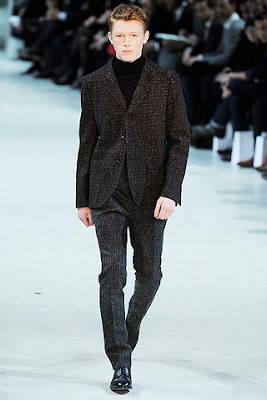 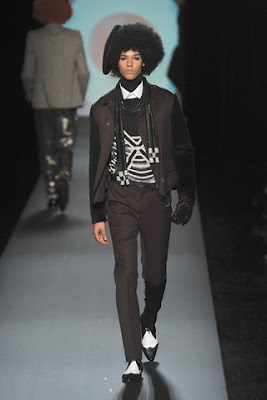 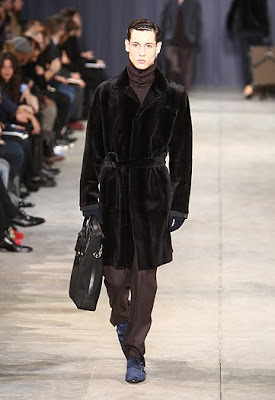 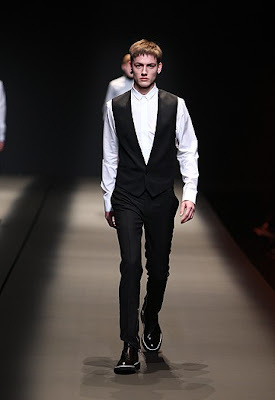 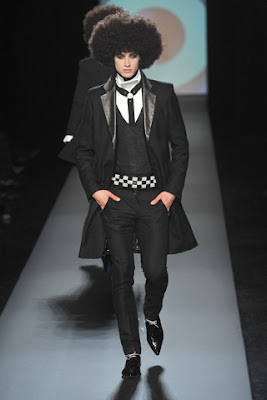 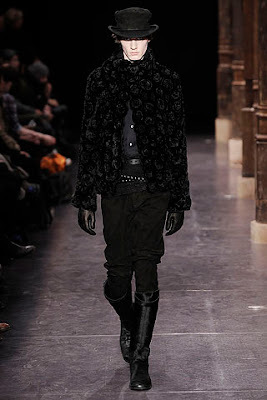 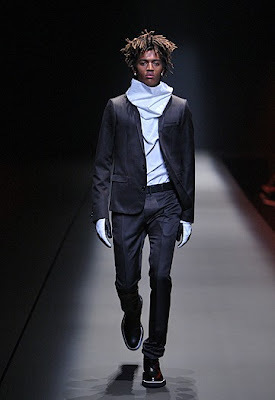 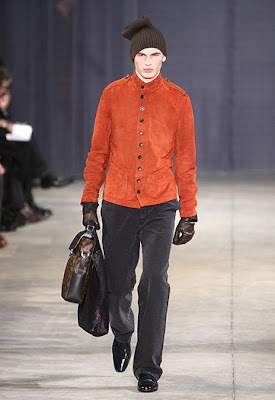 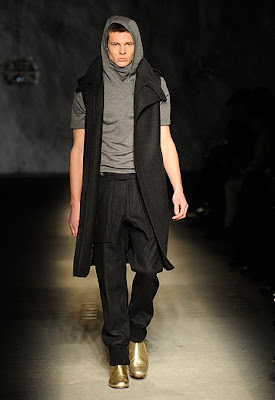 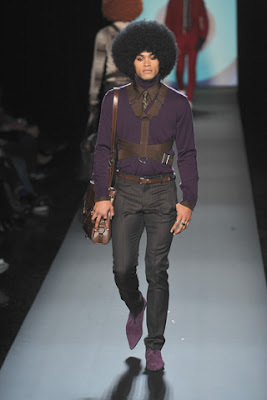 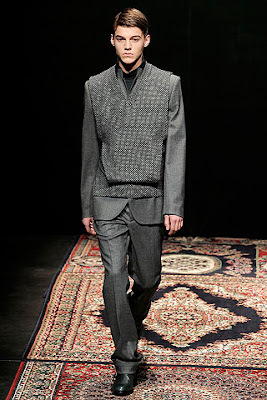 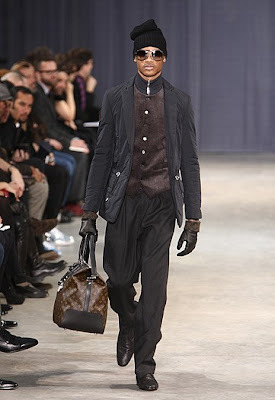 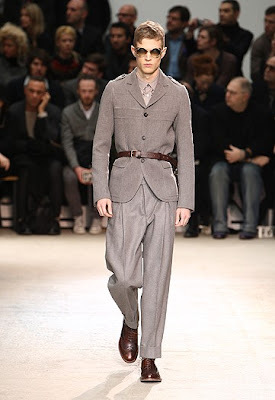 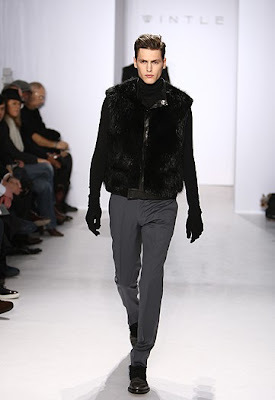 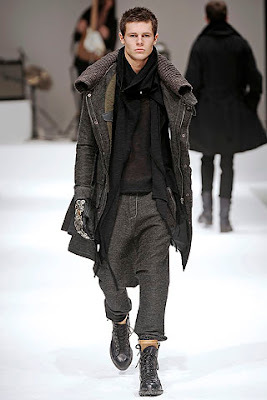 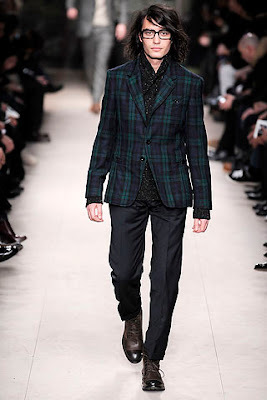 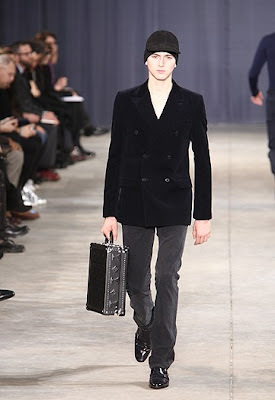 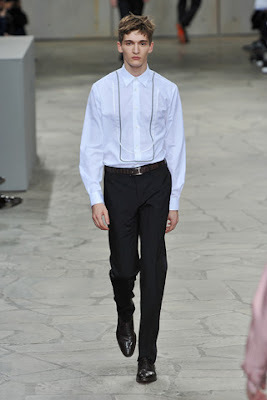 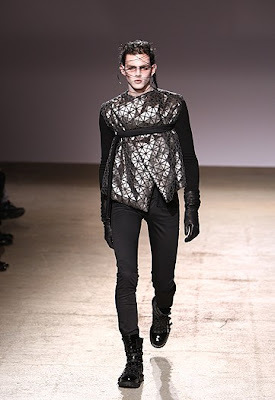 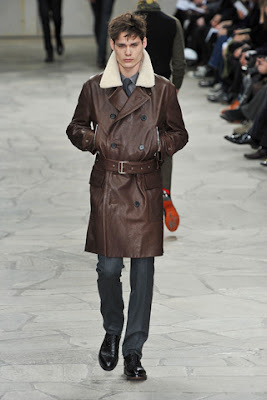 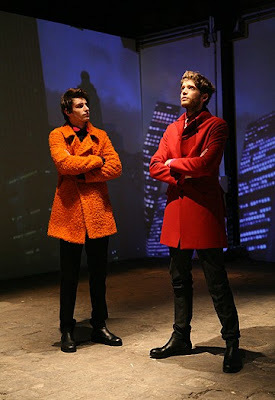 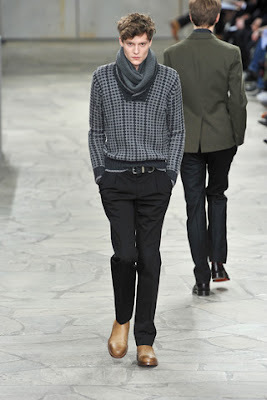 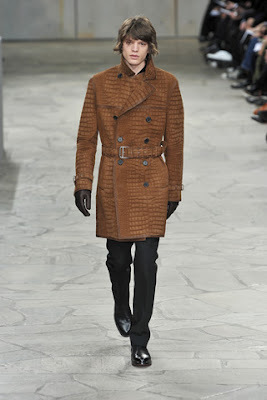 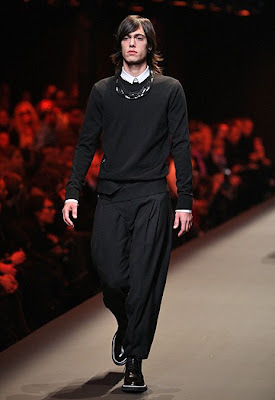 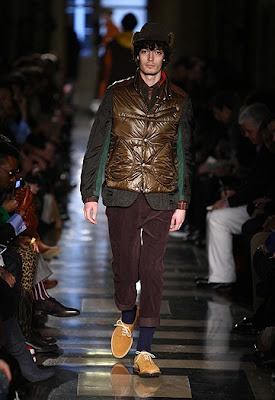 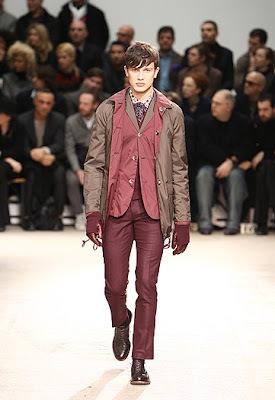 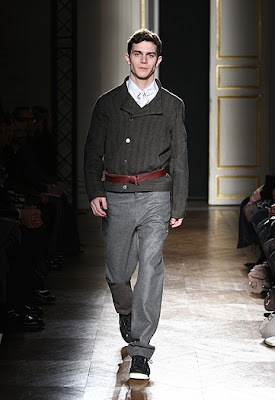 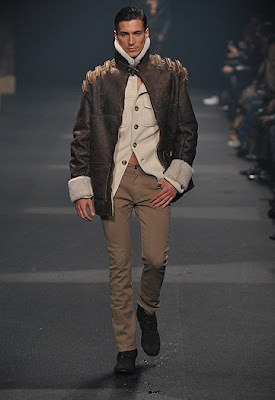 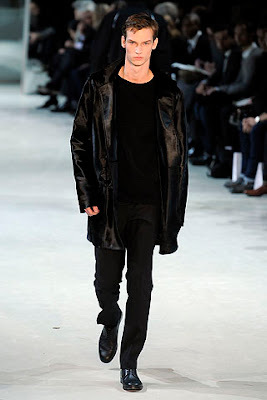 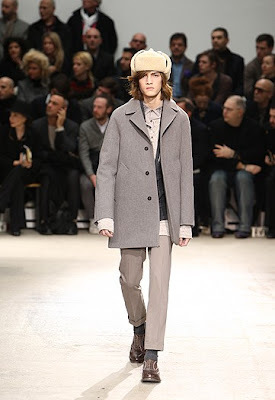 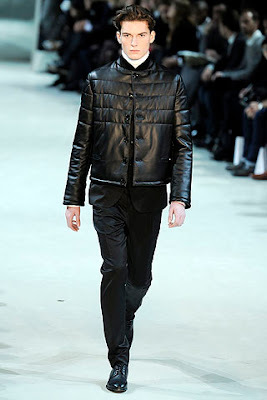 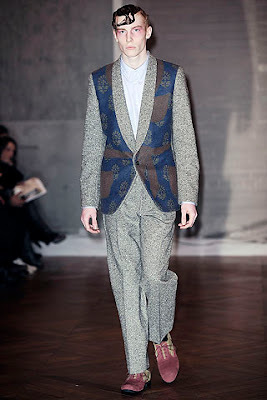 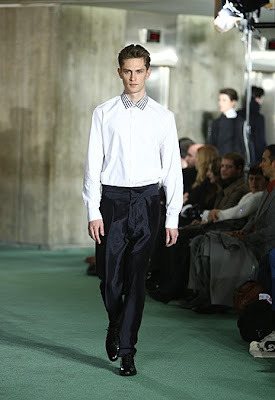 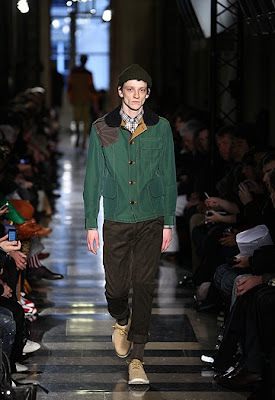 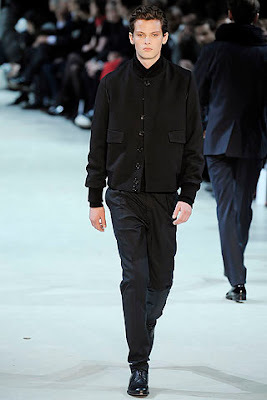 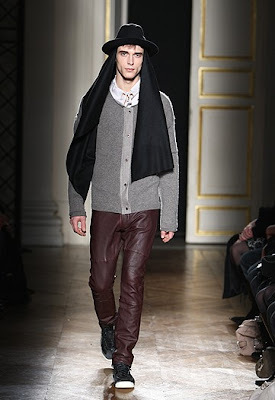 5) Lanvin – Lanvin showed a very impressive men's collection. 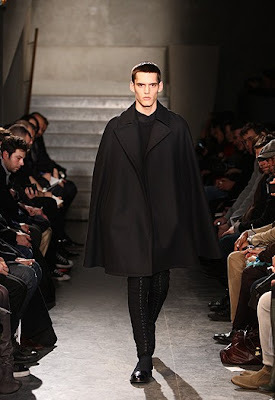 I love the modern silhouettes. 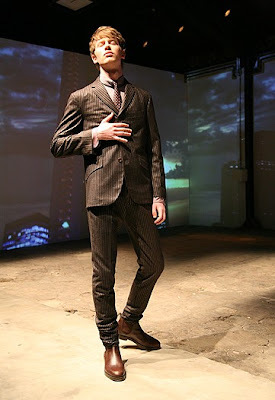 Laser-cut suits from jersey or trousers with the ease of track pants. 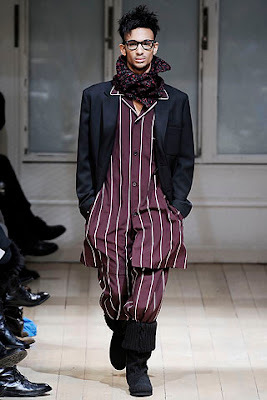 OK now I'm interested in hearing your top 5 shows in Paris. 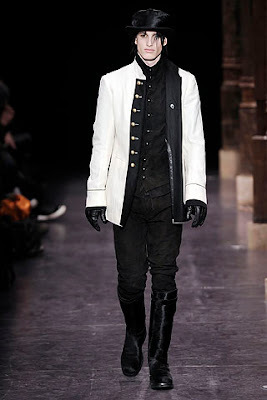 Vilain Garçon Winter Sales !